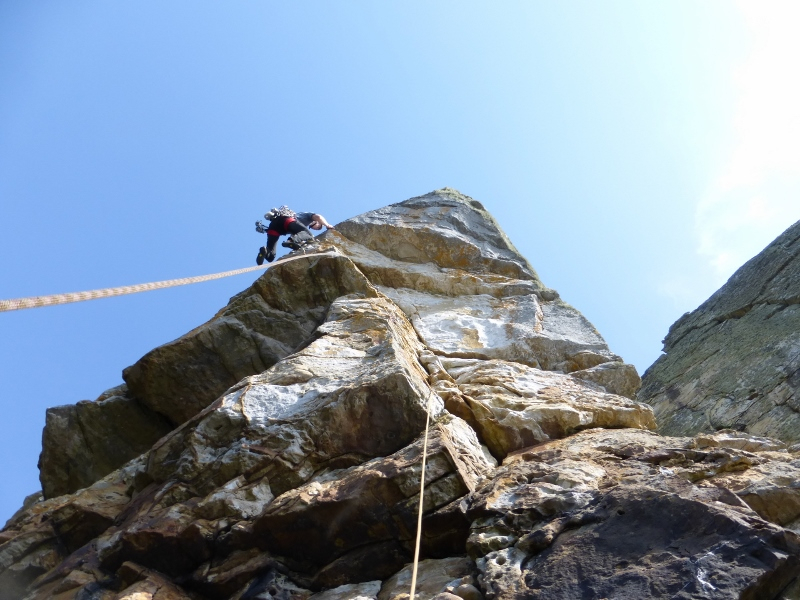 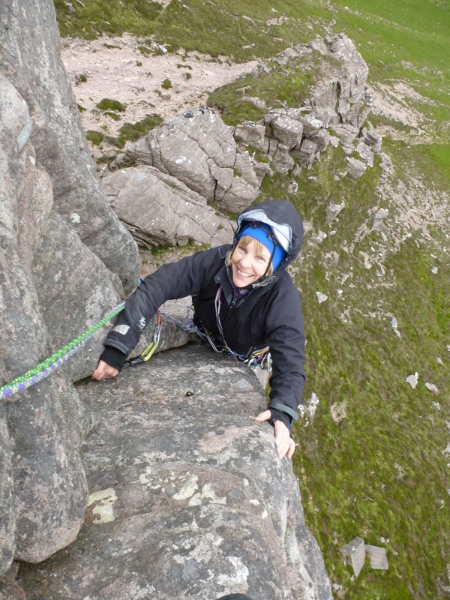 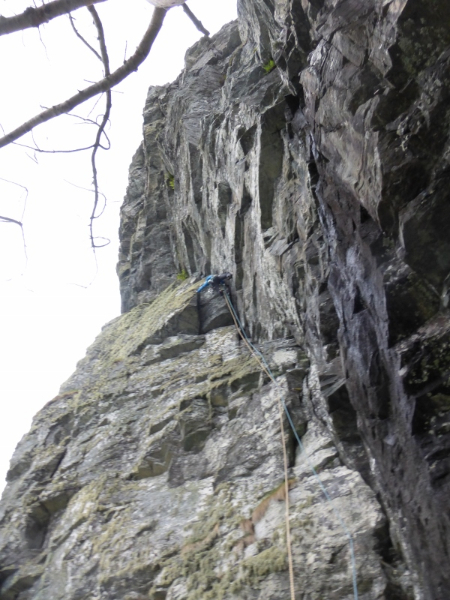 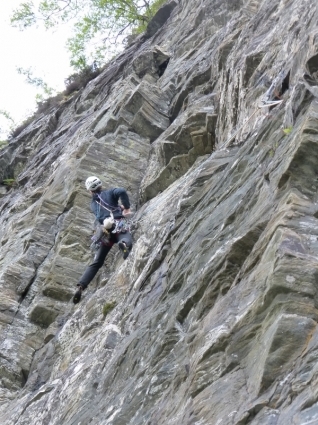 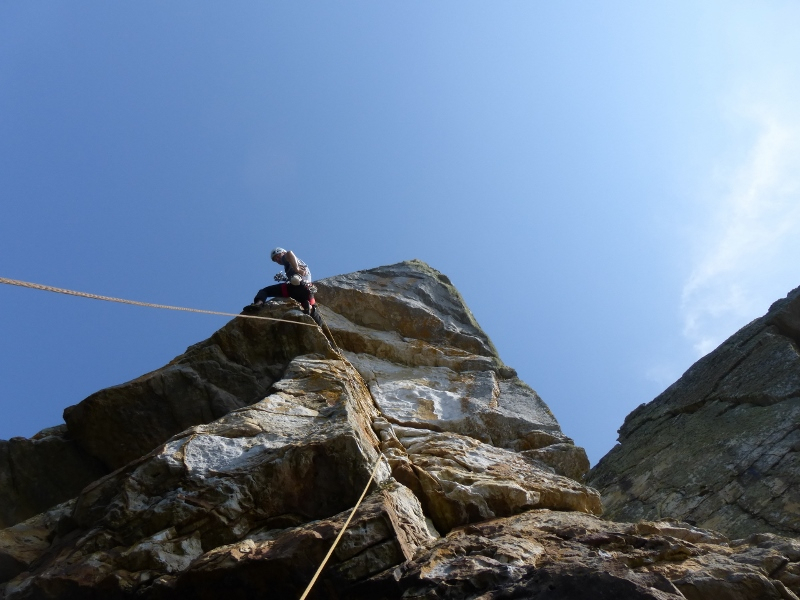 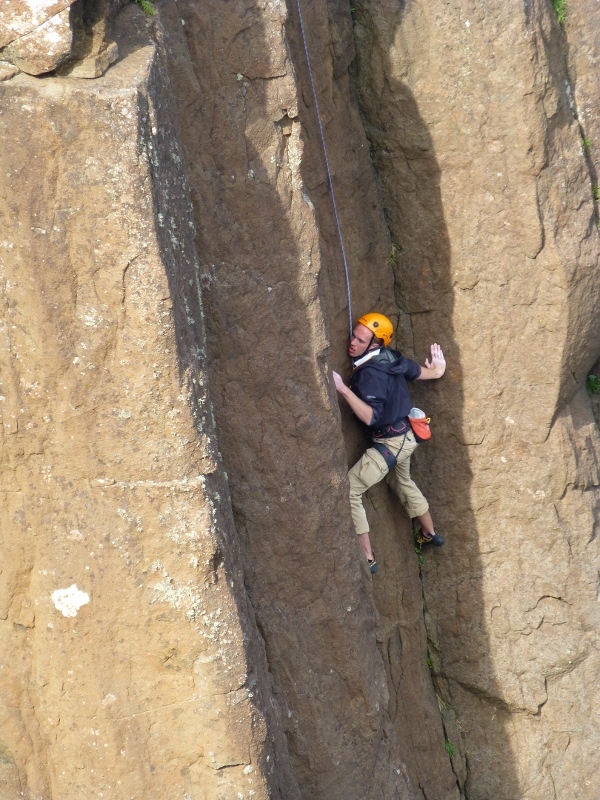 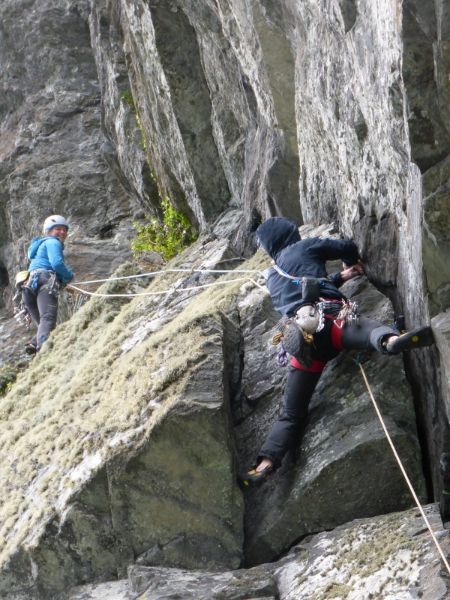 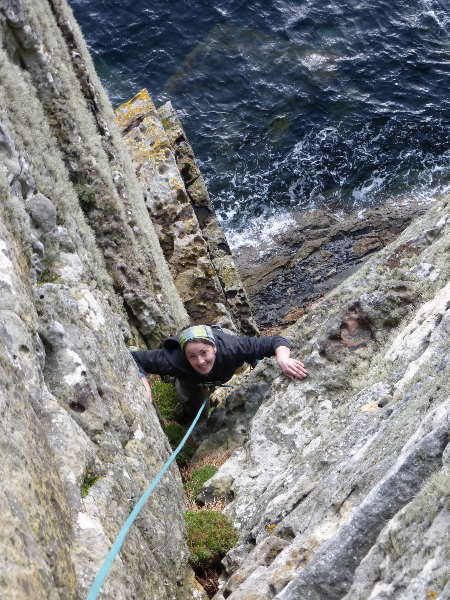 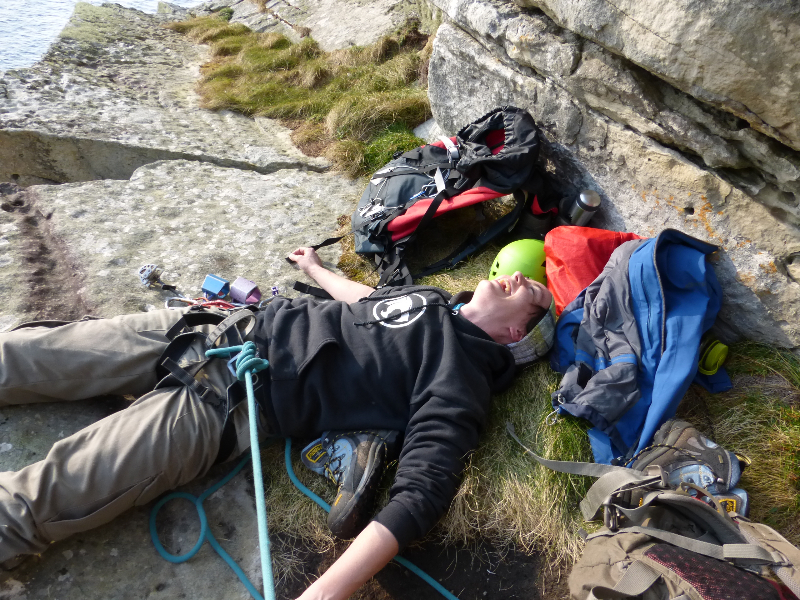 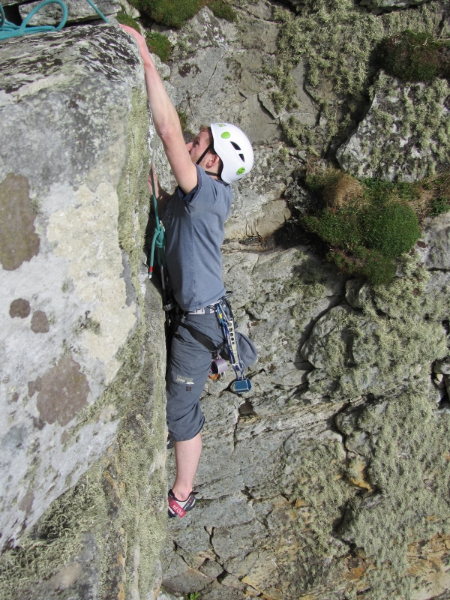 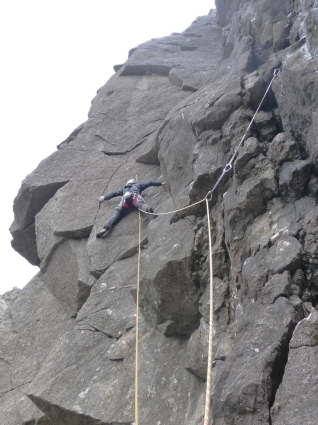 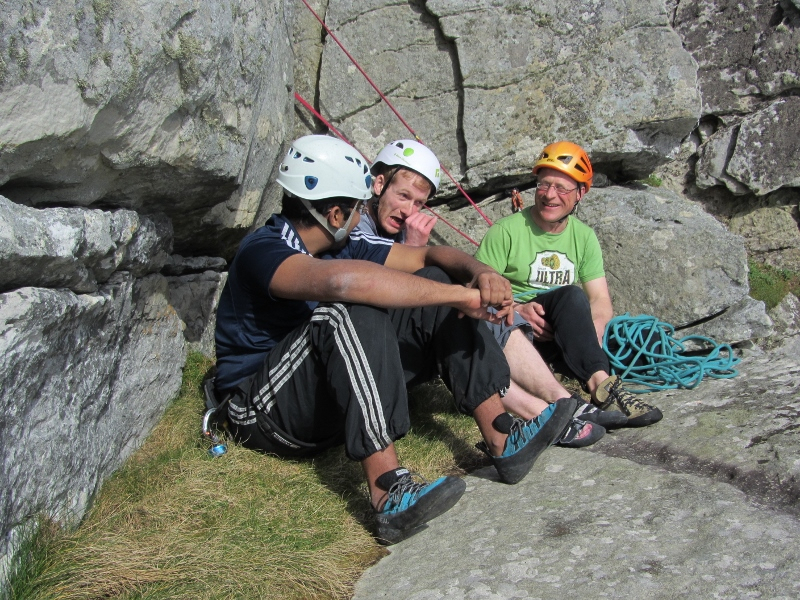 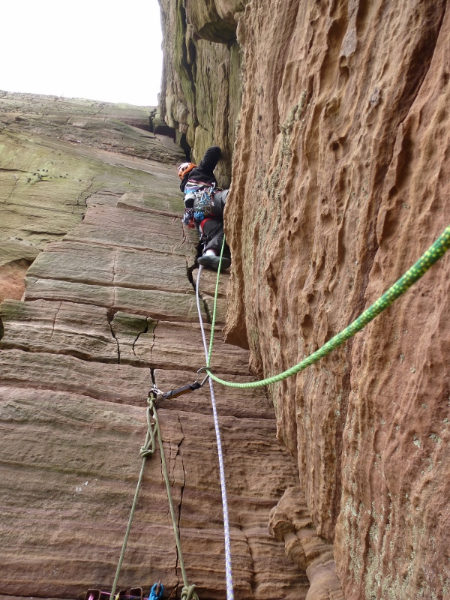 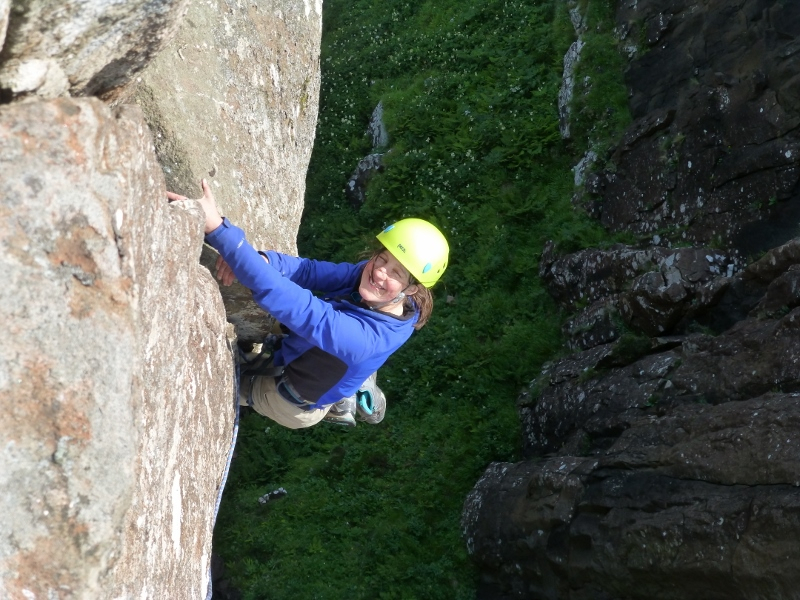 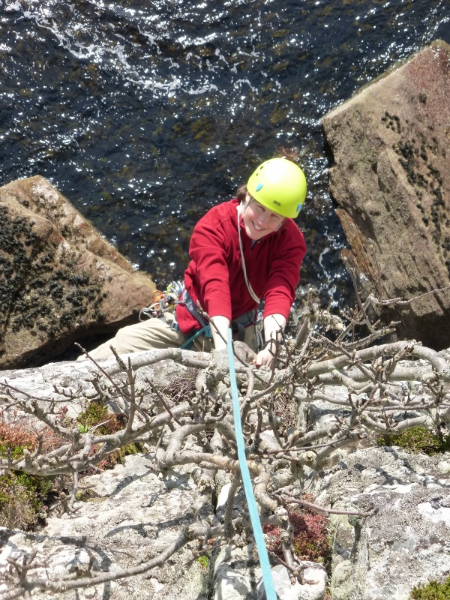 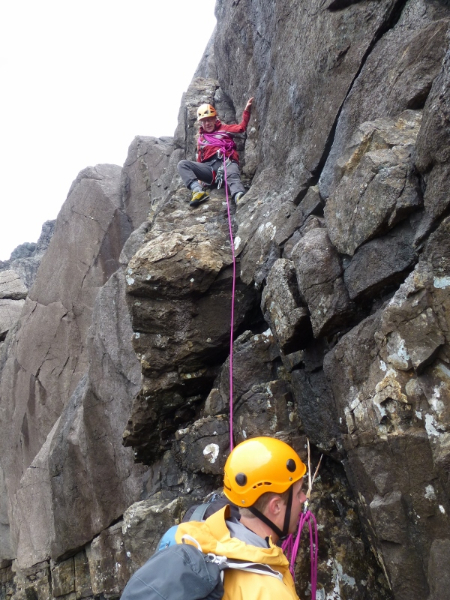 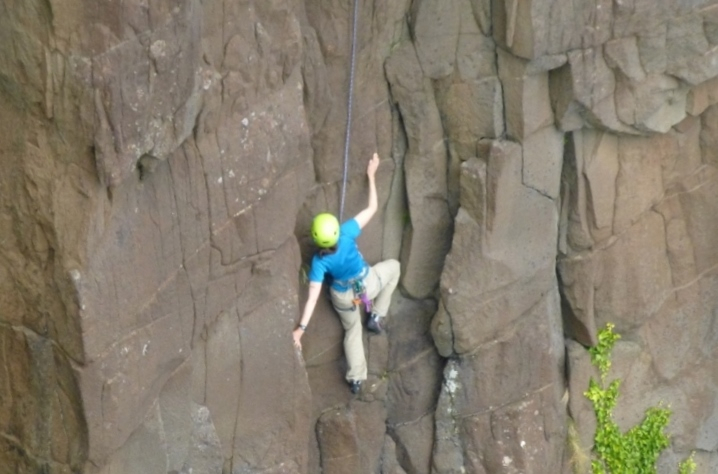 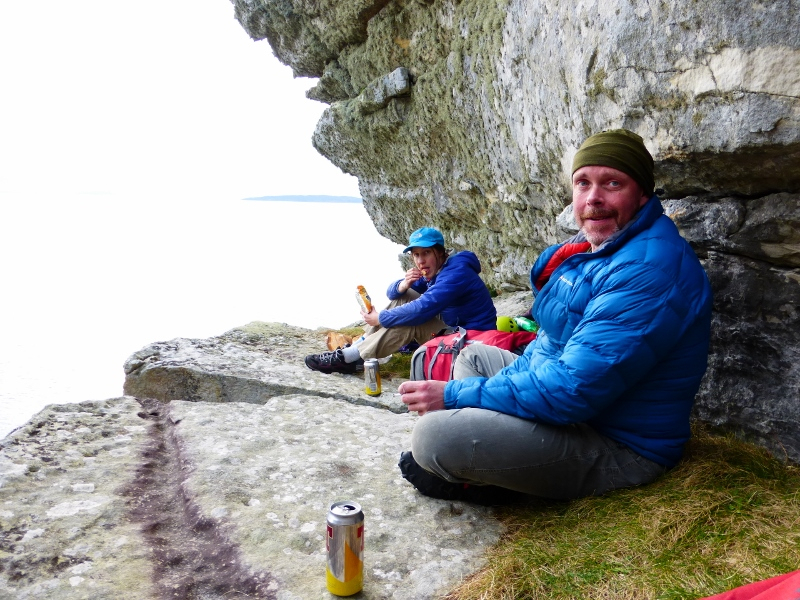 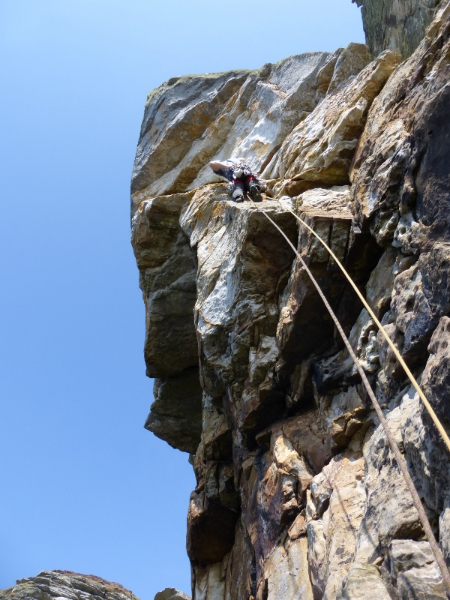 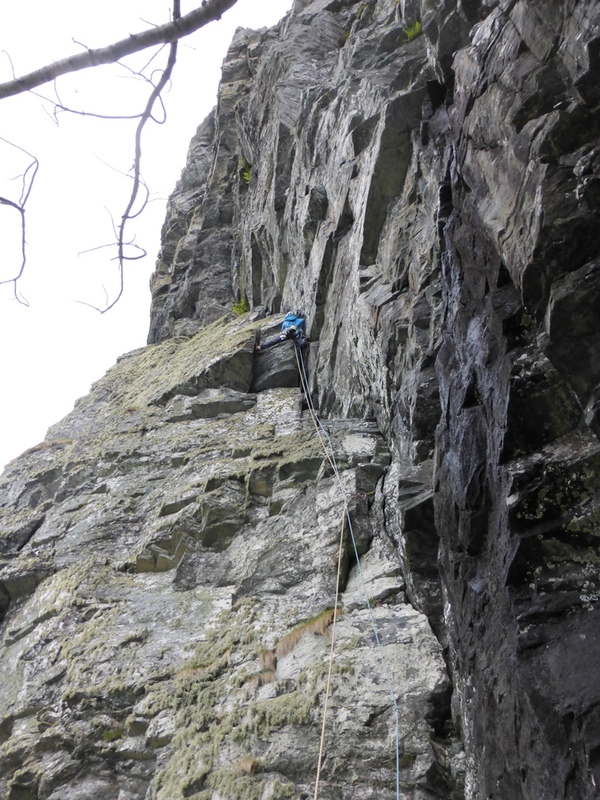 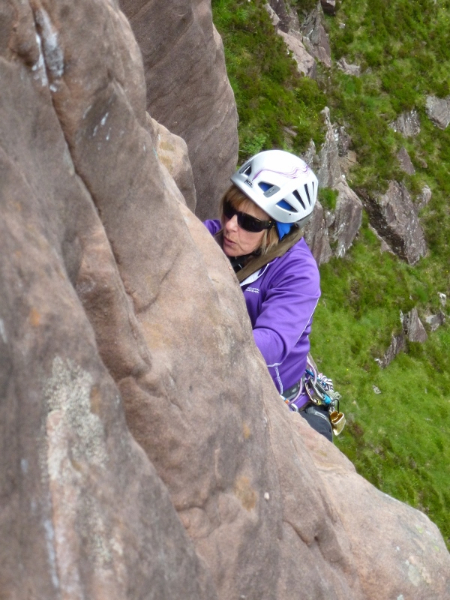 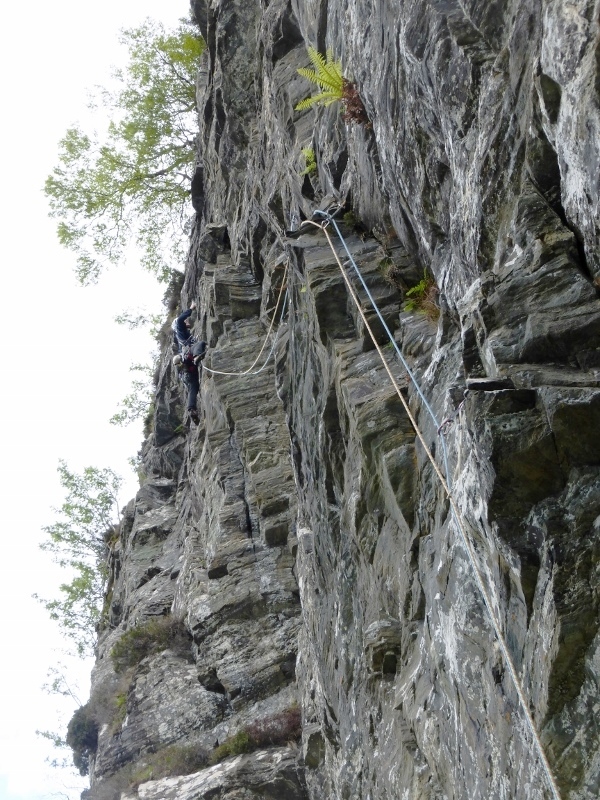 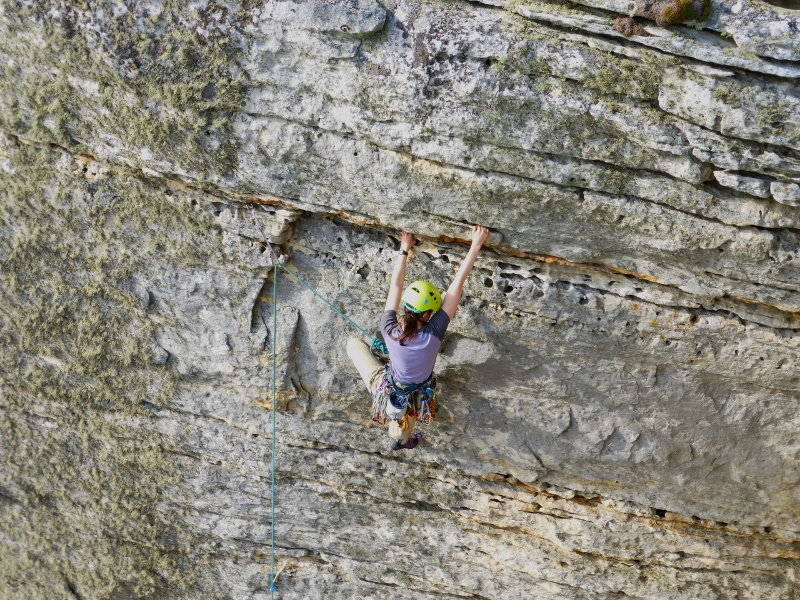 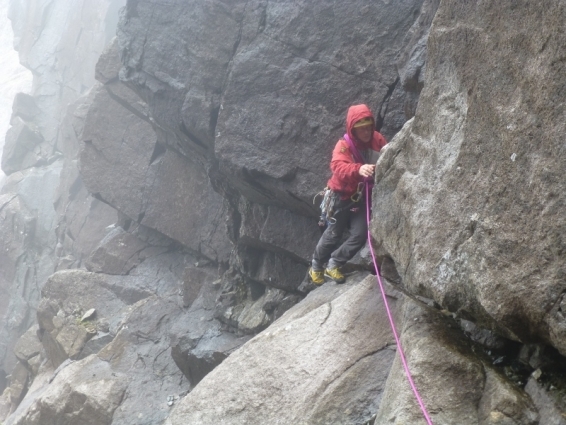 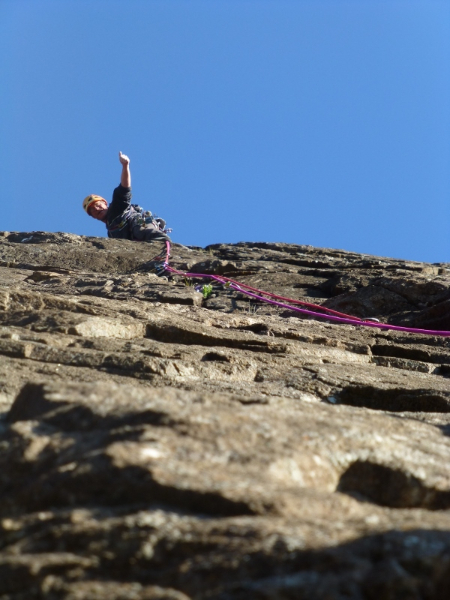 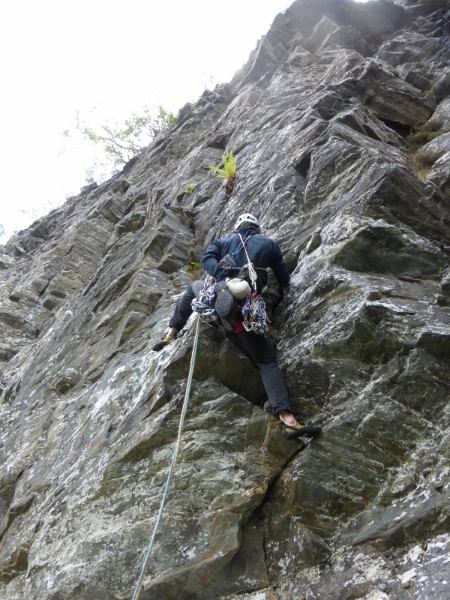 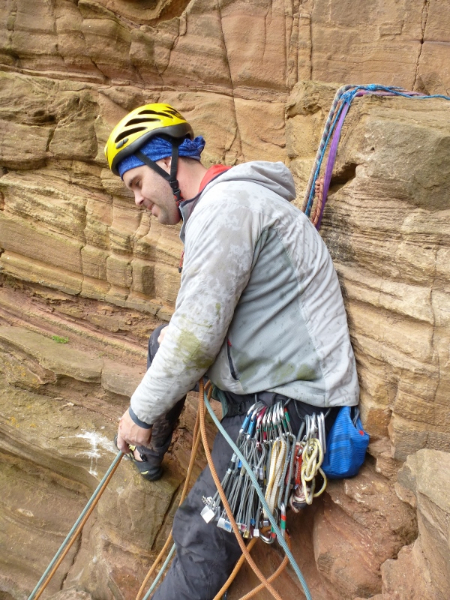 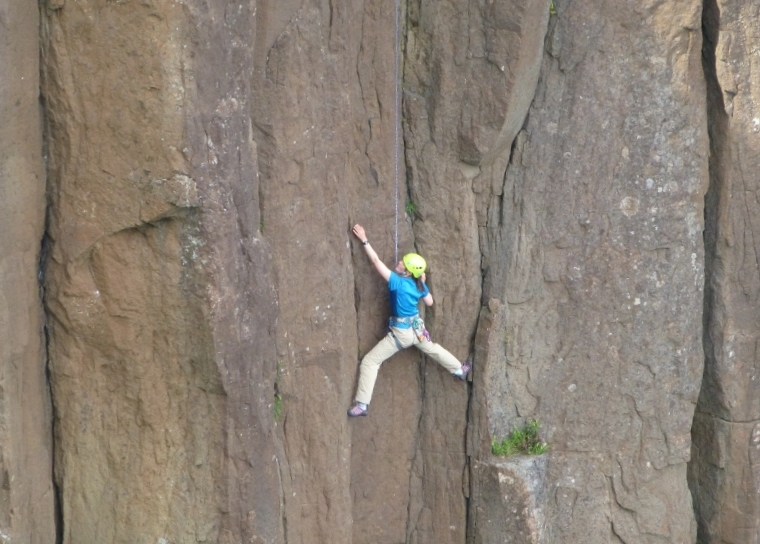 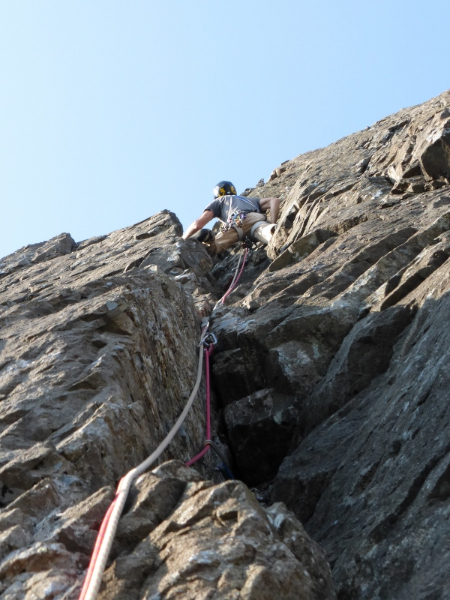 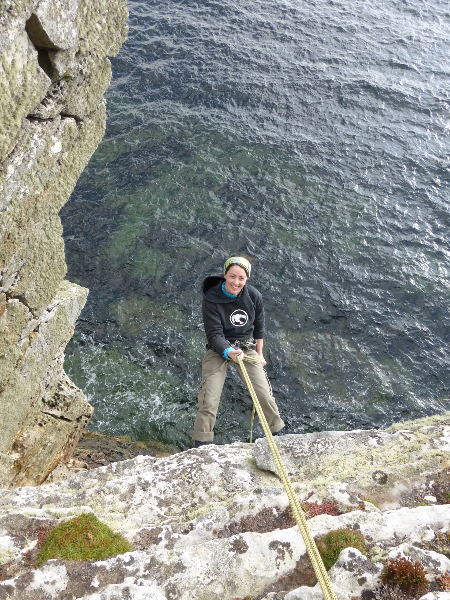 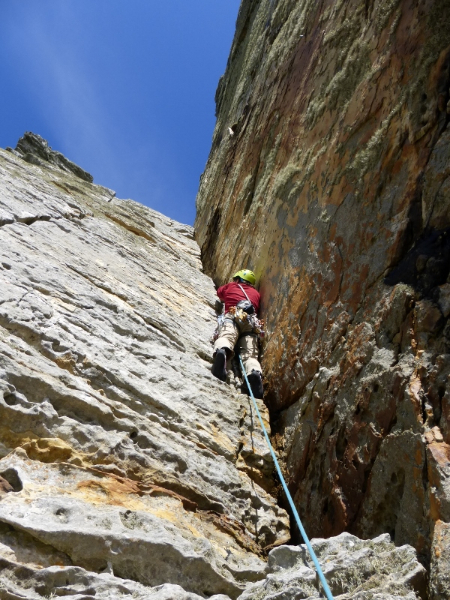 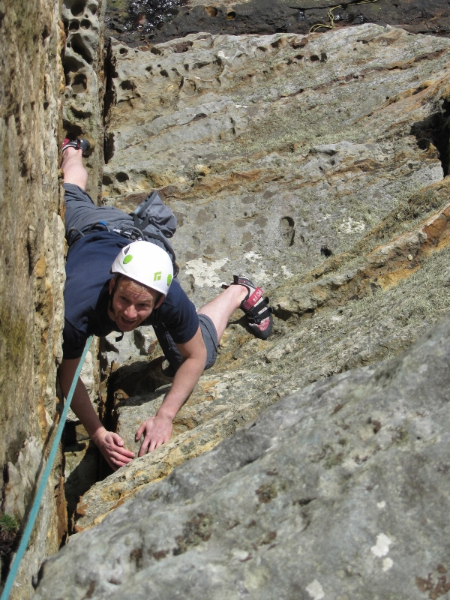 A great few days of rock climbing recently with my good friend Lucy back again to add any keenness I may be lacking! 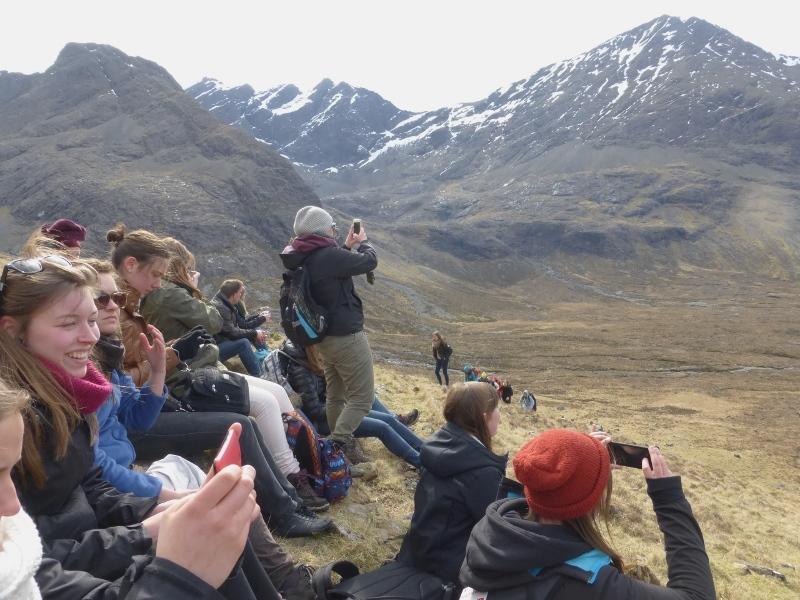 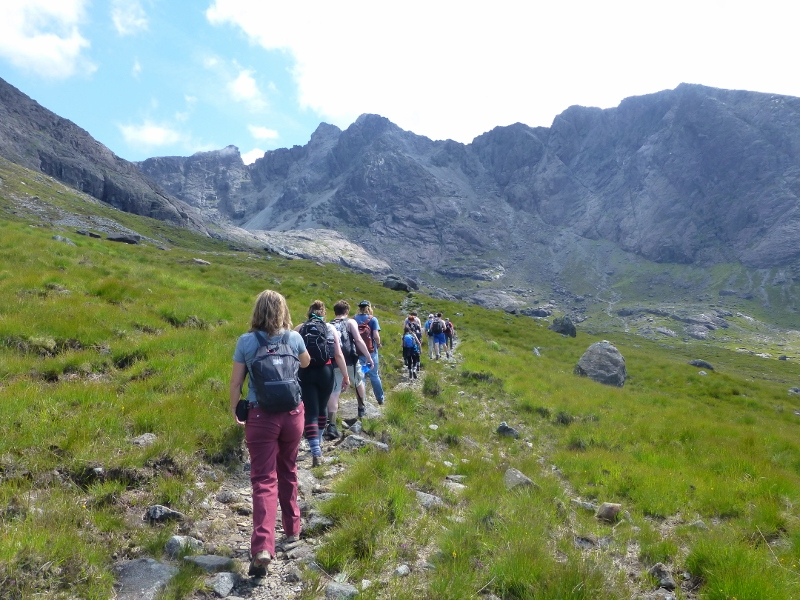 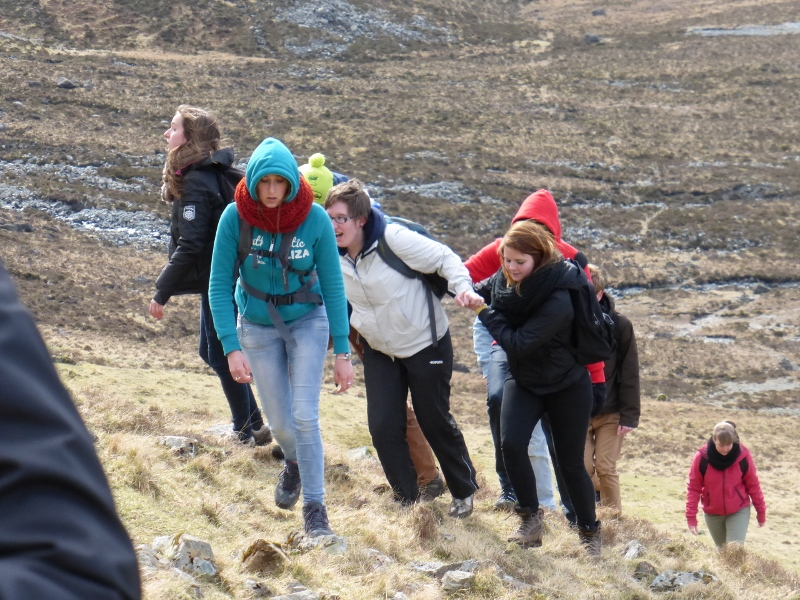 Thursday started with a sunny walk up into Coire Lagan with the students of Landmark College. 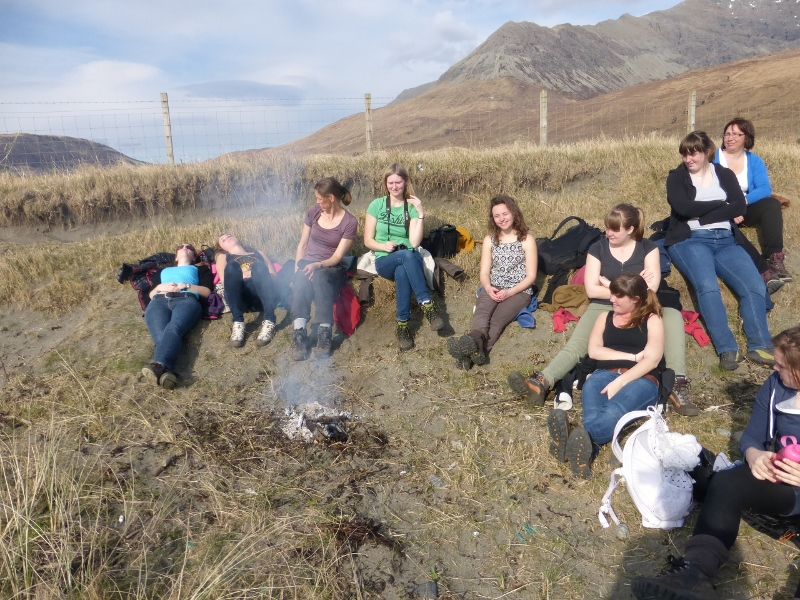 After cooling the feet back in Loch Brittle we set back off up and one of the hottest walk-ins that I can ever remember. The target was a direct finish to Techno Snob– that Malcy & I climbed in 2012. 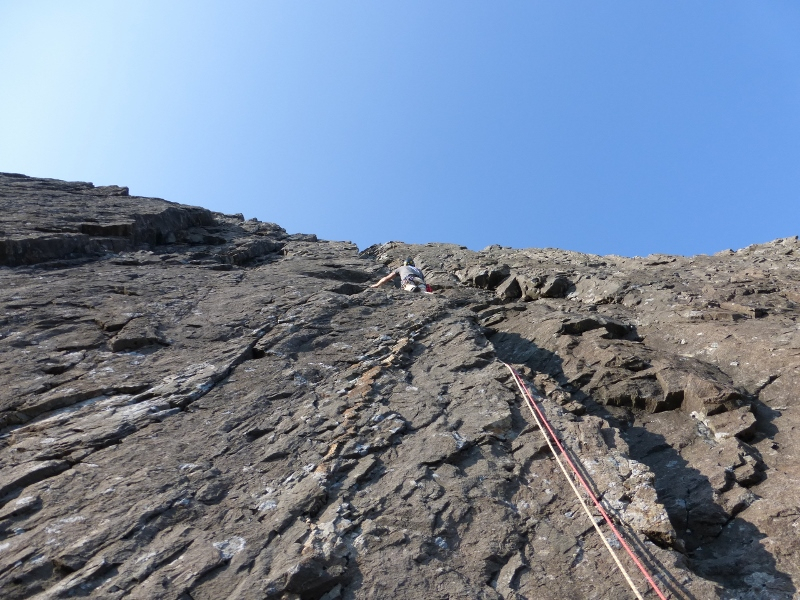 All the effort was worthwhile as we were rewarded with an evening of climbing on glorious clean hot rock. 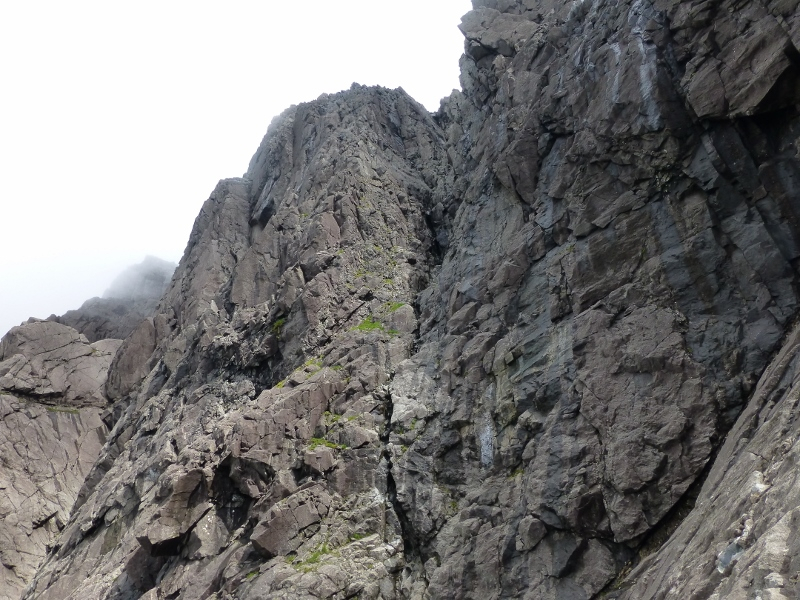 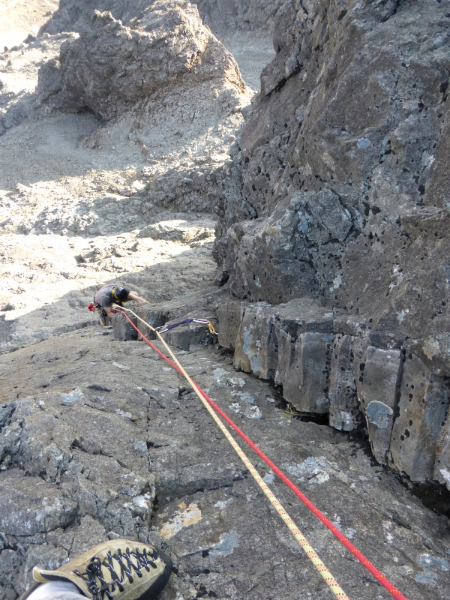 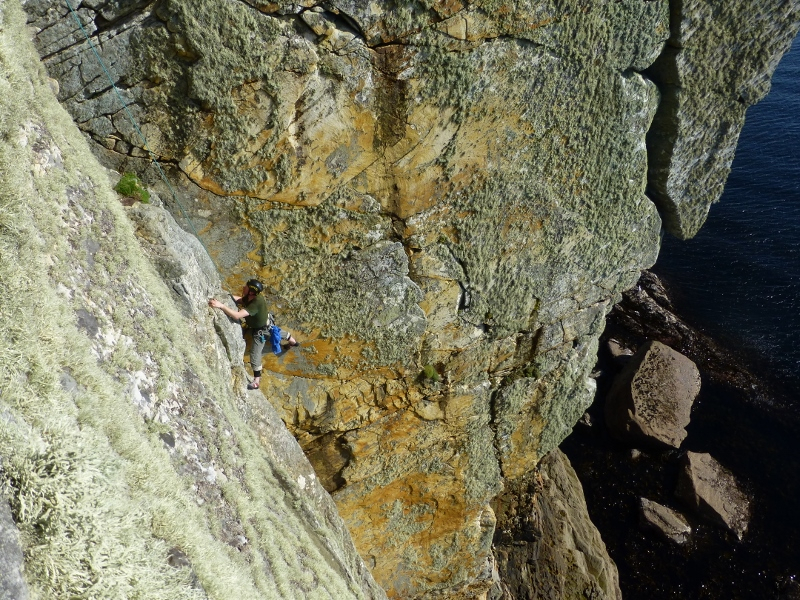 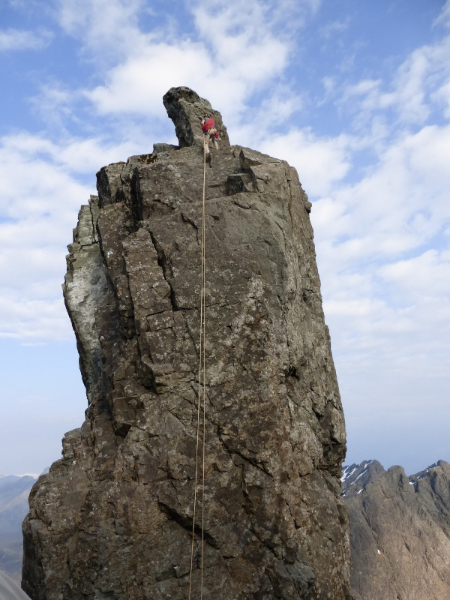 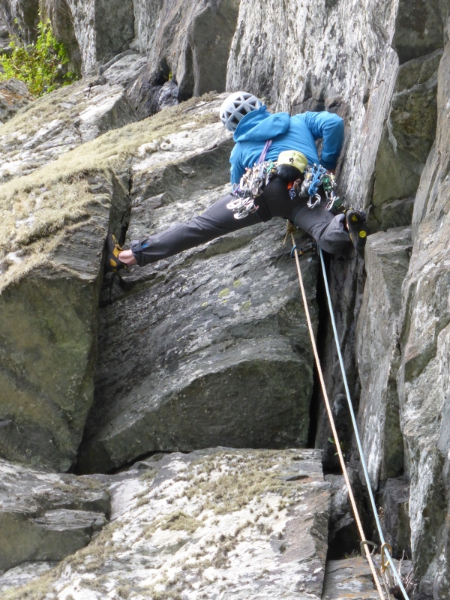 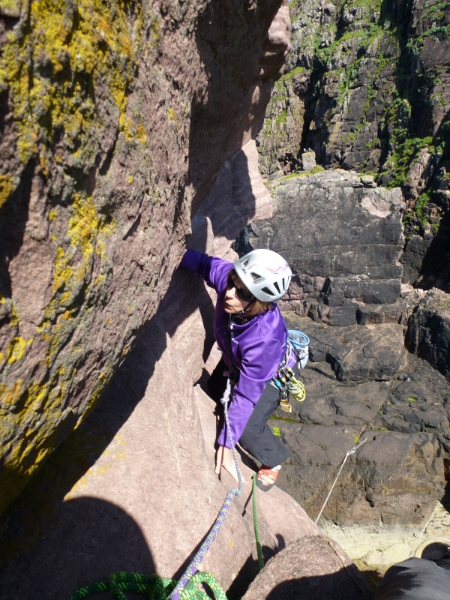 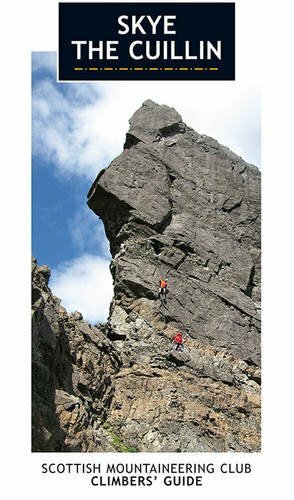 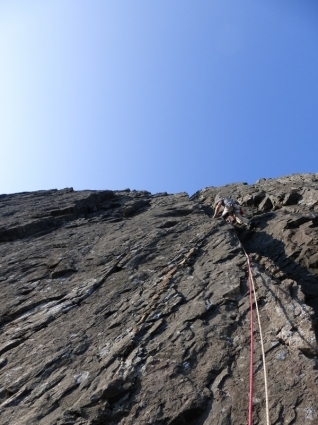 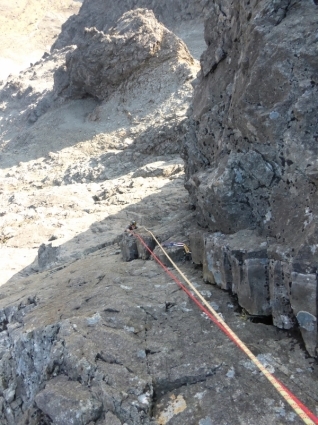 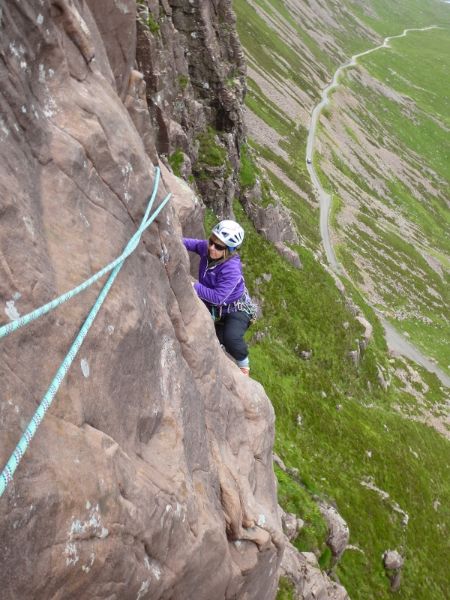 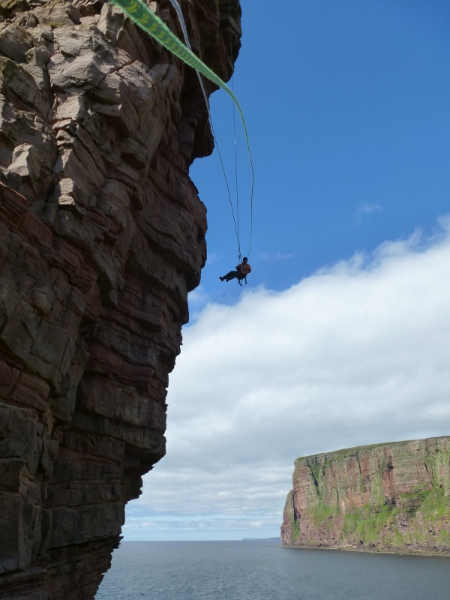 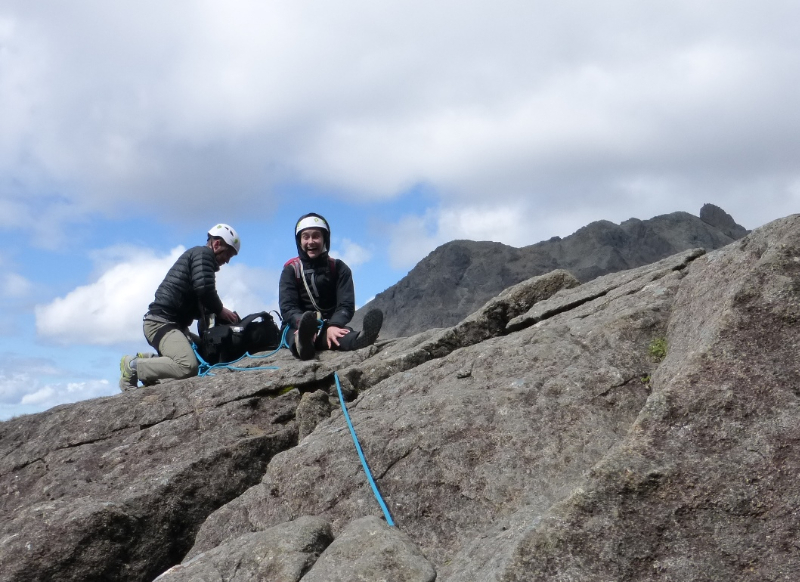 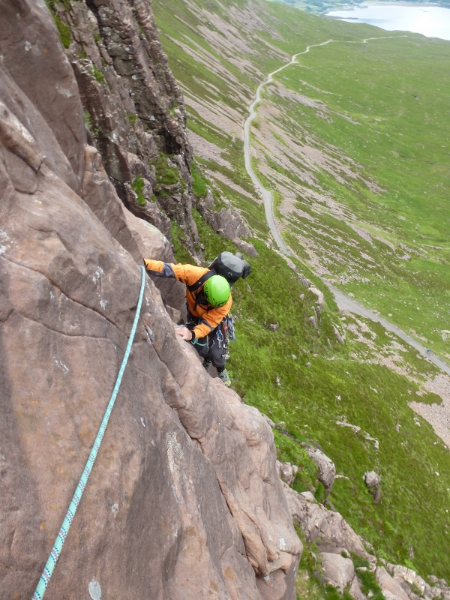 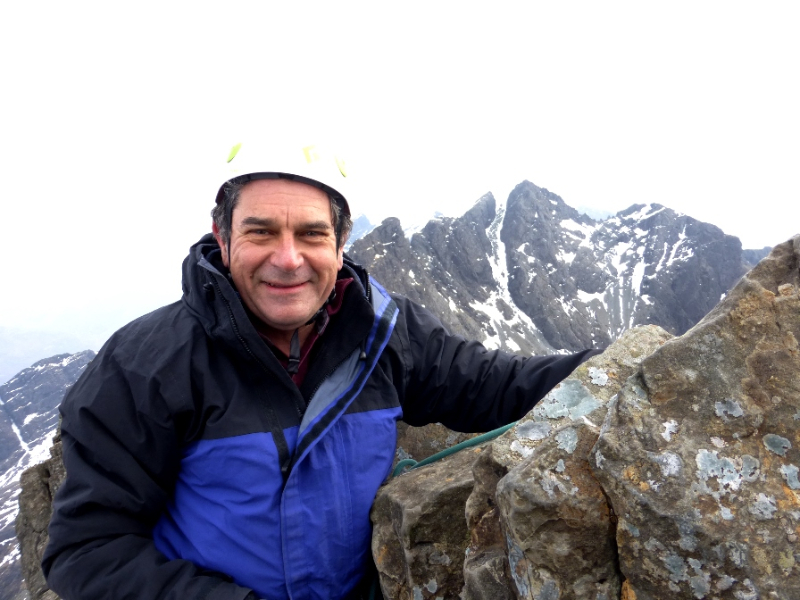 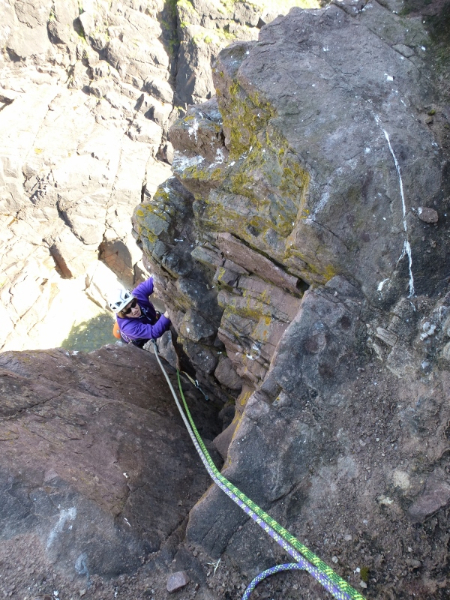 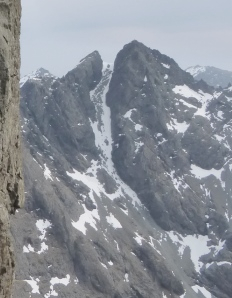 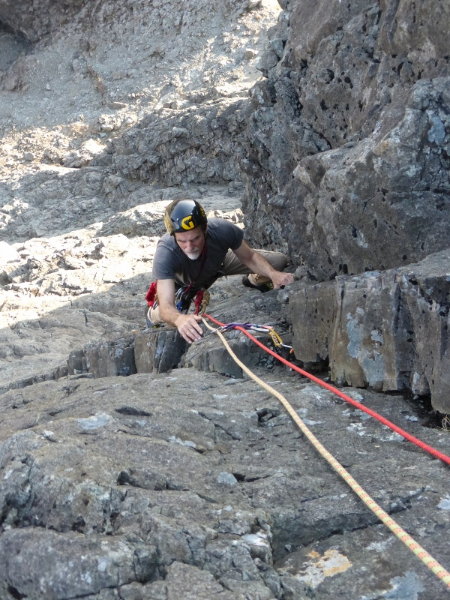 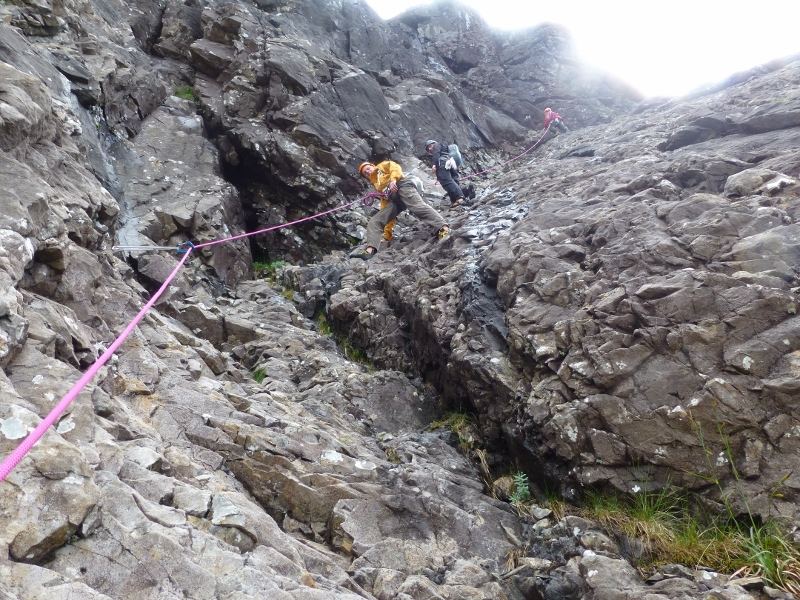 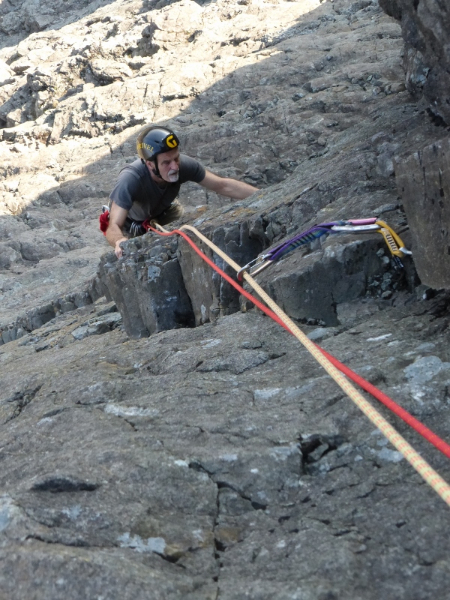 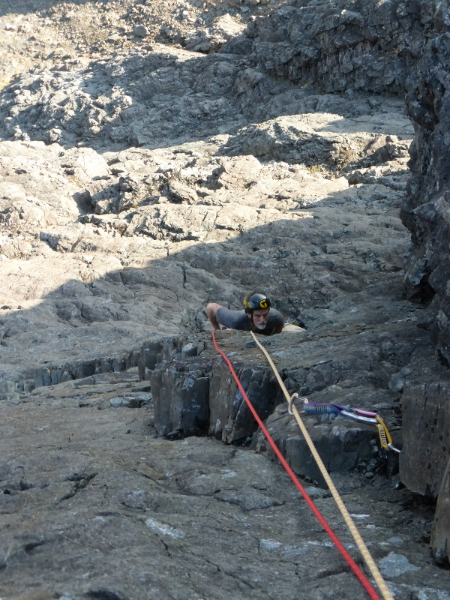 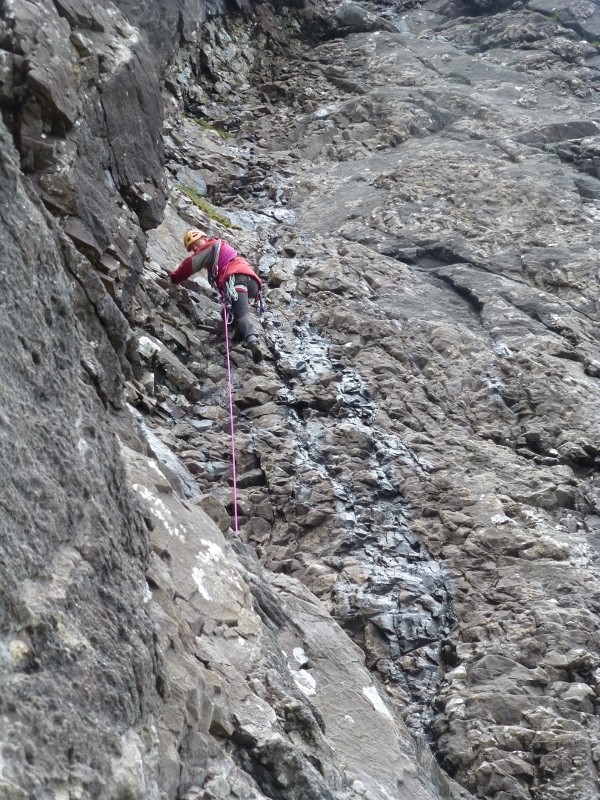 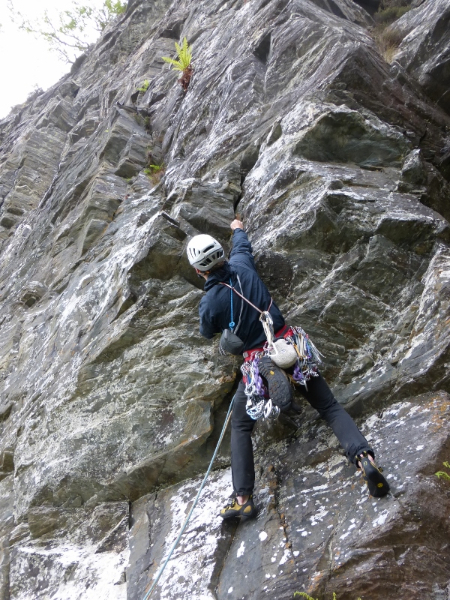 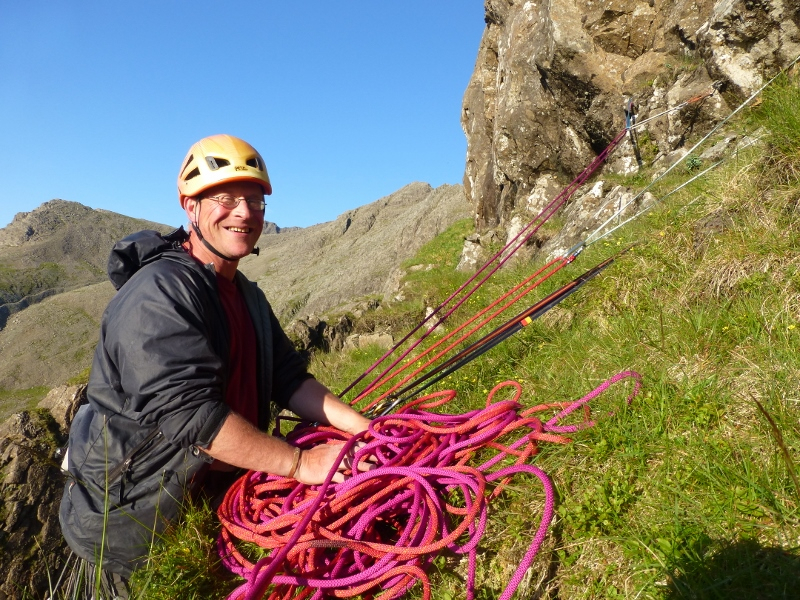 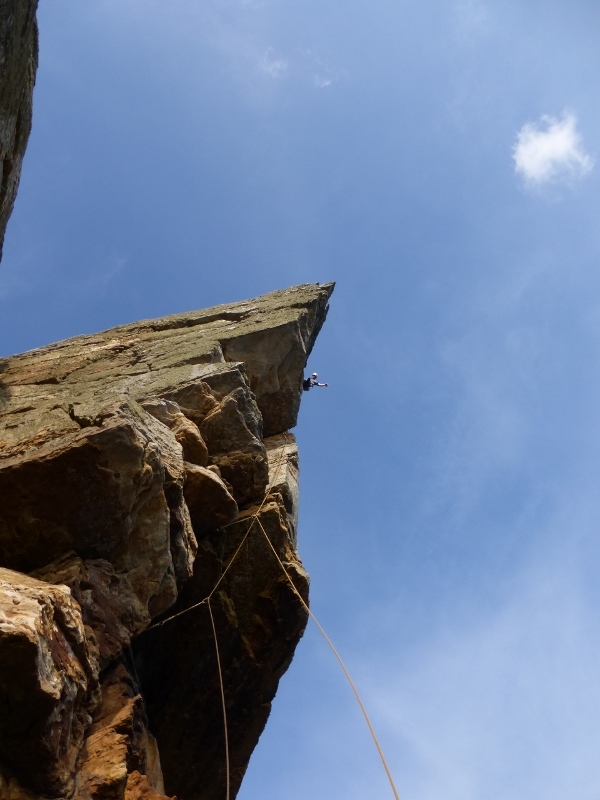 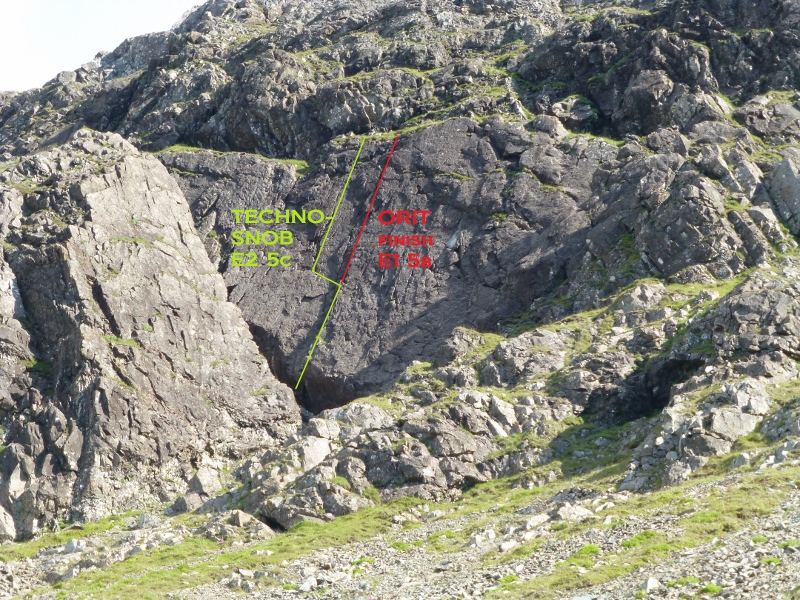 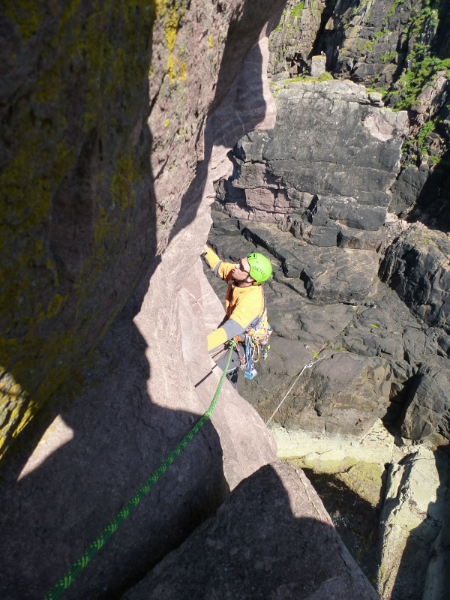 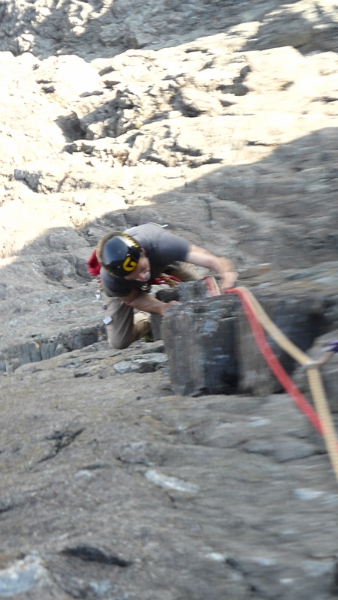 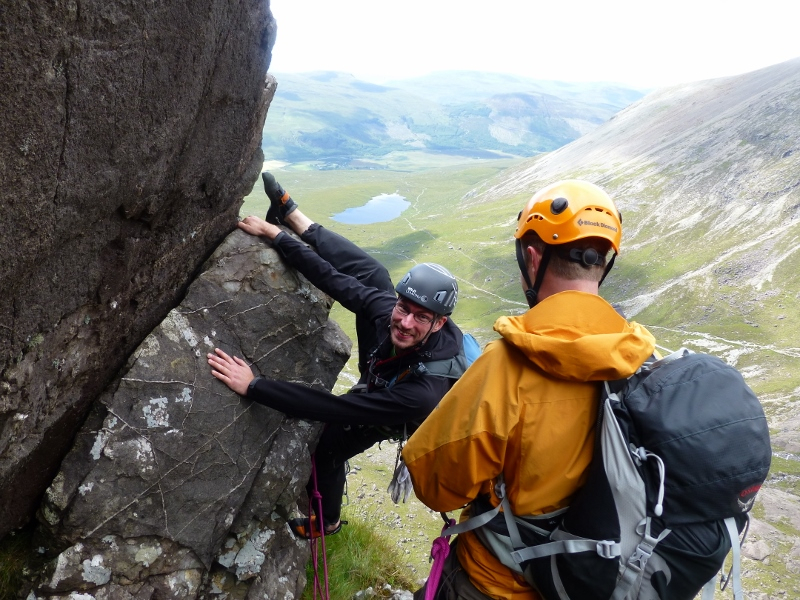 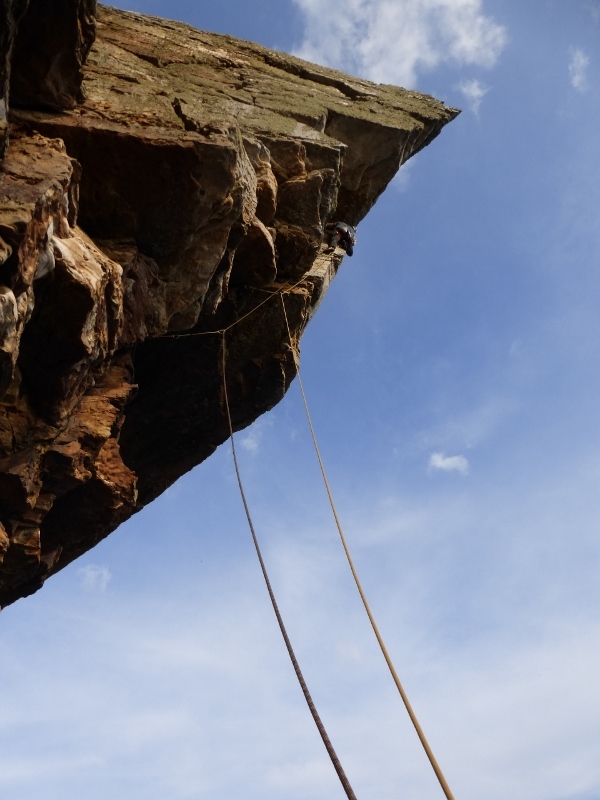 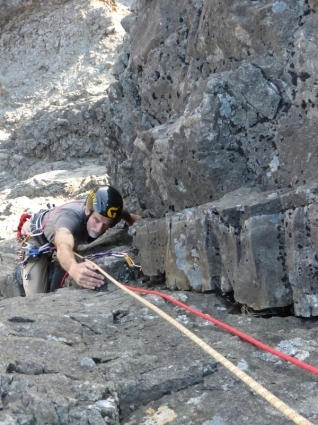 The Oldest Raver on Skye finish was even good enough to be considerably easier (E1 5b) than the parent route with the crux being the stiff rockover move off the ground. 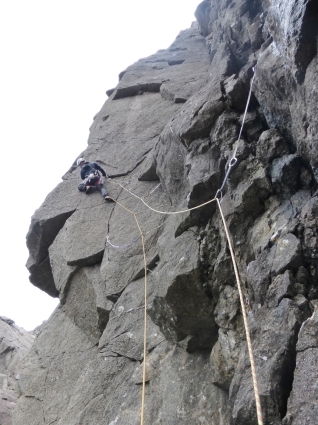 A word of warning to aspirants is that the best gear on this move is very high, too high for me, so Lucy stood on my shoulders to place it! 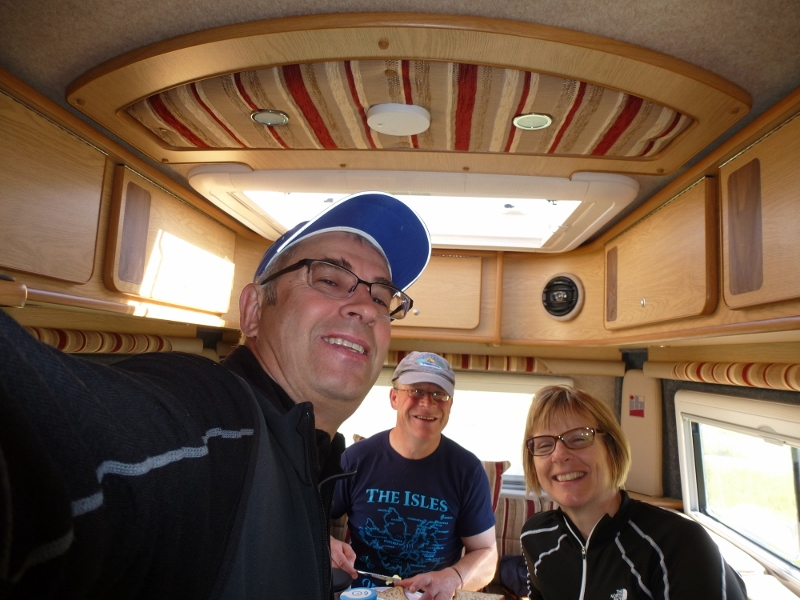 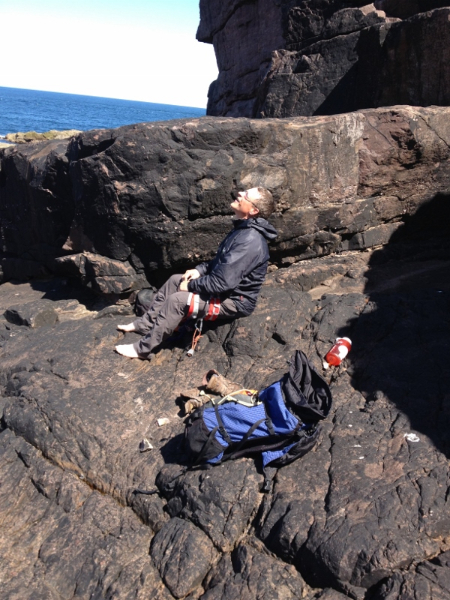 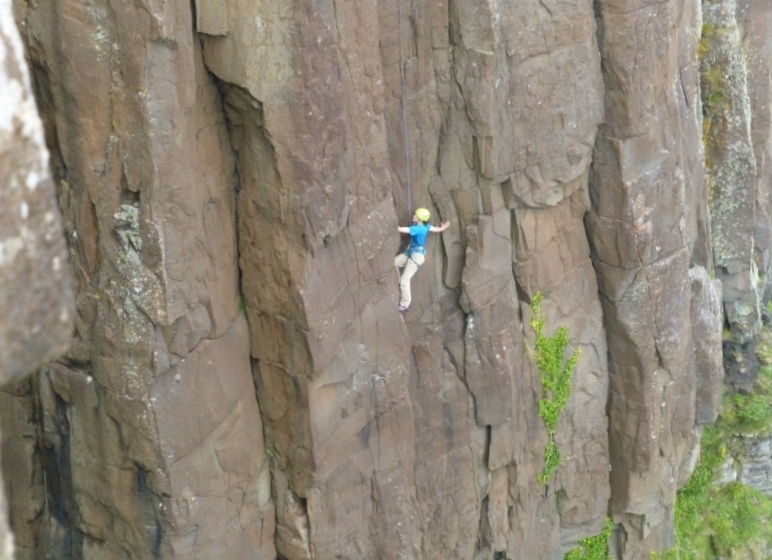 On Friday three Mikes and a Lucy headed to Kilt rock and a race to climb as much as possible before the rain arrived. 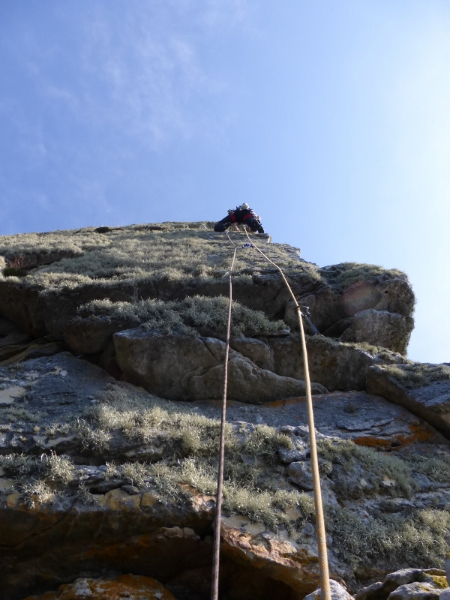 Clandestine (VS) and Secret Service (HVS) were topped off with ascents of the uber classic Grey Panther. 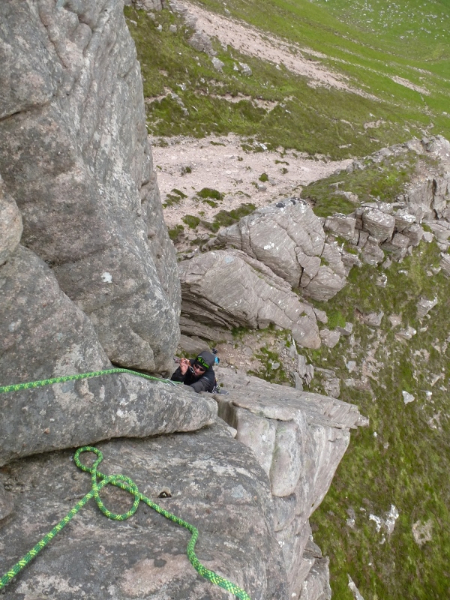 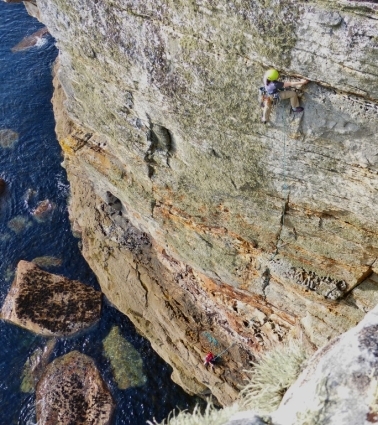 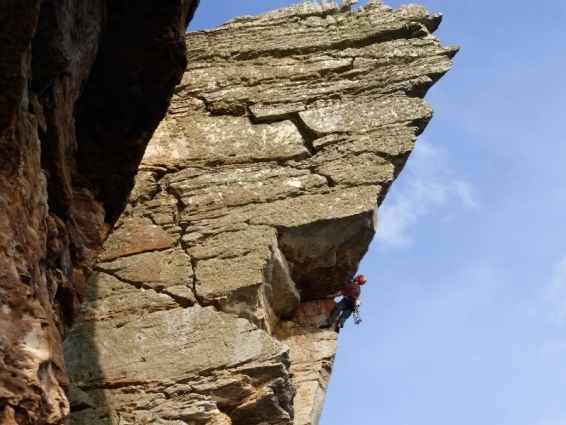 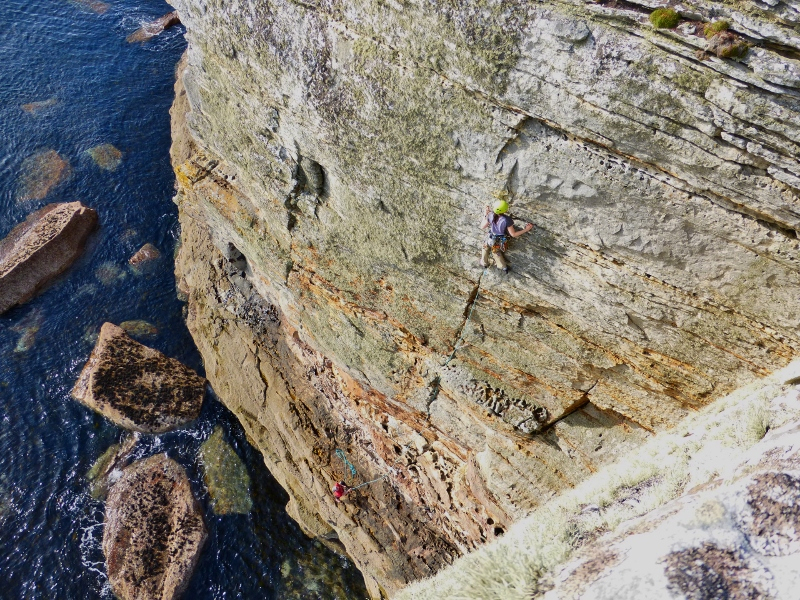 With a full ropelength of superb climbing on a plumb vertical fault this is a strong contender for the best E1 in the UK. 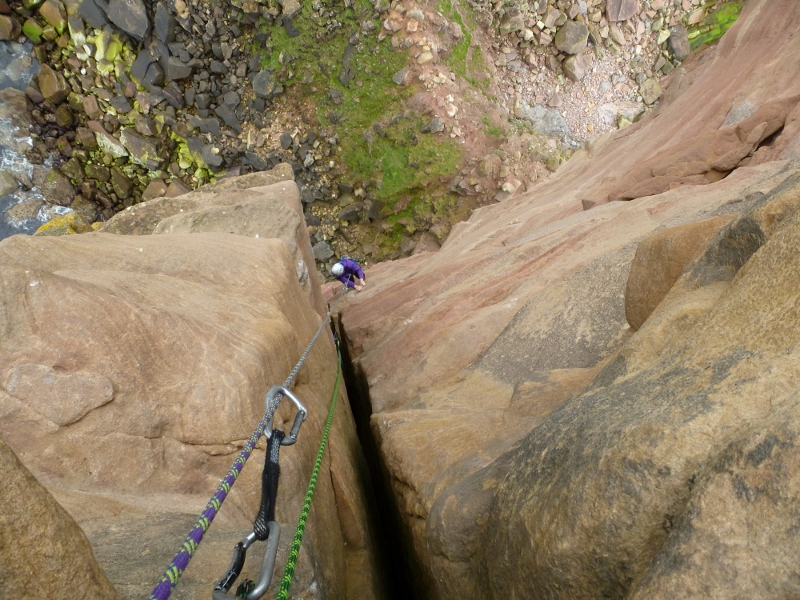 Saturday was as wet as predicted but Sunday was forecast as wall to wall sunshine. 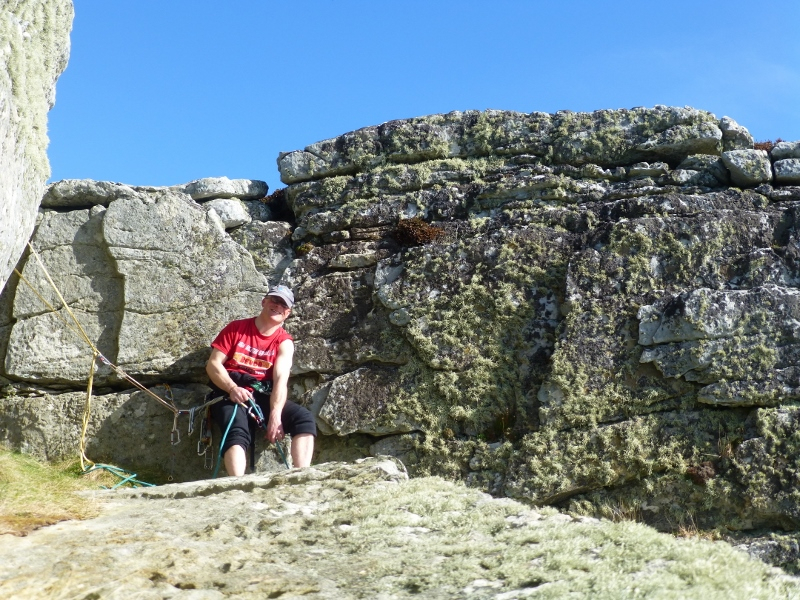 The 2 Mikes had been reading up on the Girdle Traverse of Sron na Ciche in the guidebook and Lucy and I agreed it would make a great team climb. 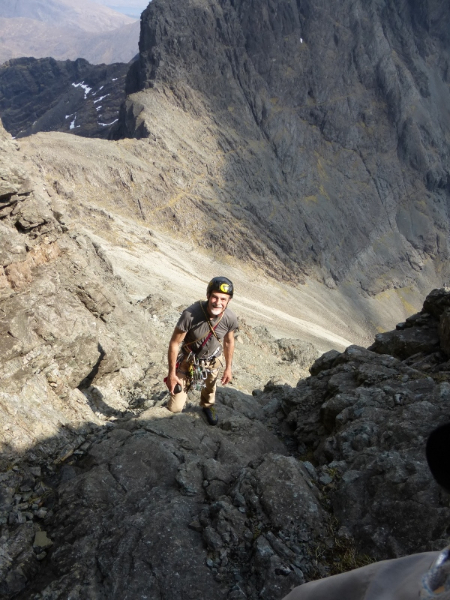 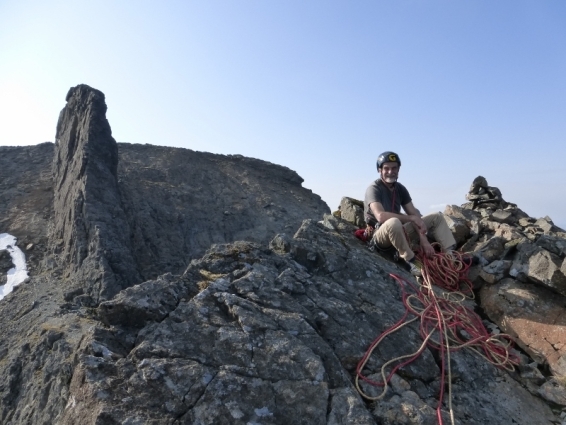 3 years ago we’d taken 5 hours in perfect conditions but JEB Wright, a guide back in the 1920’s recorded climbing it with parties of 4, 5 and 6 in all sorts of conditions and never in more than 6 hours. 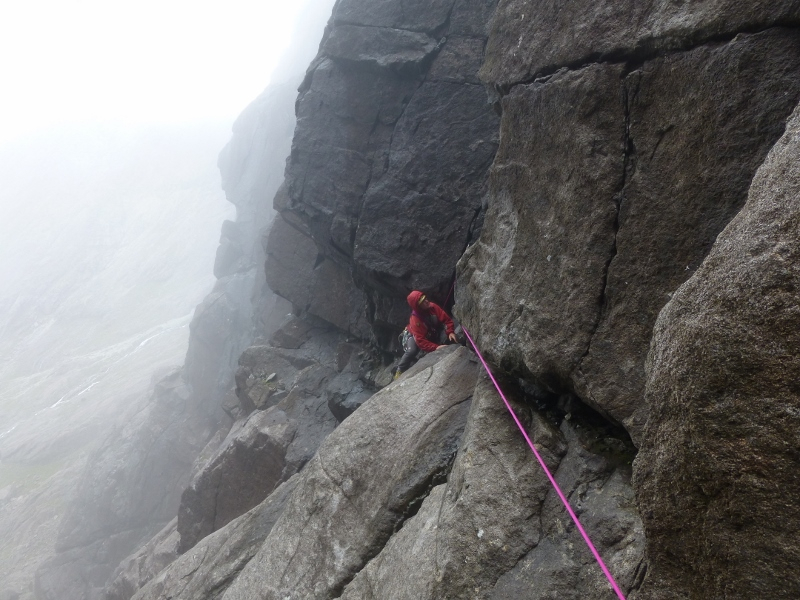 The clear tops sank back into the mist as we arrived and a cold wind nipped at the fingers as we geared up. 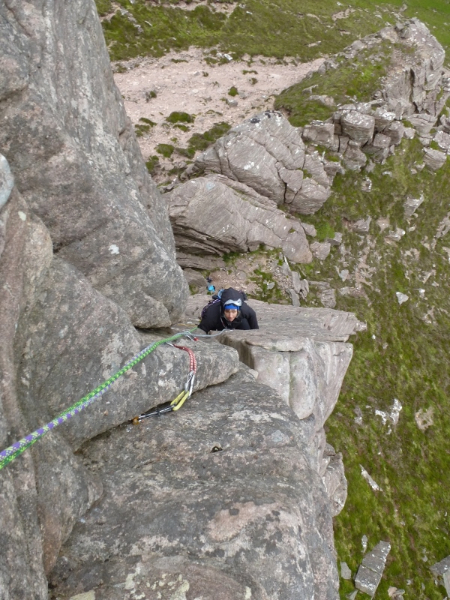 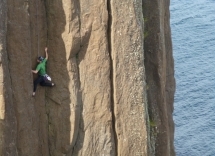 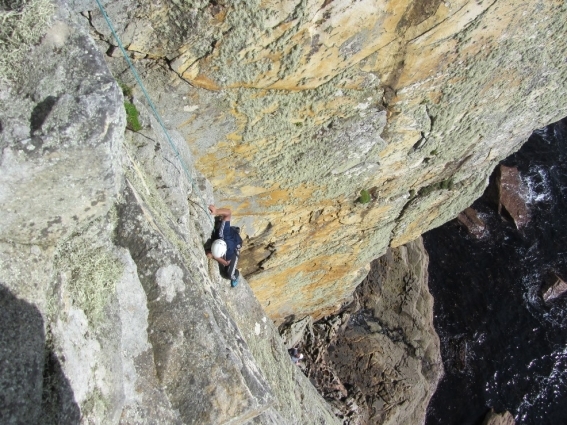 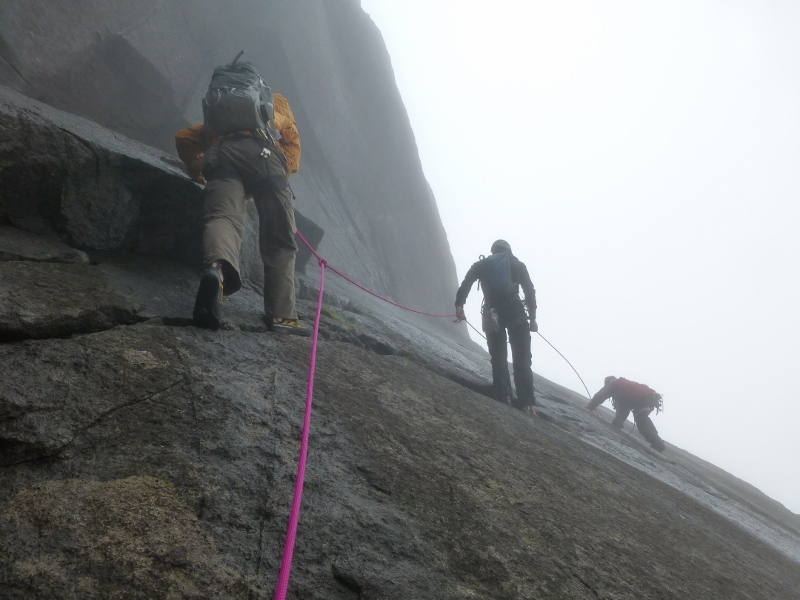 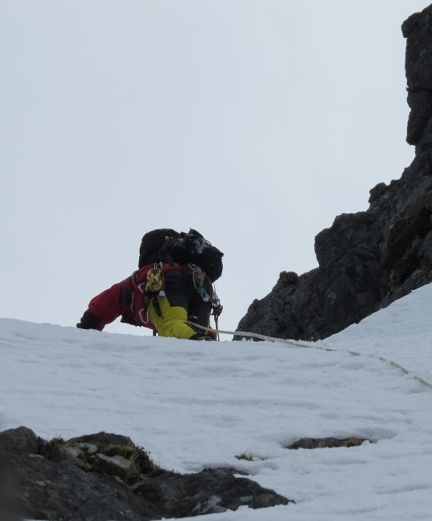 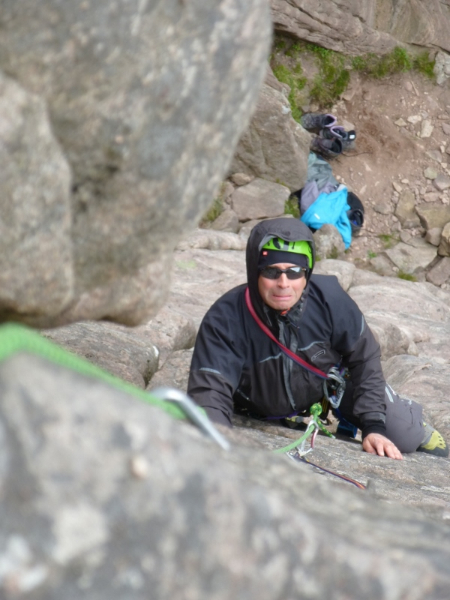 2nd time around and with a quality team we made good progress to the Serpentine Chimney. 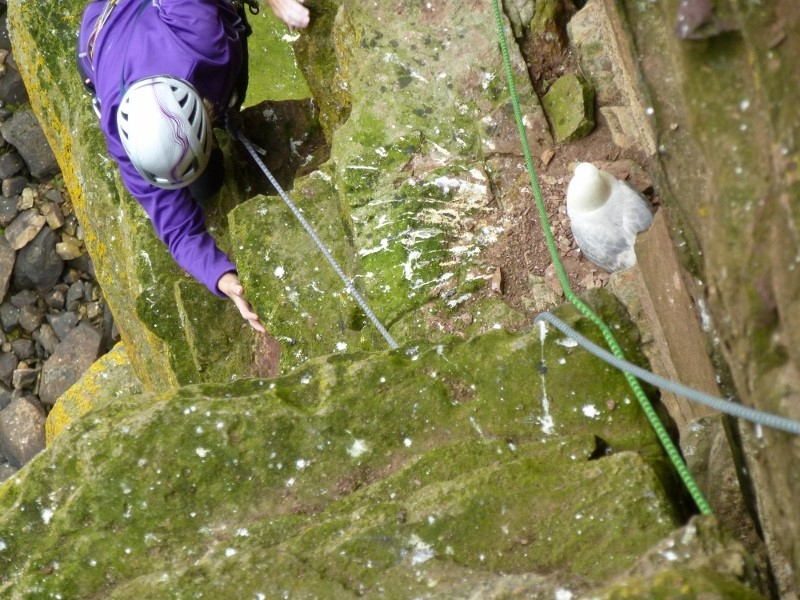 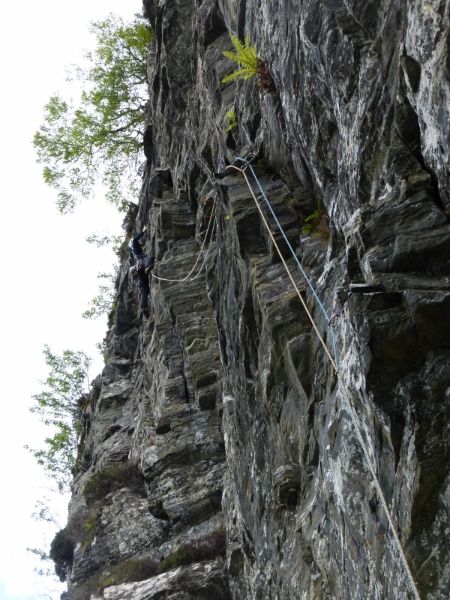 Lucy & I felt we had cheated last time by abseiling the downclimbs but our attempt to mirror them failed at the first hurdle with a long damp move at the foot of the climb. 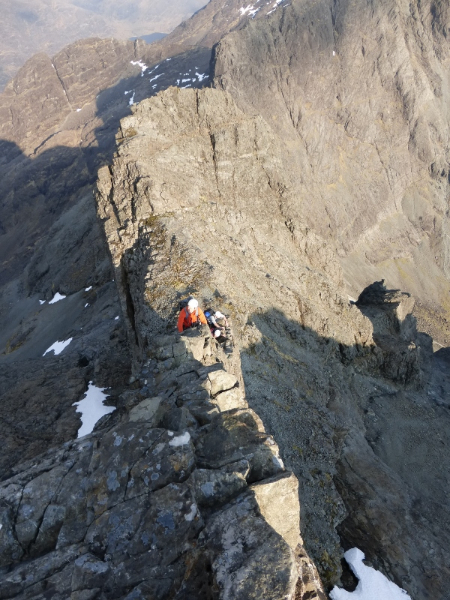 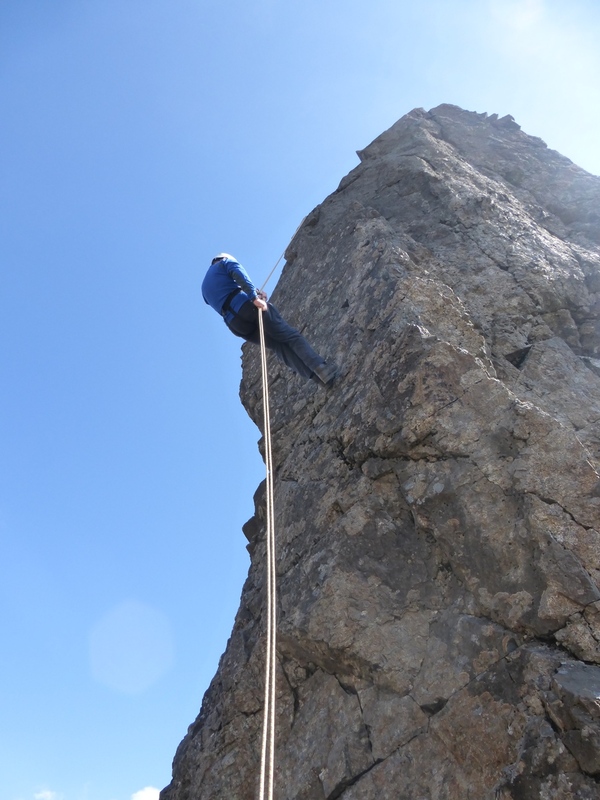 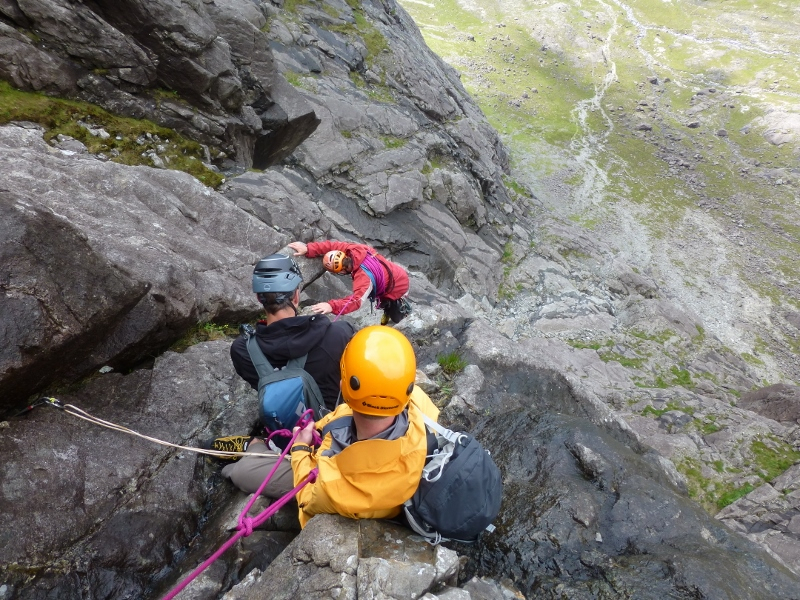 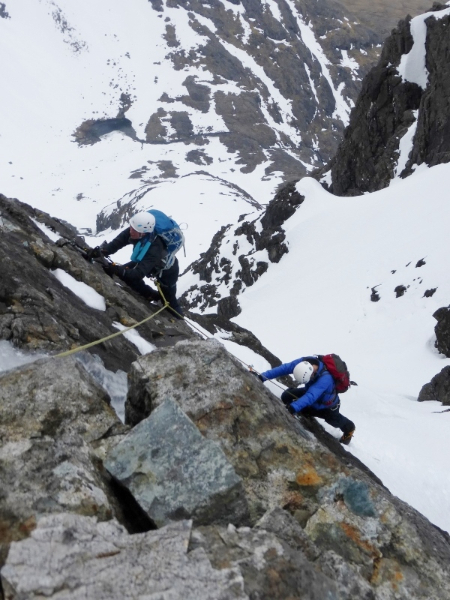 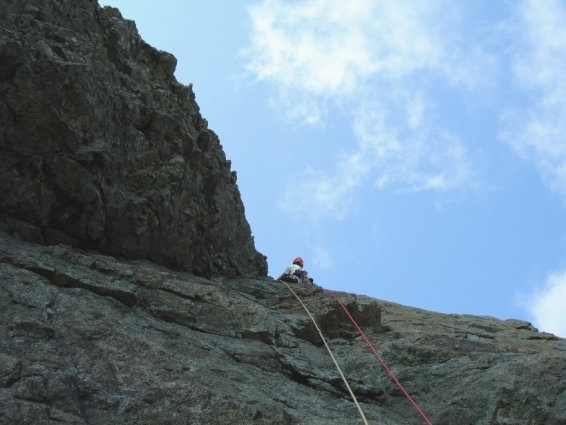 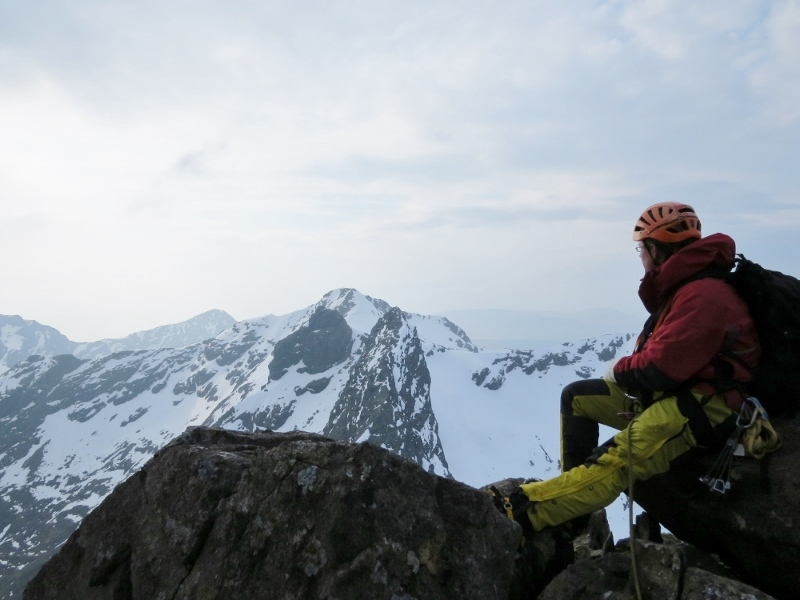 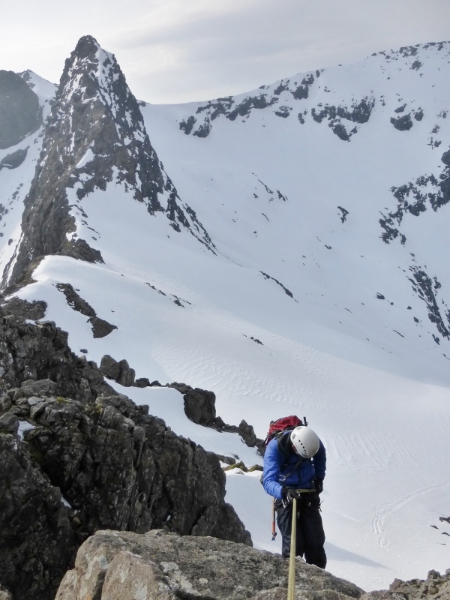 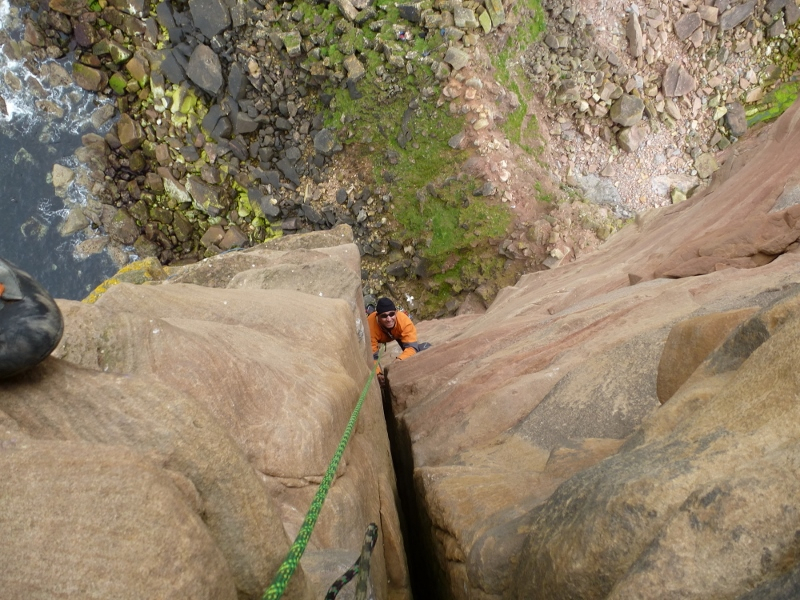 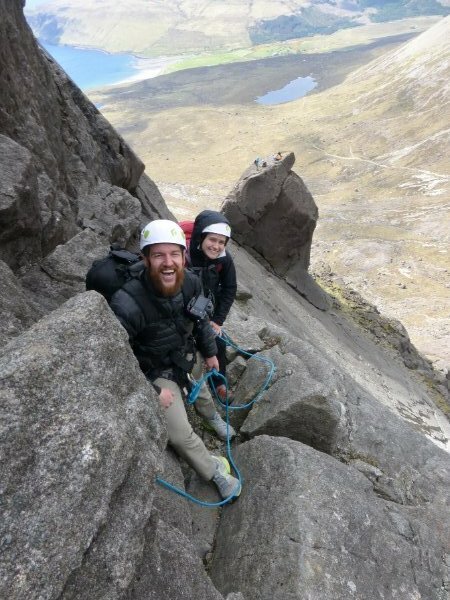 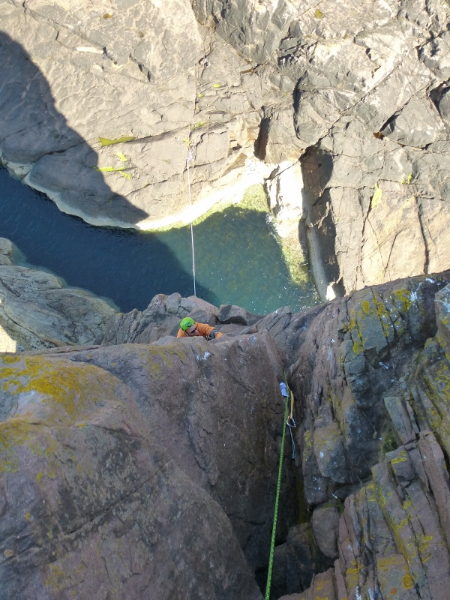 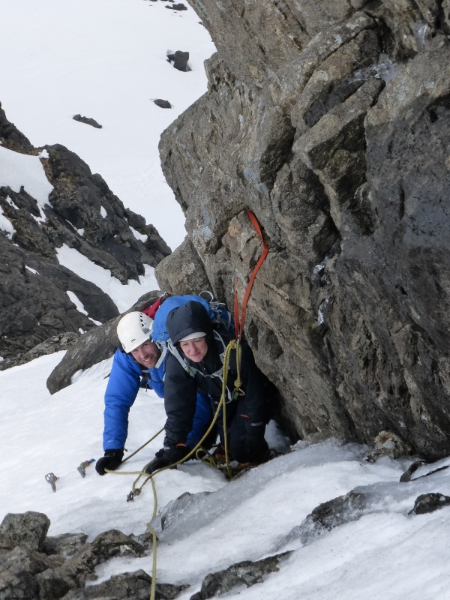 Things warmed up after Eastern Gully as we sped past a continuous series of old classic routes; the Cioch, down to the Terrace and Doom Walls, another abseil, over the Hexagon Block and across Amphitheatre Arete. 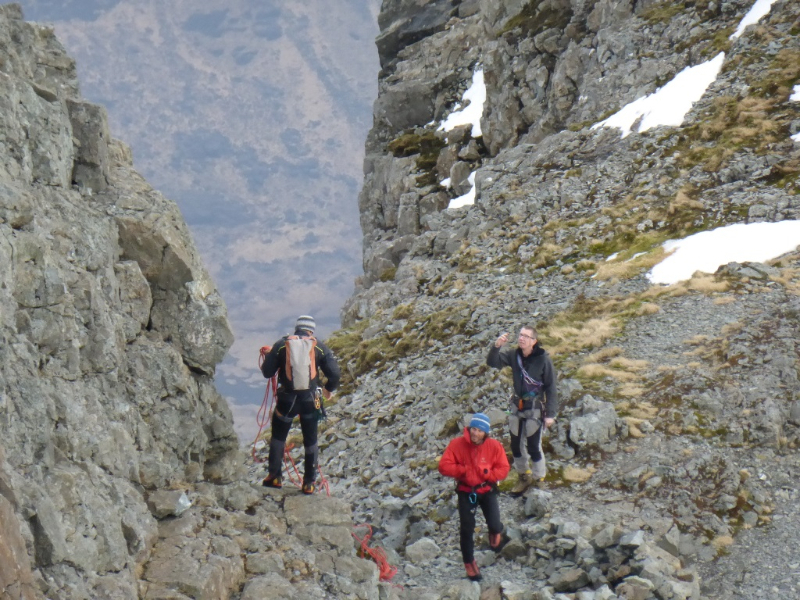 Gaining entry to Trap Face Route once again proved awkward and needed a few runners to keep us safe before following the trap right out to overlook Western Gully and some welcome sunshine and lunch. We’d made it in under 4 hours this time and Mr JEB Wright now seems a little less superhuman. 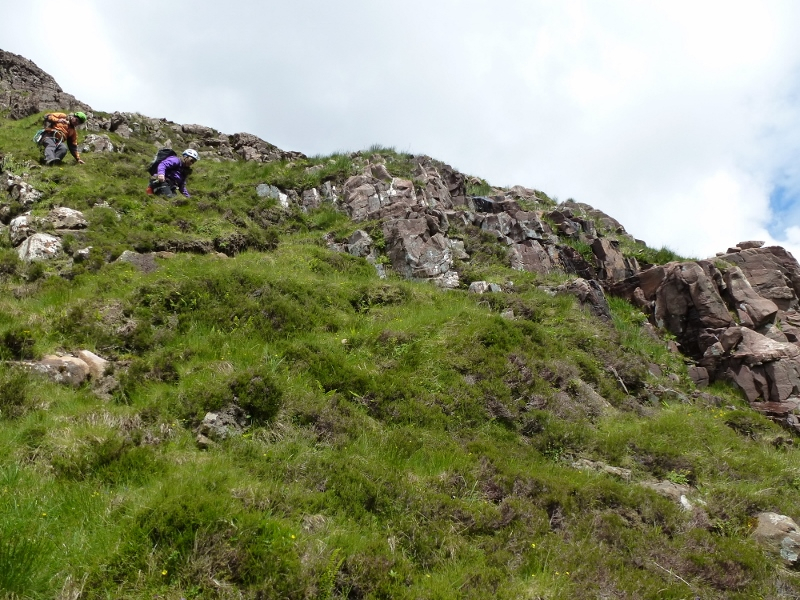 His first effort took only 2.5 hours though so we’ve a way to go to still! 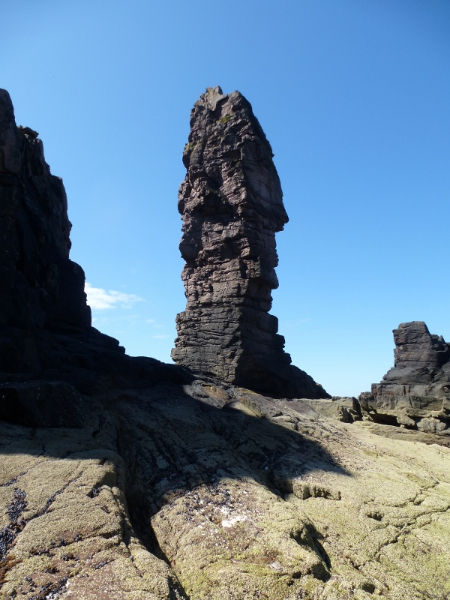 The Kings Martin & Deidrie took me off for a great road tour around the north of Scotland last week and the weather treated us handsomely. 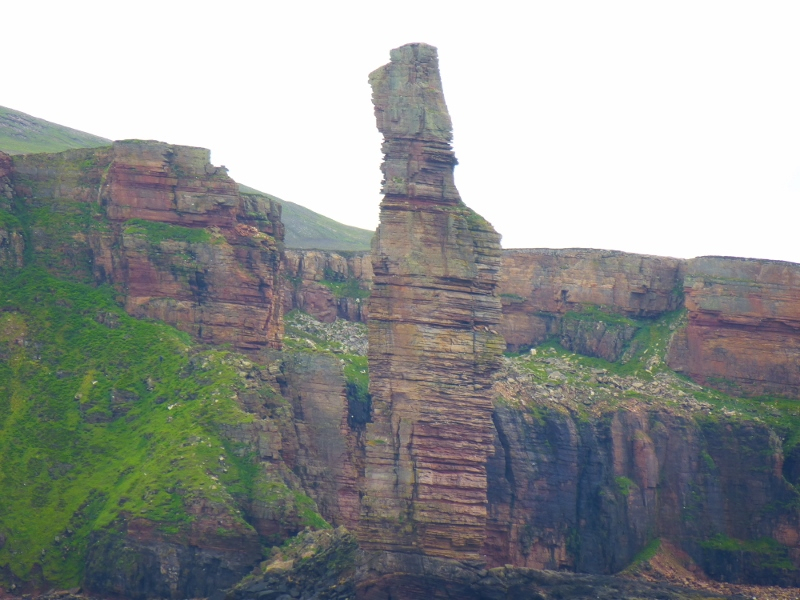 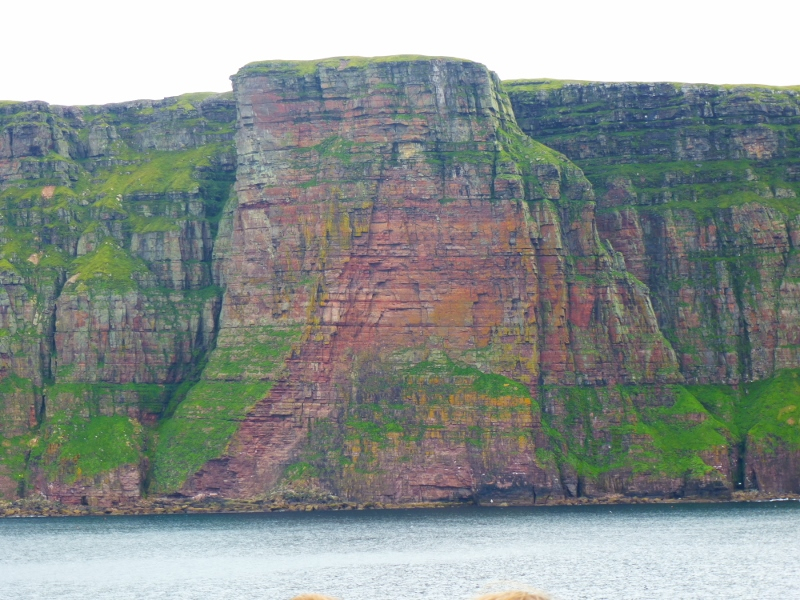 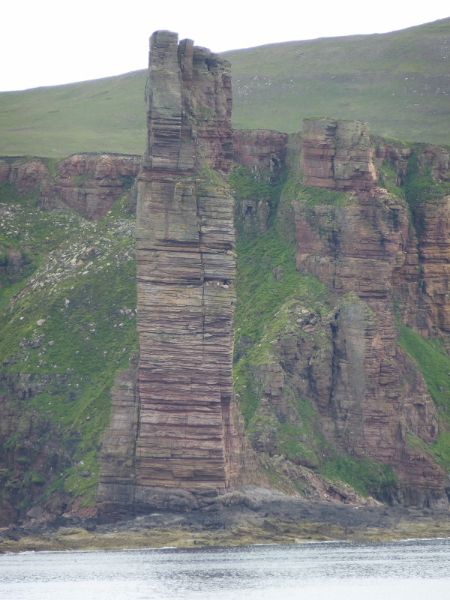 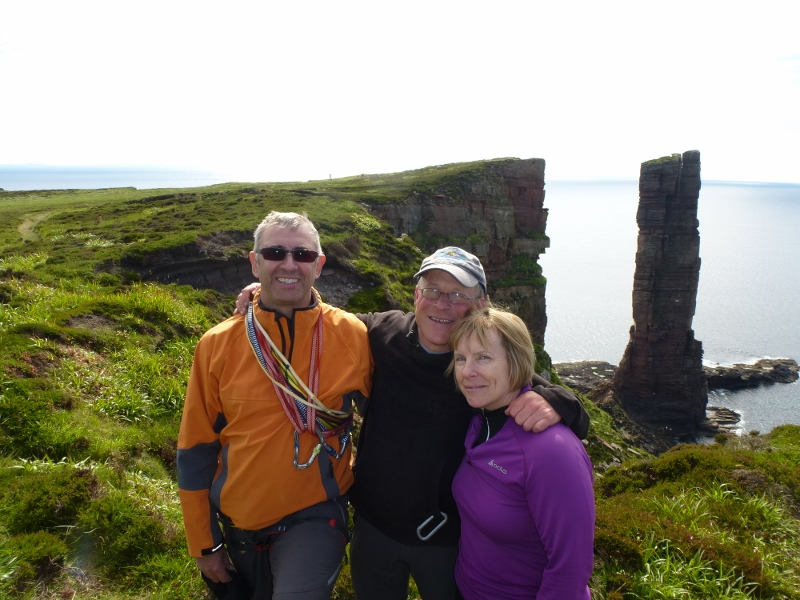 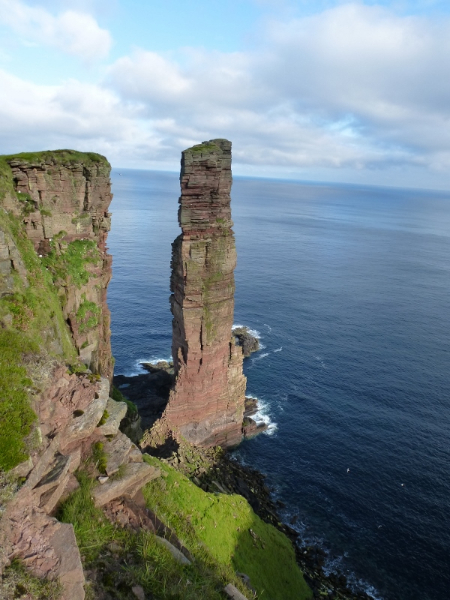 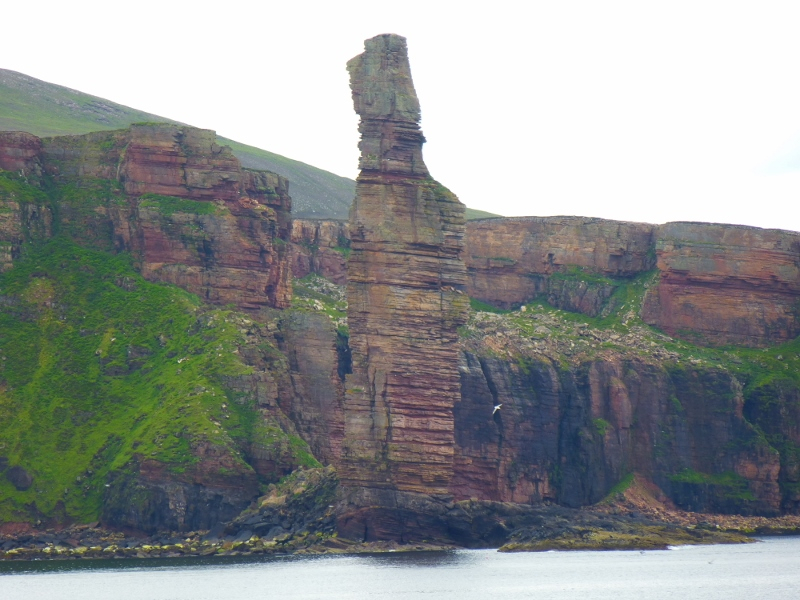 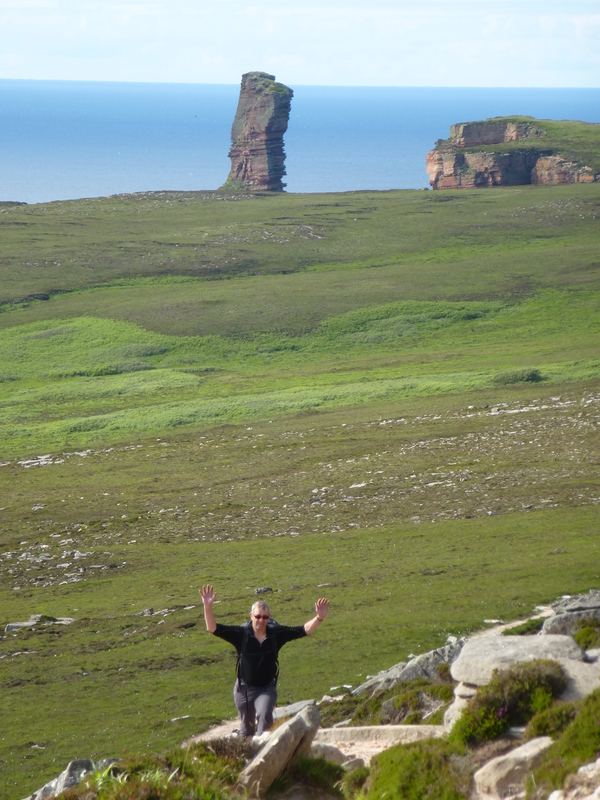 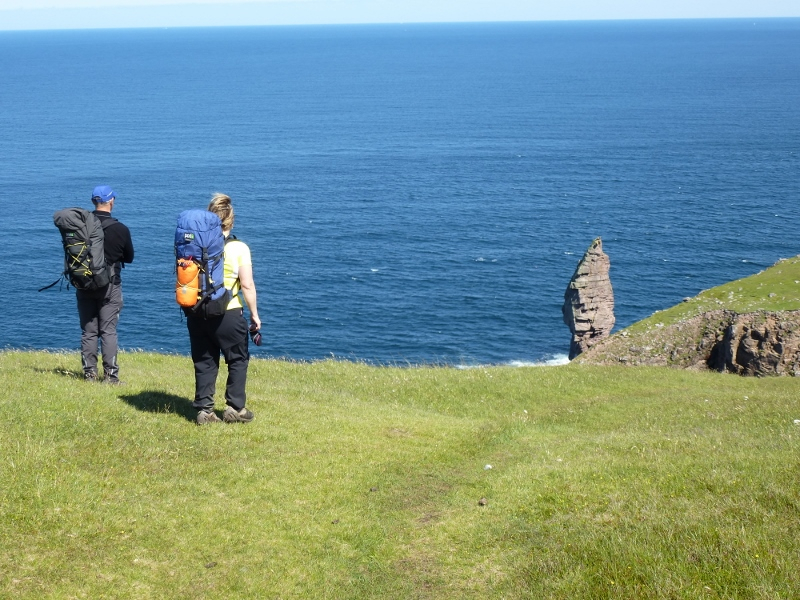 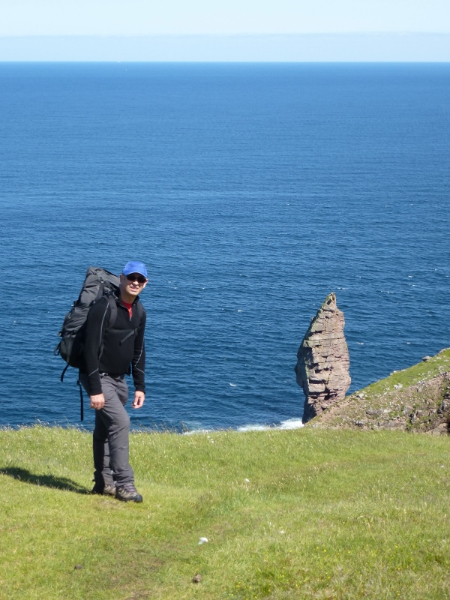 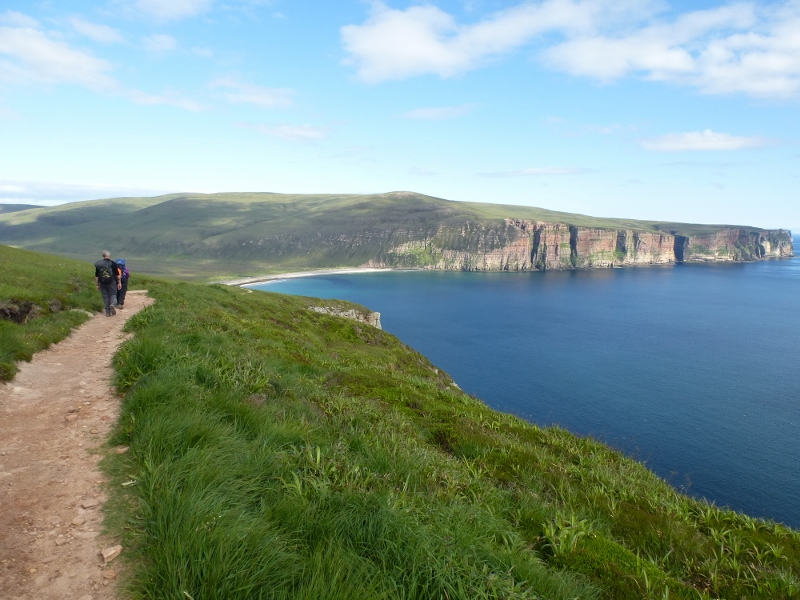 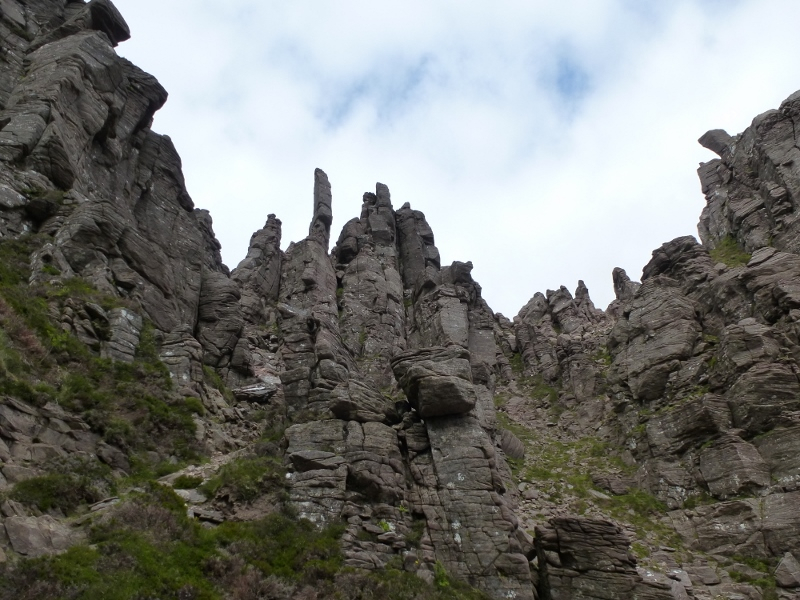 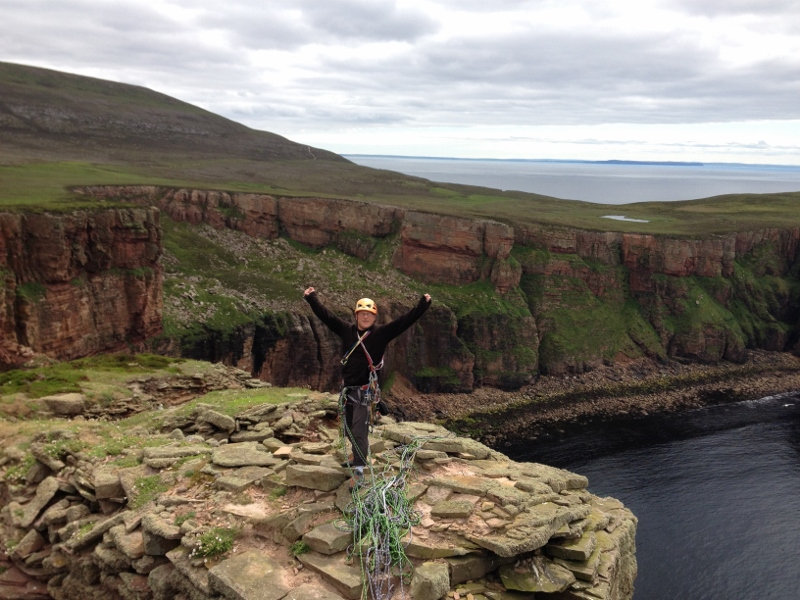 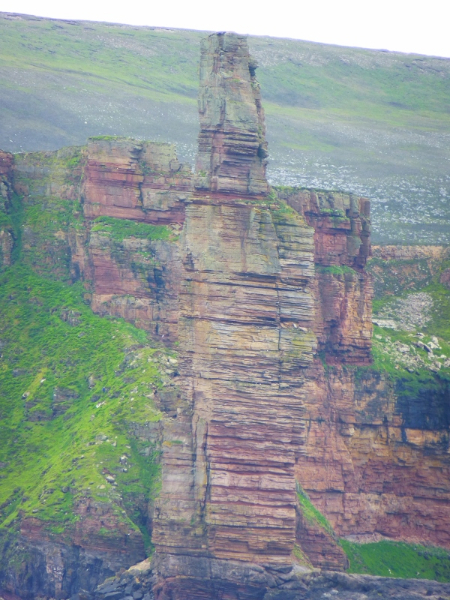 The Old Men of Hoy & Stoer were major highlights supplemented by Vlad the Impaler on Stac Pollaidh and Sword of Gideon near Applecross. 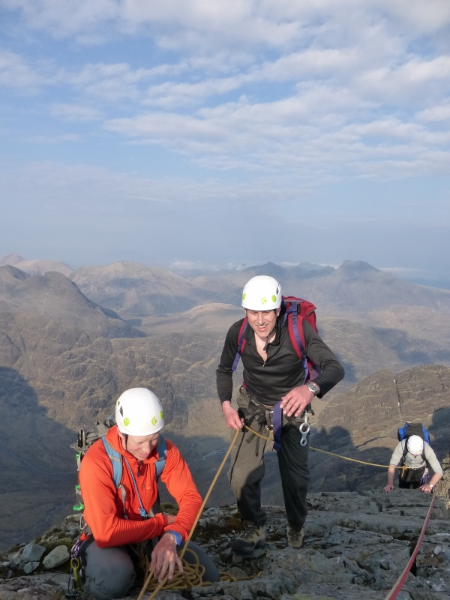 Fantastic trip thanks guys; superbly climbed and great company too. 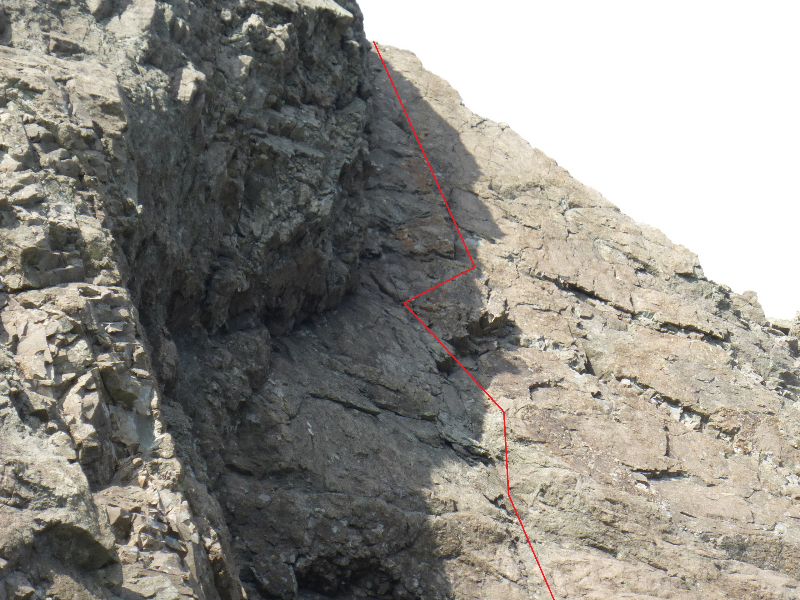 Silly steep start to the day! 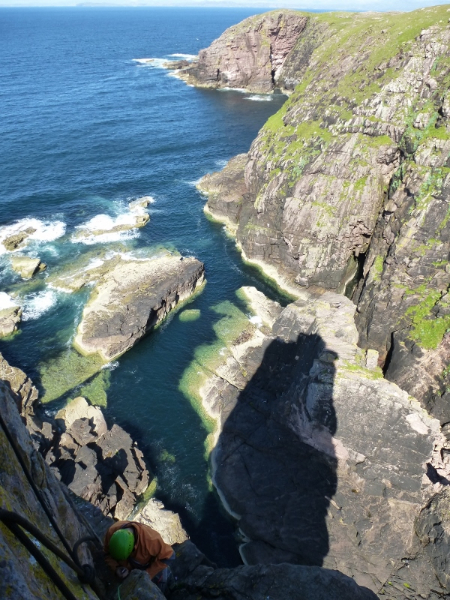 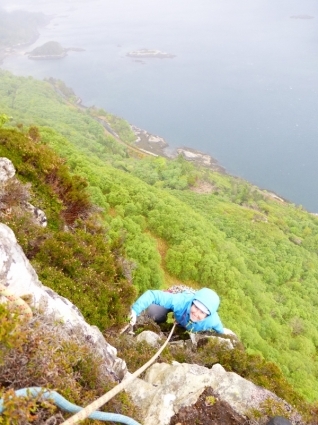 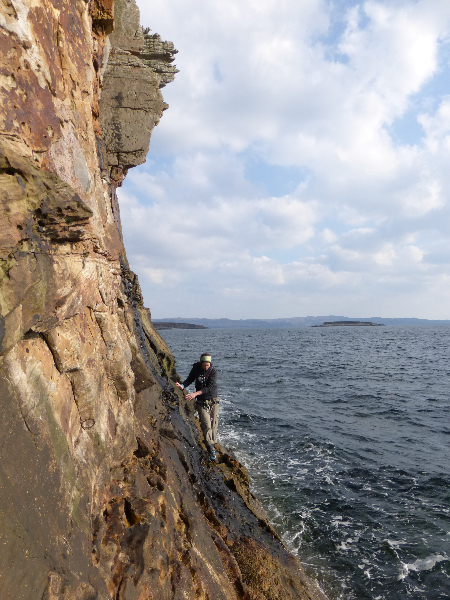 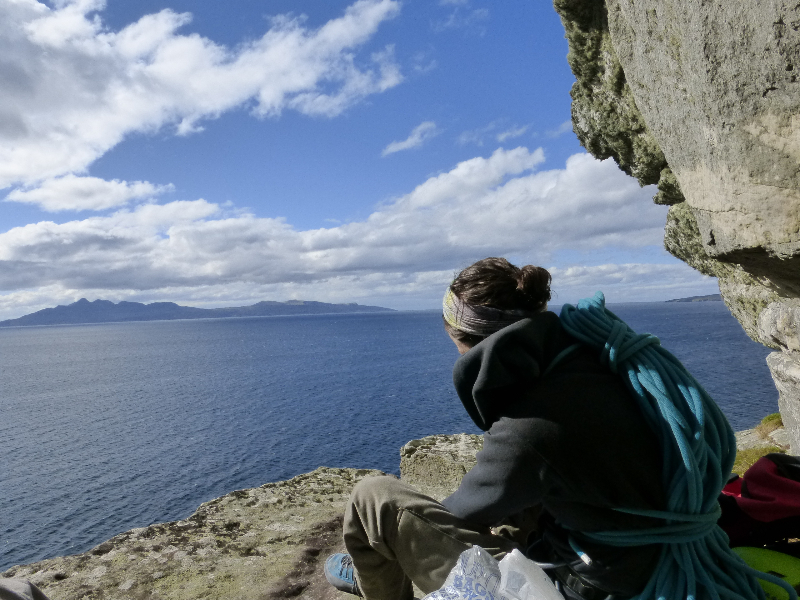 Francis inspired Lou and me to join him and explore what the guidebook calls “terrain adventure, steep & exciting” on the upper cliff at Duncraig, just across the water near Plockton. The book took a bit of deciphering but we were rewarded with 3 pitches of really good climbing. 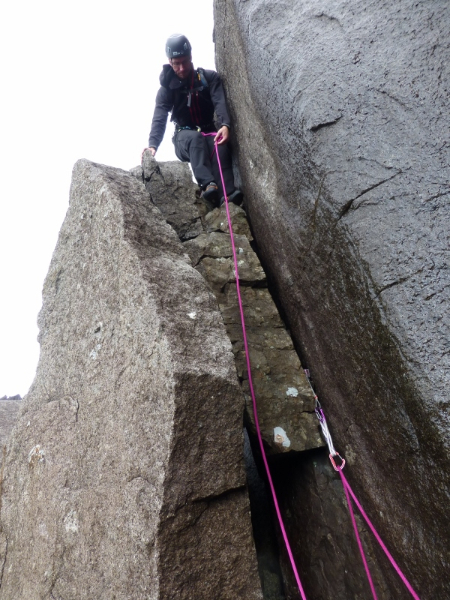 Our “combo” had Francis warm us up rapidly on Brigadier Braggart’s Little Secret, E3 5c. 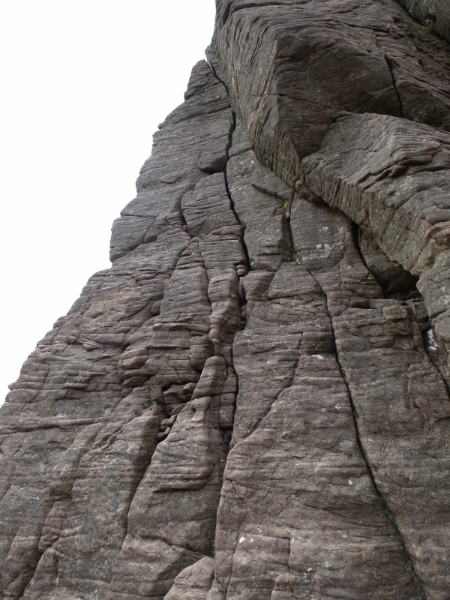 The obvious line above was eventually identified as Easy Rider, HVS 5a. 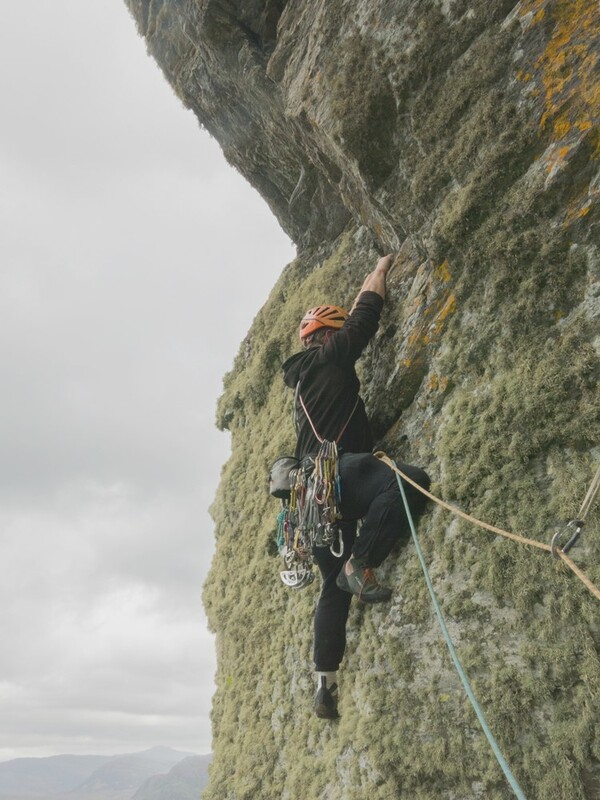 This gave Lou a great curving crack pitch and then a very adventurous finish for me with route finding and vegetation adding extra spice to the high quality climbing. 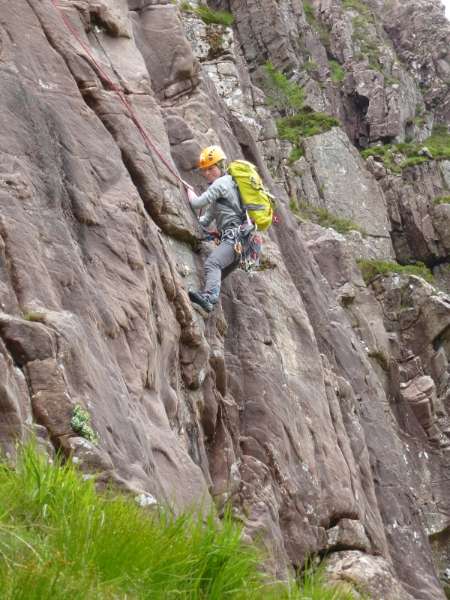 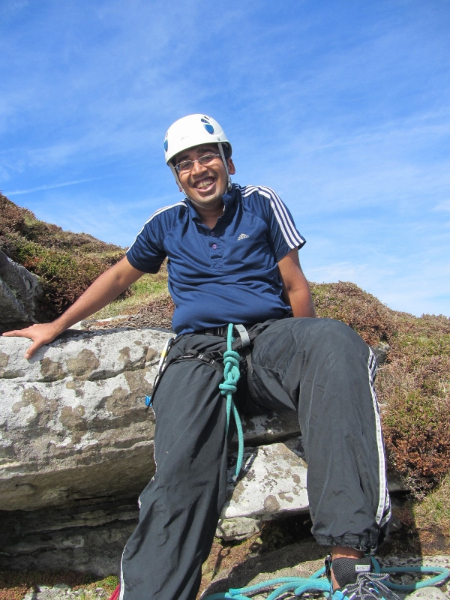 Set above Plockton bay with the Torridonian sandstone mountains behind the crag really is in a phenomenal position. 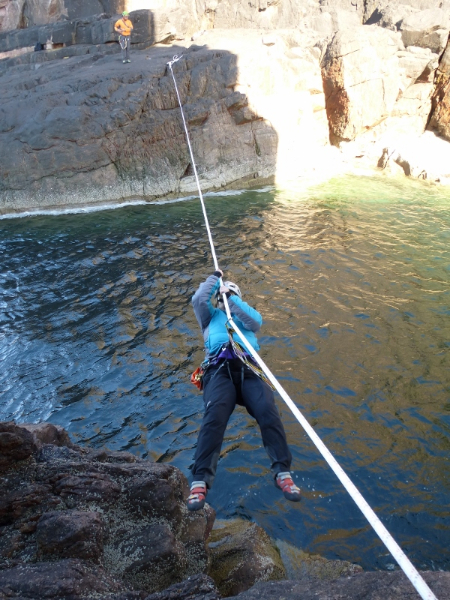 Our adventure ended with yet more exploration as we took faith in the guidebook and abseiled back over the edge from the trees. 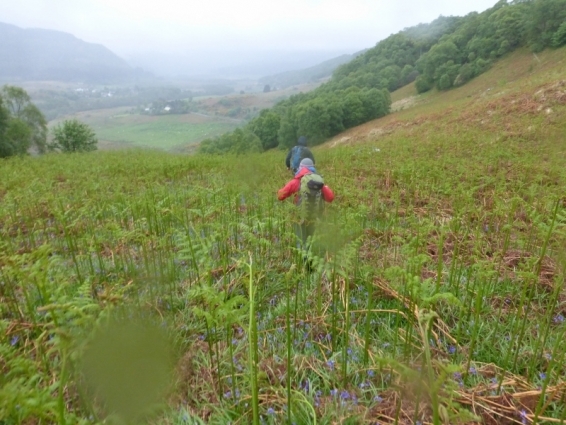 The heavy rain had arrived but we really didn’t mind one bit. Set above Plockton bay with the Torridonian sandstone mountains behind the crag really is in a phenomenal position. 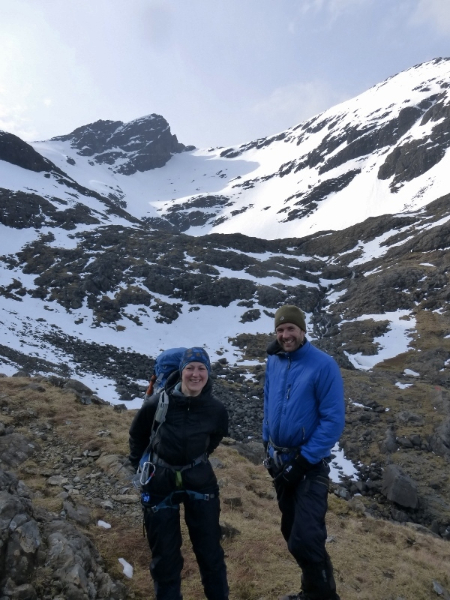 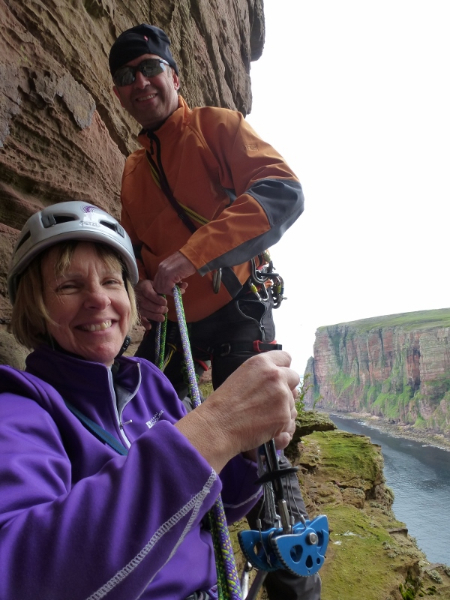 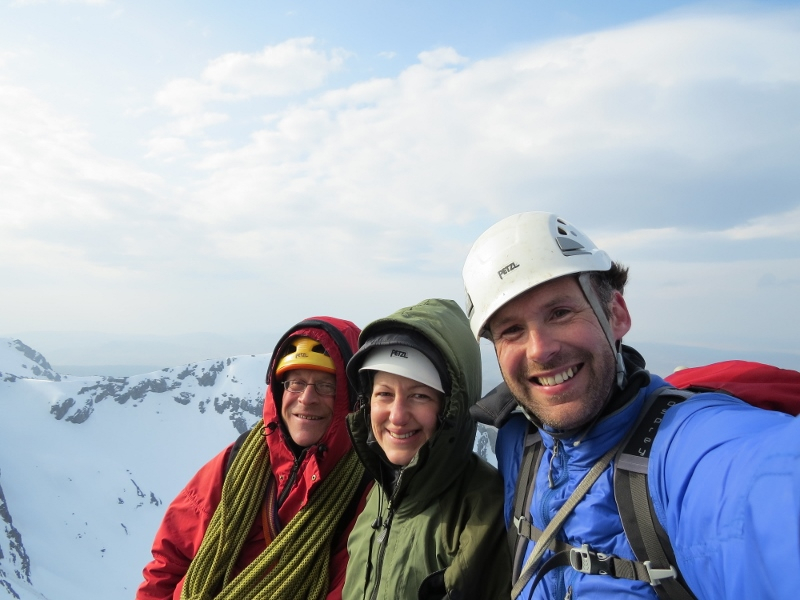 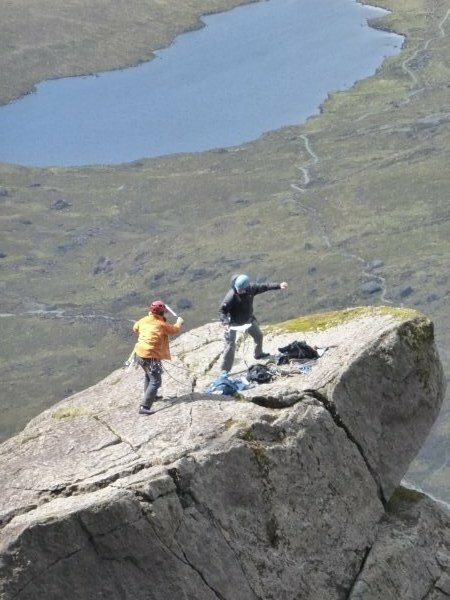 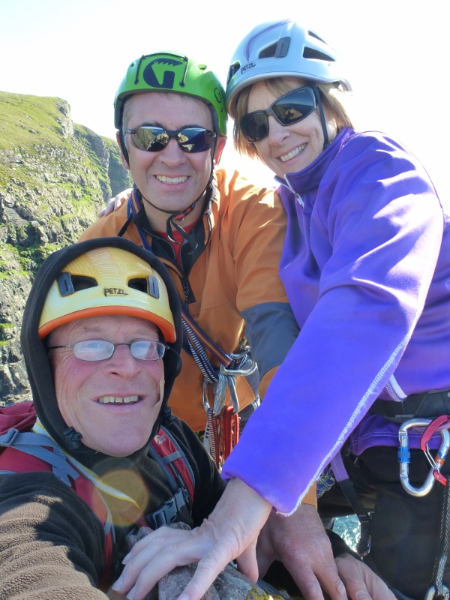 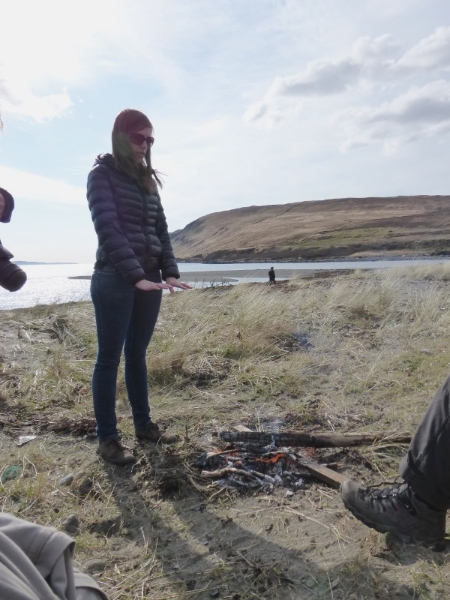 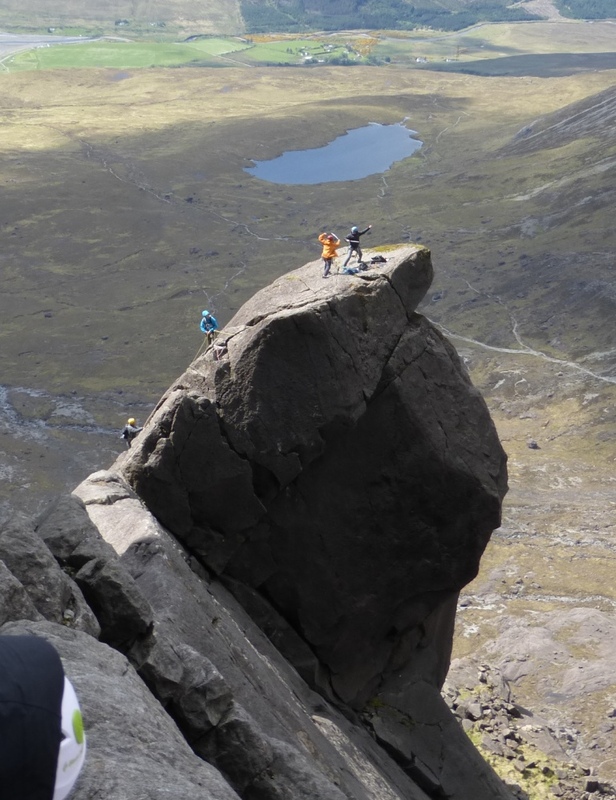 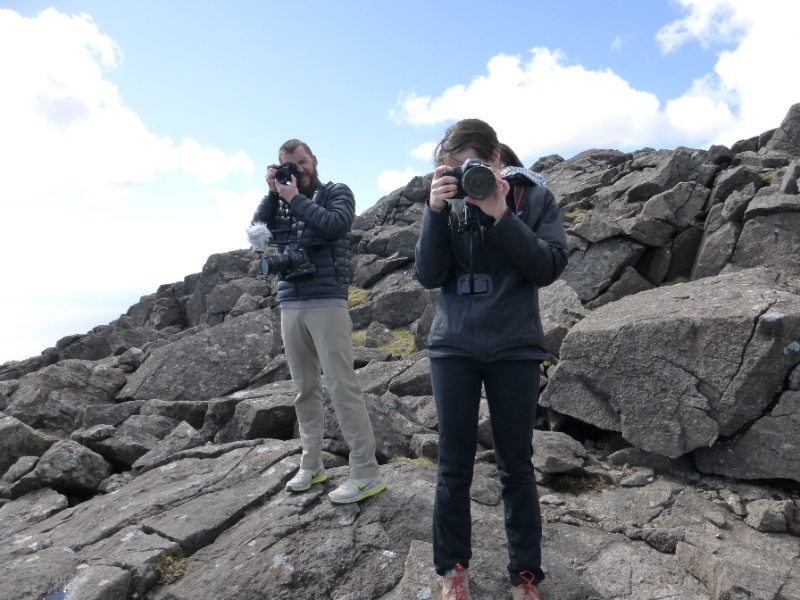 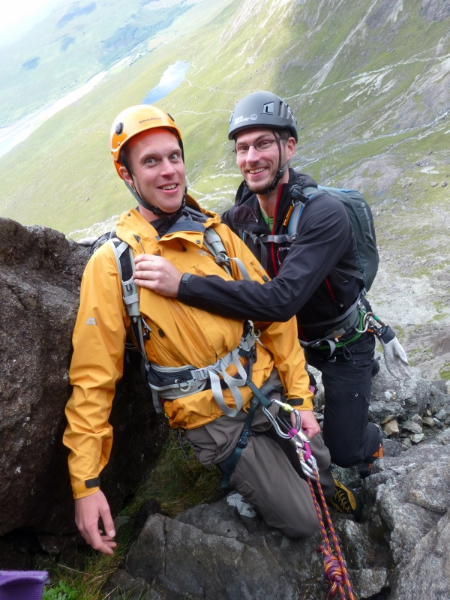 The guys were a pleasure to work with, filming didn’t interfere with the climbing, the weather was perfect, eagles came out to play and both Elaine & Kerrin had monstrous grins as they revelled in the excitement of climbing the Cioch. 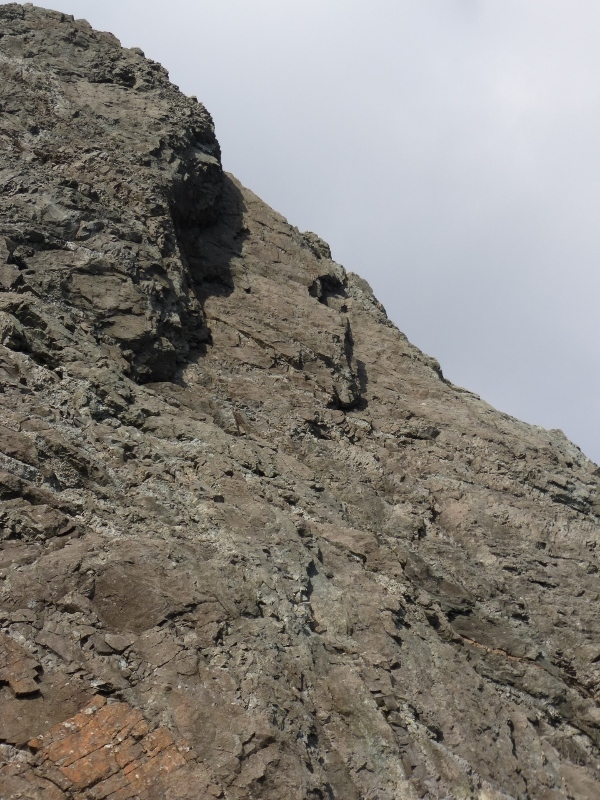 Good luck with the enterprise! 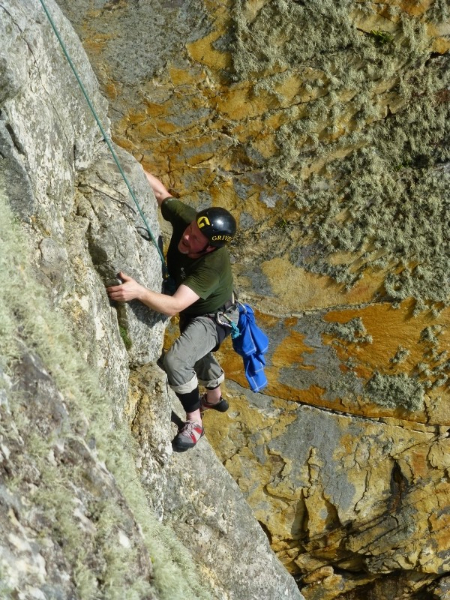 Francis on the crux of Veritas Splendour; it certainly is! 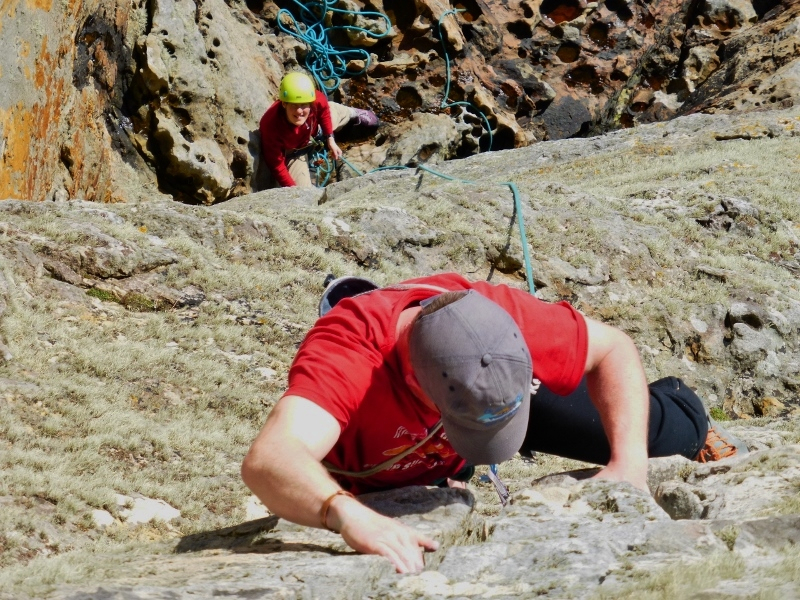 Had a great work out on Tuesday following Francis through the overhangs on Veritas Splendour, E3 5c and then the even huger ones on Mother’s Pride, E4 5c. 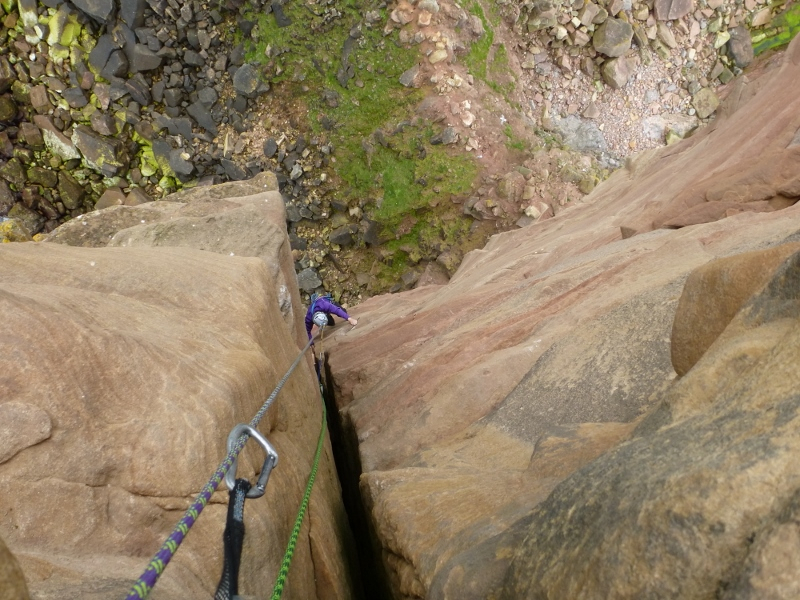 For my lead I choose Ogmorian, one of the few routes here I hadn’t climbed before. 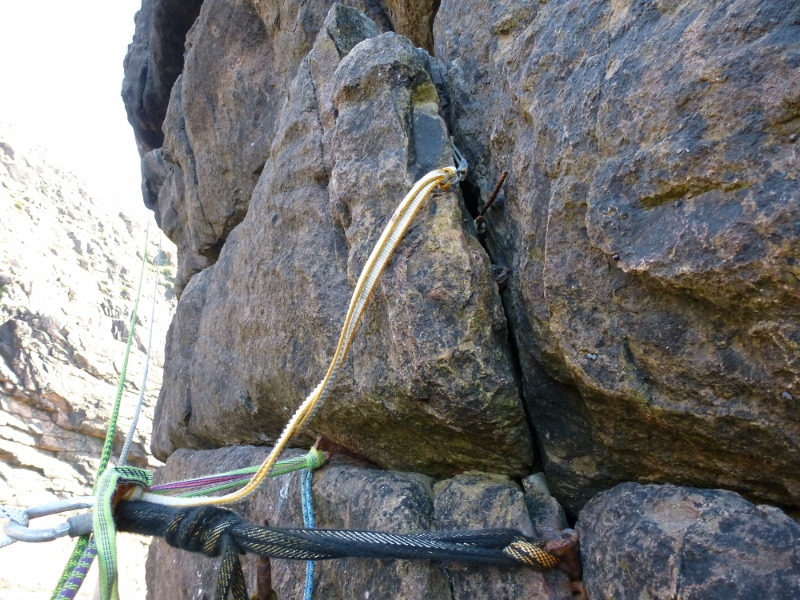 Being pretty dirty I didn’t feel it really deserved the 1 star recommendation when there are so many other quality routes on the crag, but others may think differently. 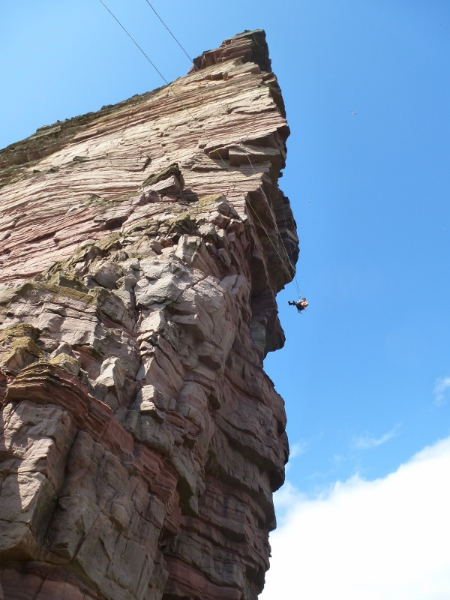 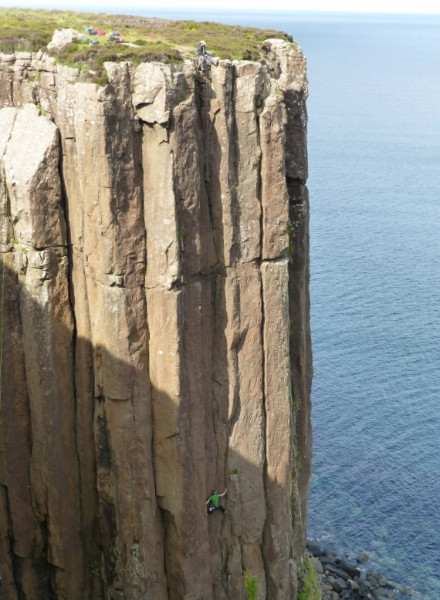 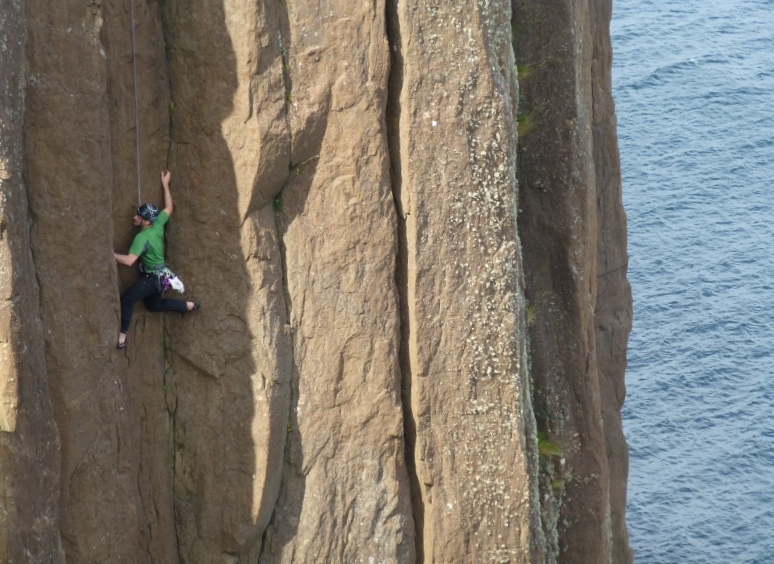 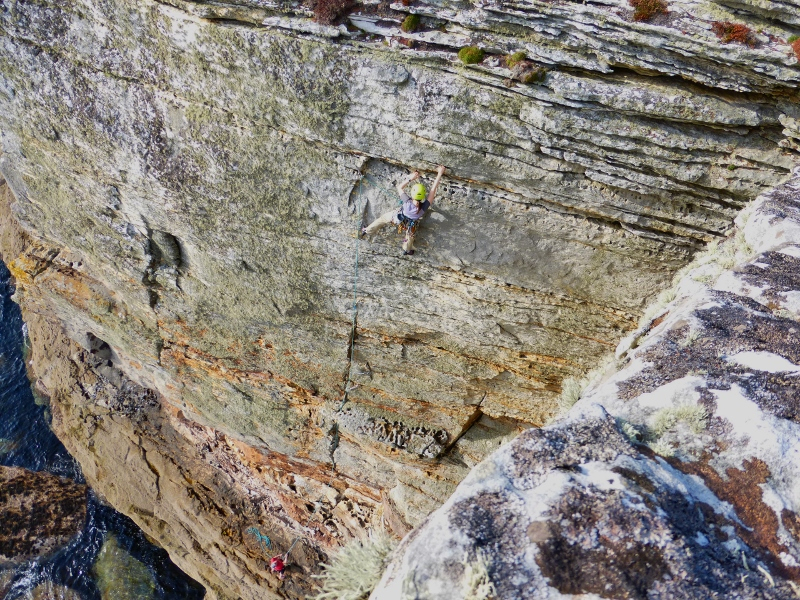 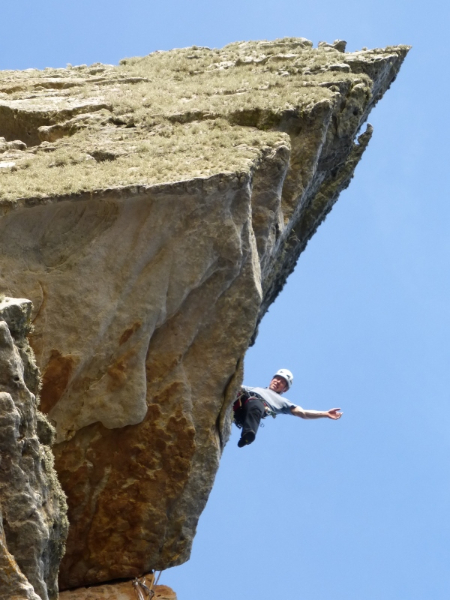 Mother’s Pride, by contrast, is an uber-classic pitch that follows a crack splitting 2 massive overhangs. 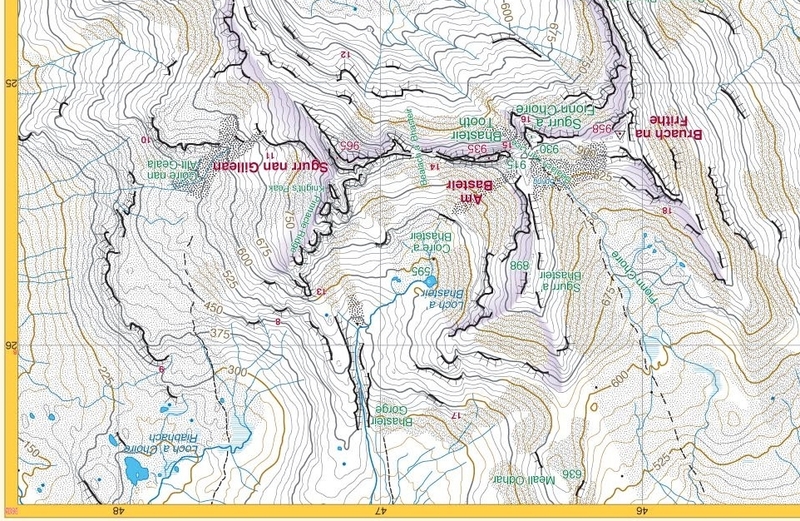 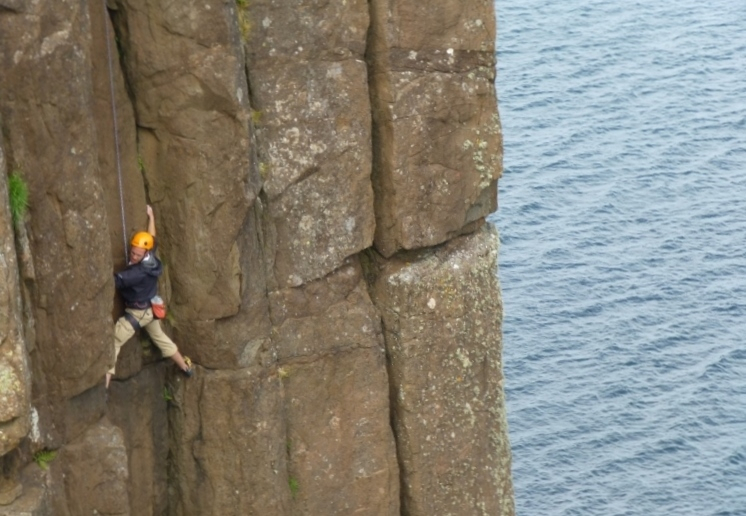 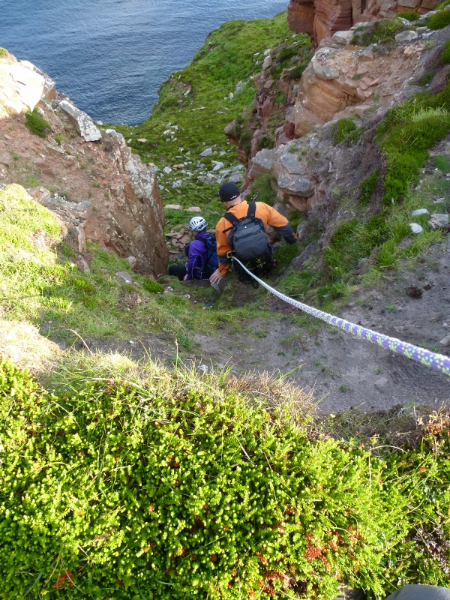 If you lower off the 25m route from the top you land 15m away from the foot of the climb! 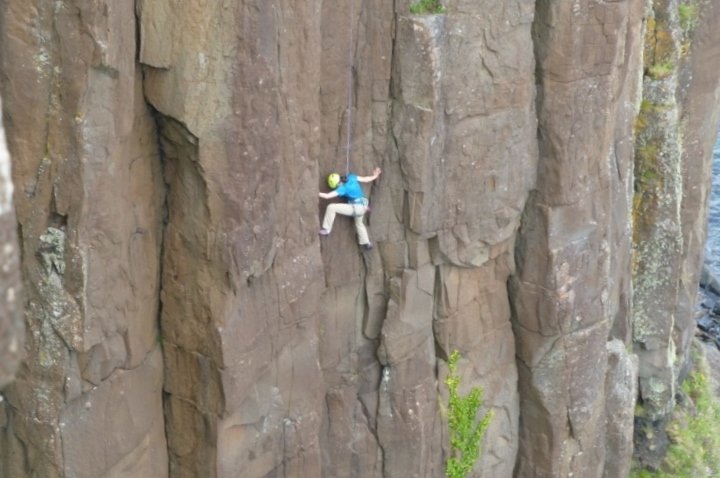 It’s also really hard to grade with absolutely enormous holds all the way. 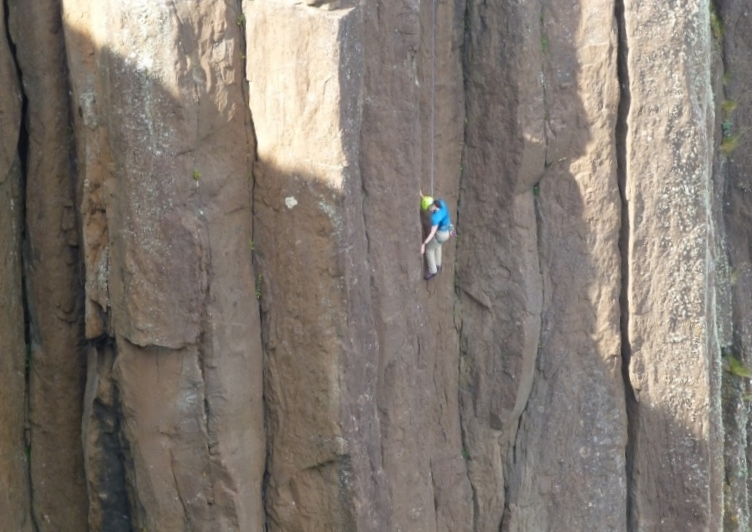 Although generally considered low in the E4 grade the position is uttelry wild. 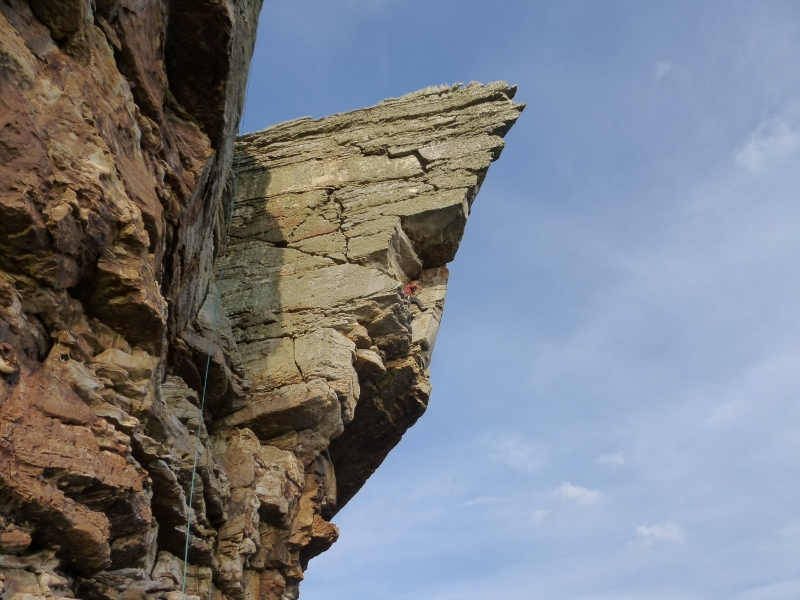 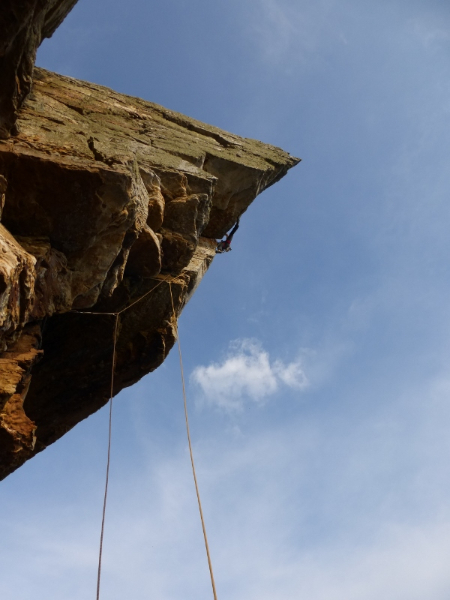 Samurai Groove is another wildly overhanging route on big holds in North Wales and graded E3 5c. 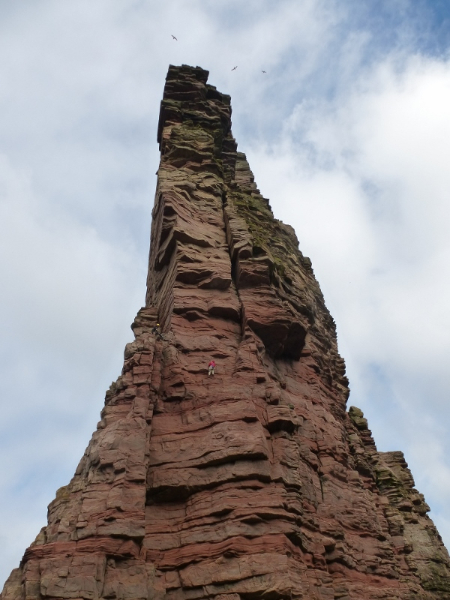 I’d climbed it probably only 3 years before my first time on Mother’s Pride and remember clocking the Elgol route as distinctly more outrageous. 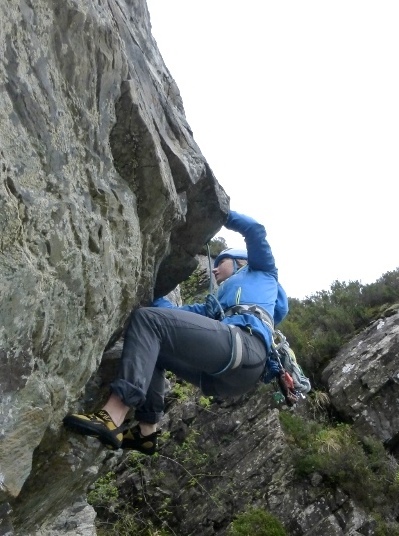 If you are feeling very strong and are good at placing your gear you should certainly give it a whirl! 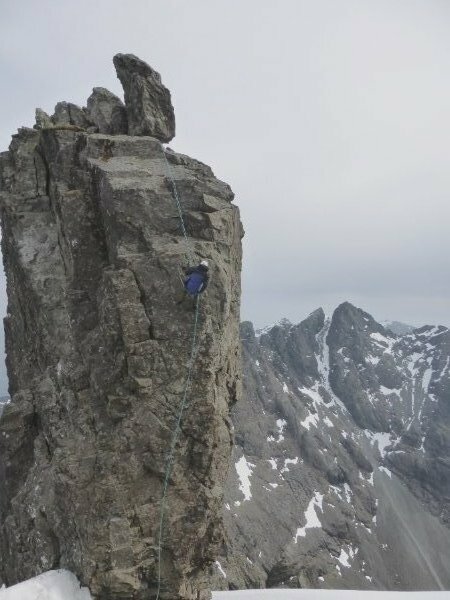 Francis is very strong just now; not only did he pose for a pic at the top but he also climbed back down the final few metres for an in situ wire once I’d sweated my own way up pumped out of my mind. 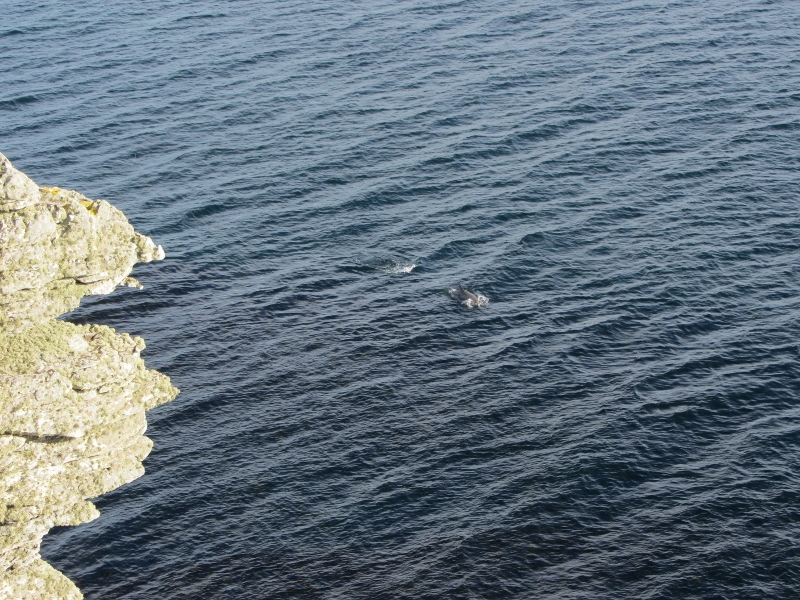 Abi, Ivan, myself & Ally were treated to an incredible dolphin display as we finished our climbing last Saturday. 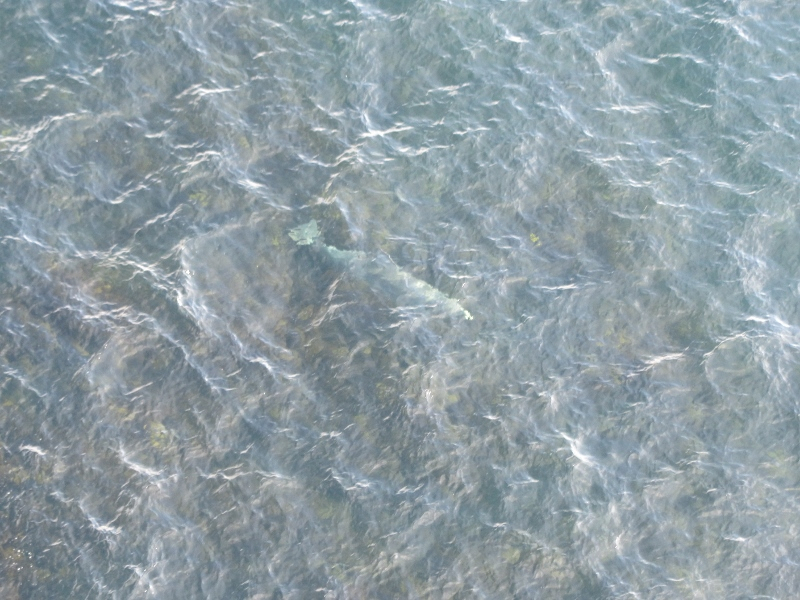 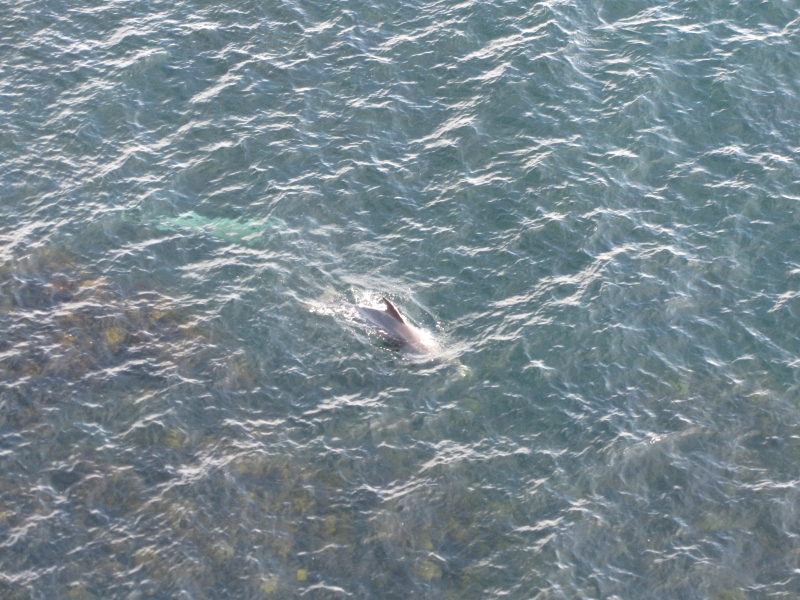 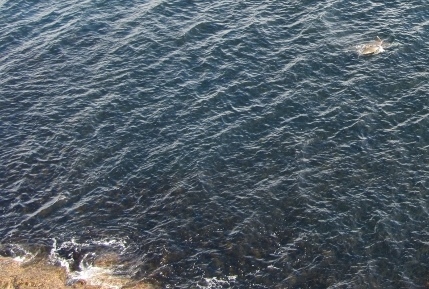 For more than half an hour a huge pod of bottle-nose dolphins headed around the bay, right under the cliffs and around into the jetty at Elgol. 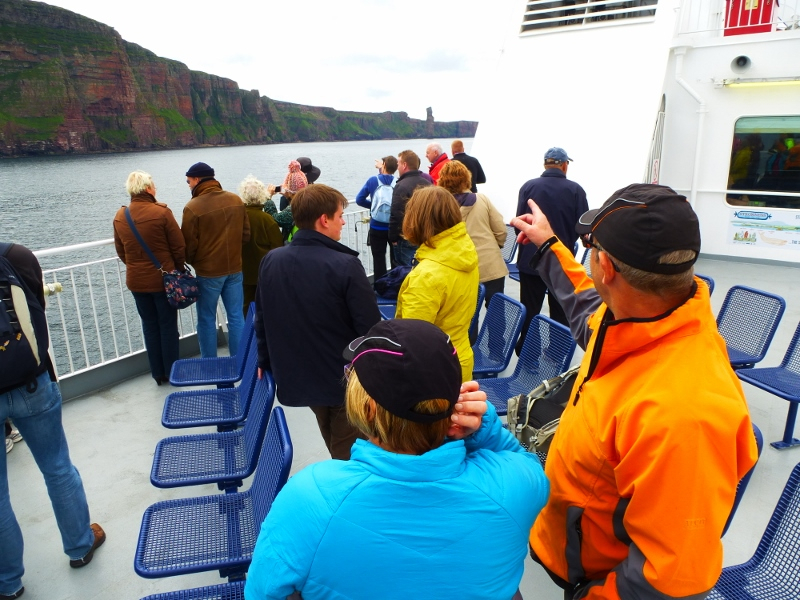 Sharp boat operators were rapidly reopening & filling up with tourists to head out & look as we got back there. 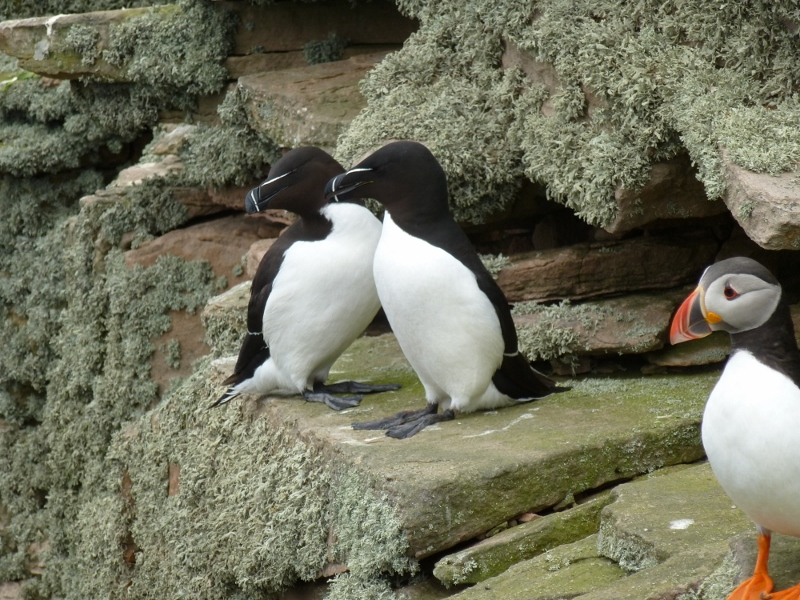 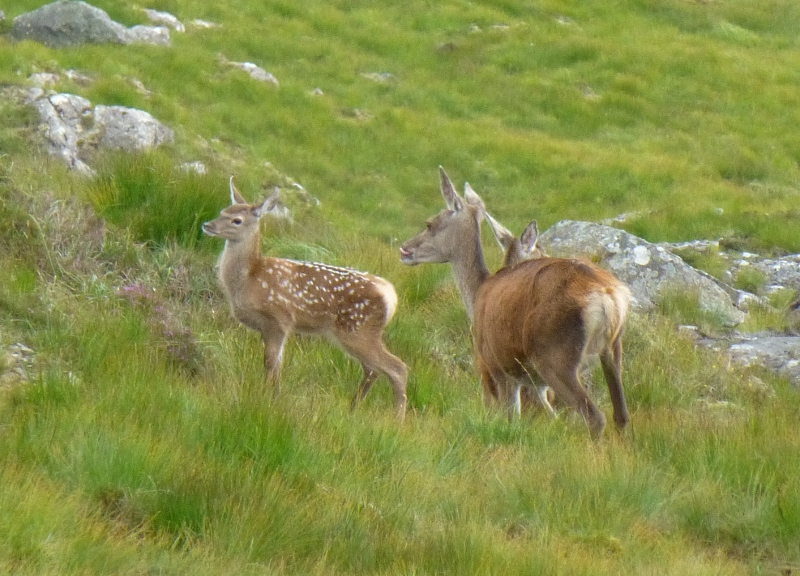 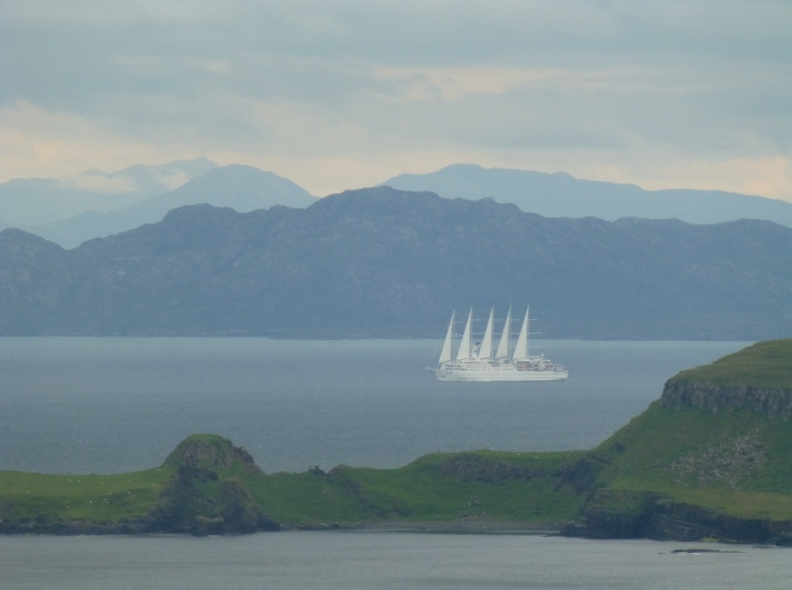 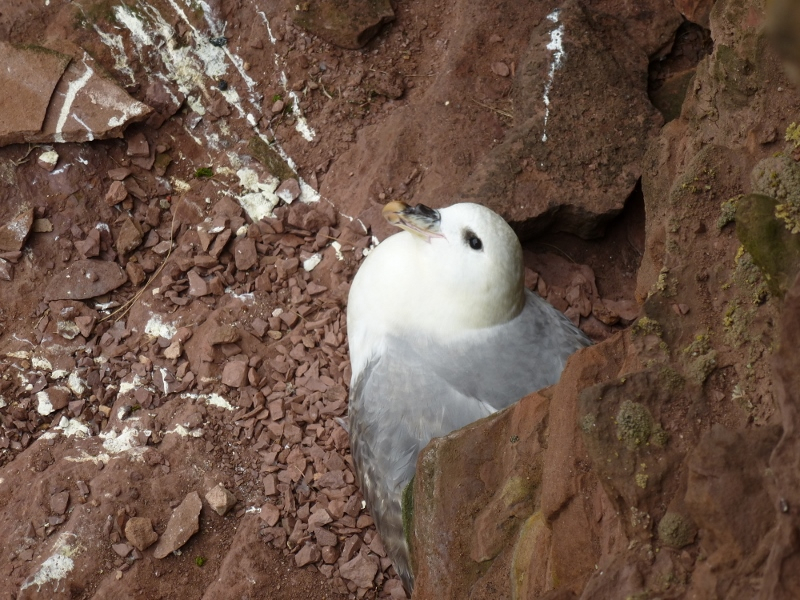 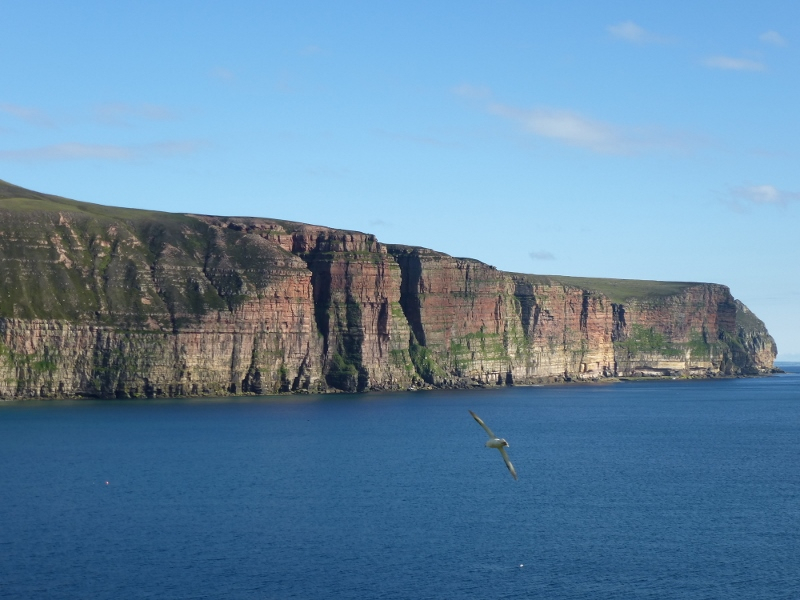 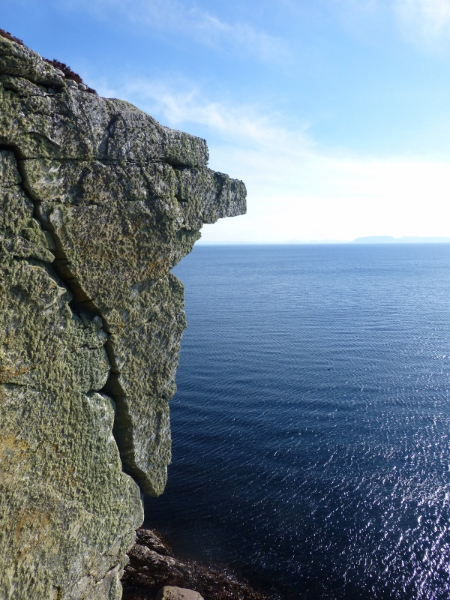 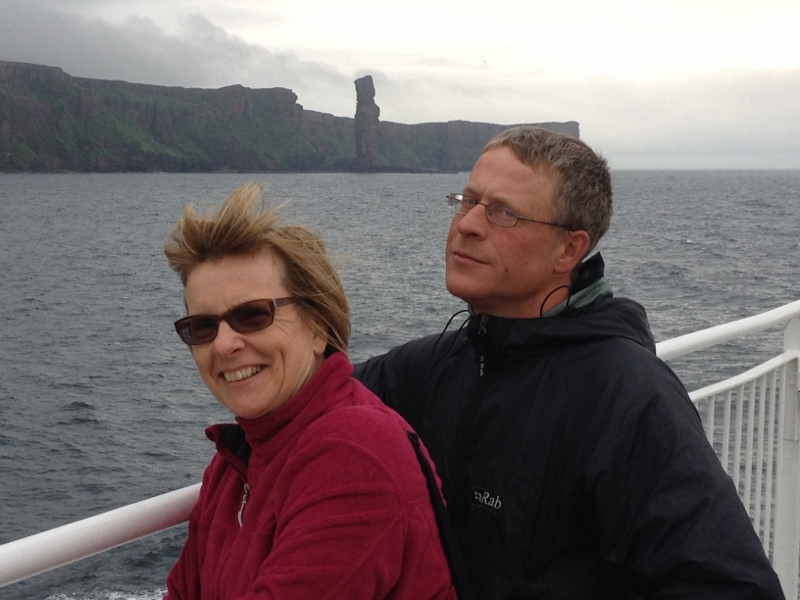 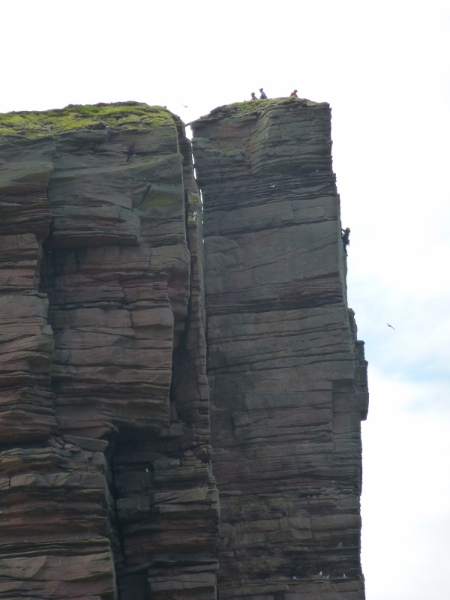 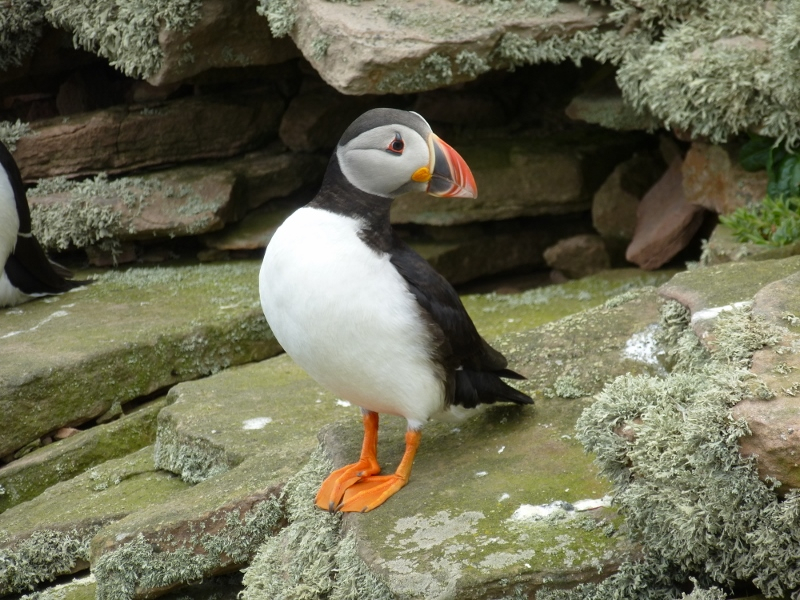 This is the first time I’ve seen them close up to the cliffs in many years and a real privilege. 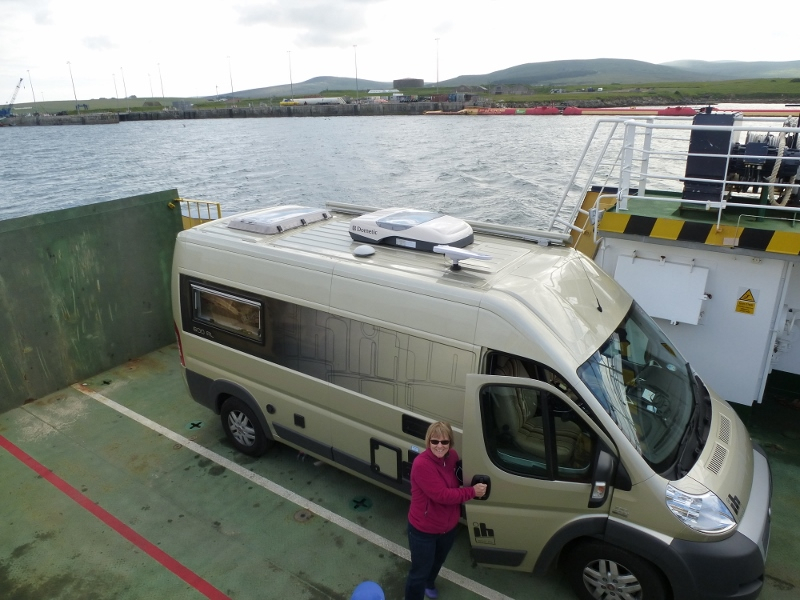 I expect we’ll just have to cope with the normal otters, basking sharks and occasional minke whales for the rest of the season but you never know. 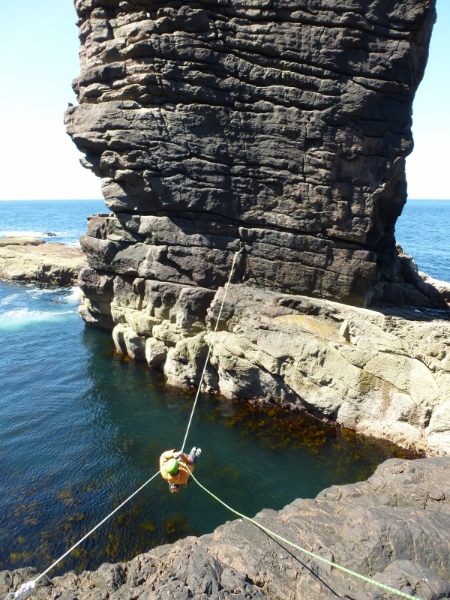 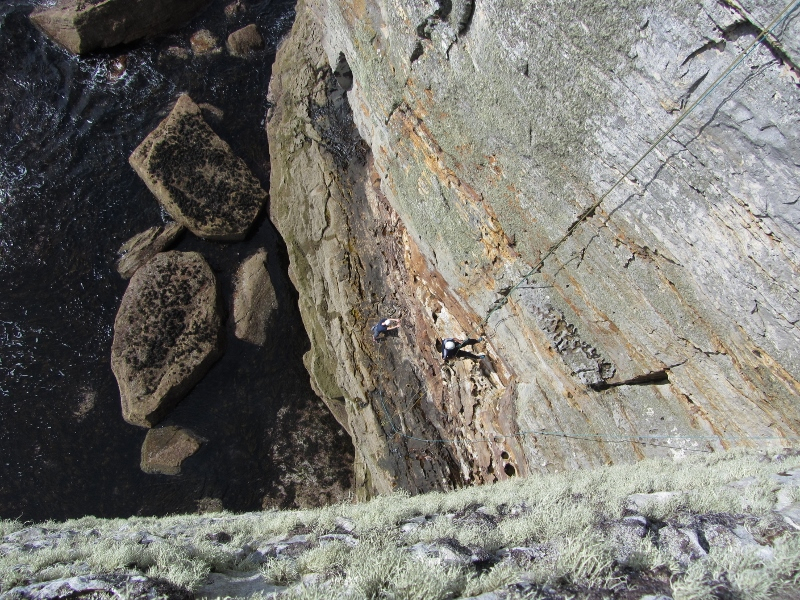 Ivan & Abi had only done a small amount of outdoor climbing before but progressed rapidly with a grand finale on Jamie Jampot. 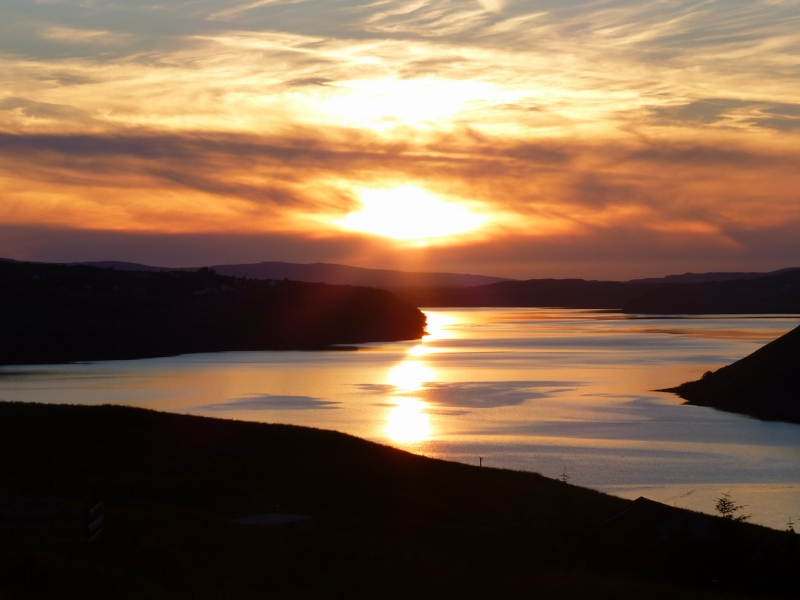 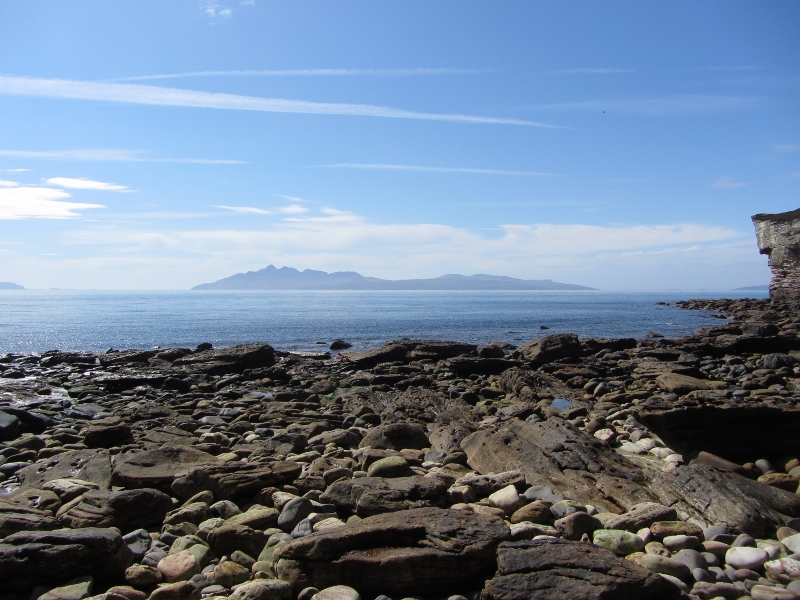 The weather has been treating us all fantastically right through Easter and looks set to continue. 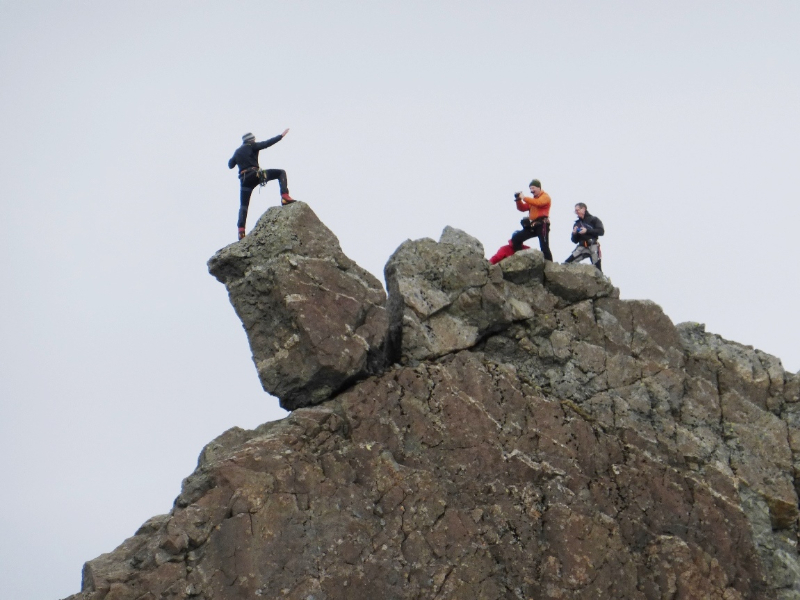 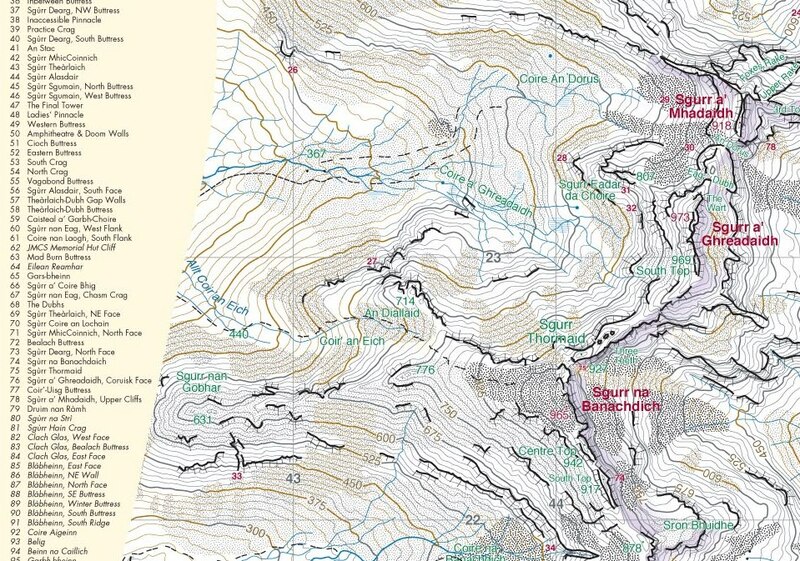 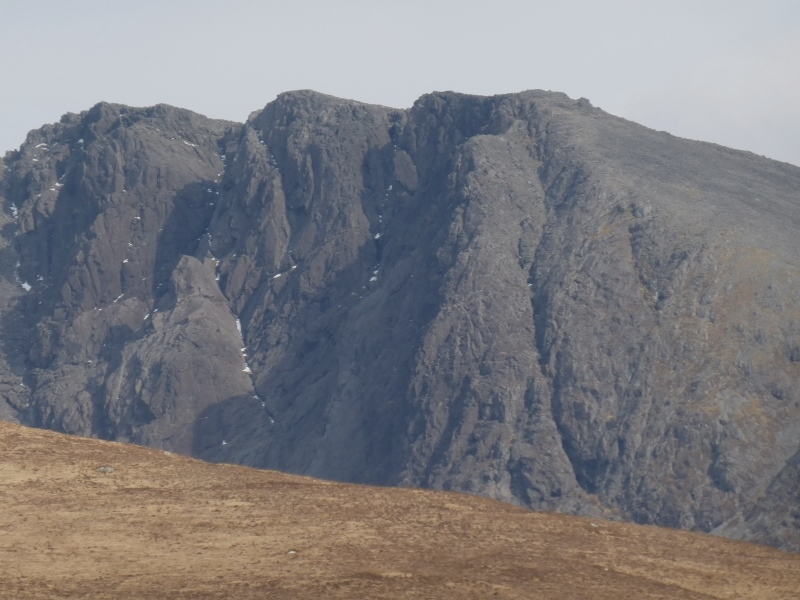 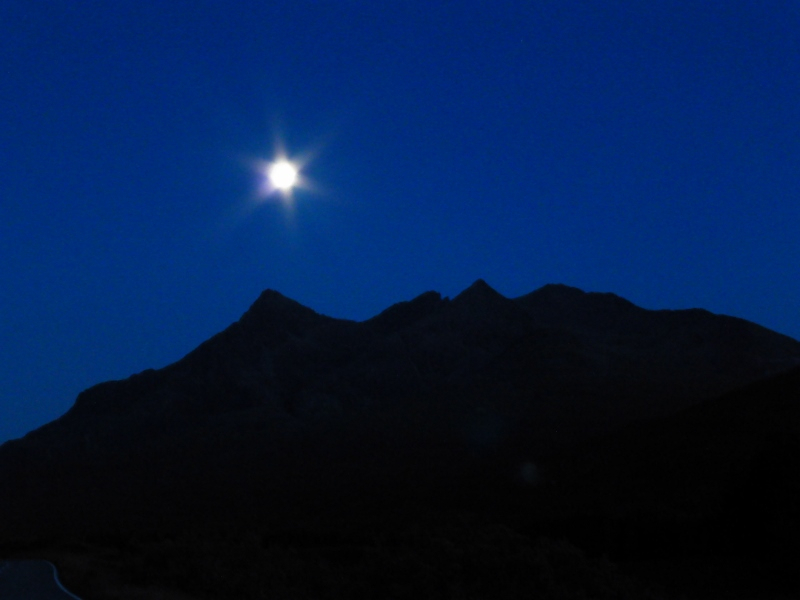 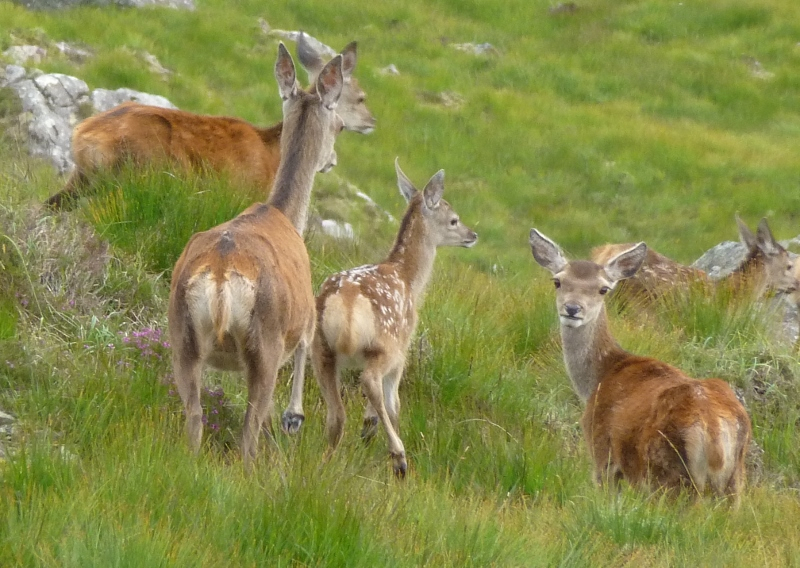 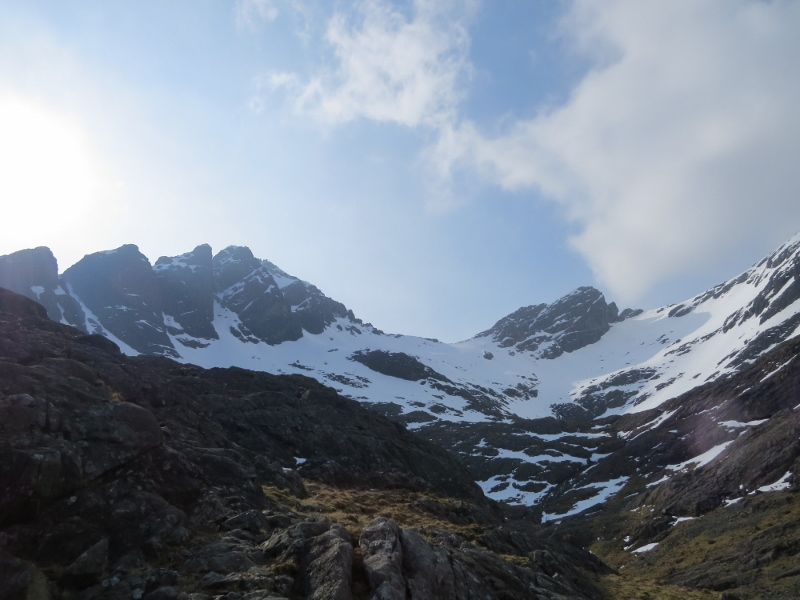 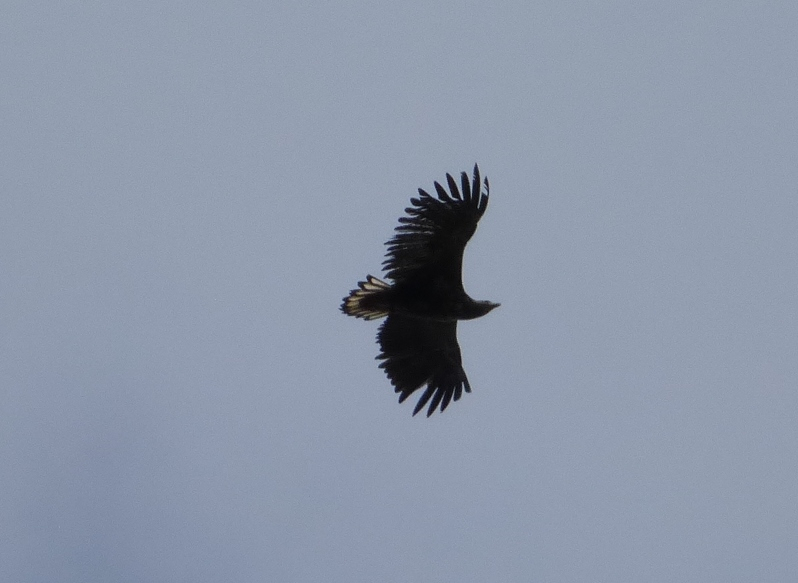 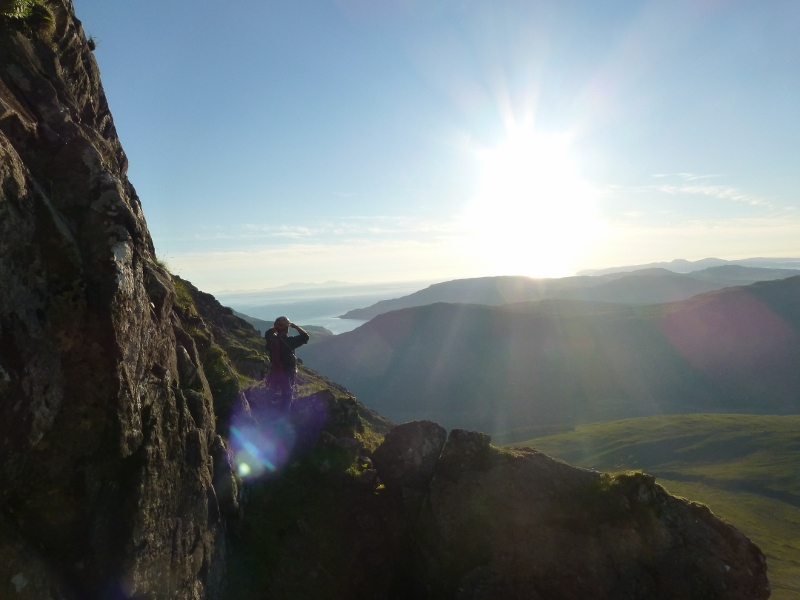 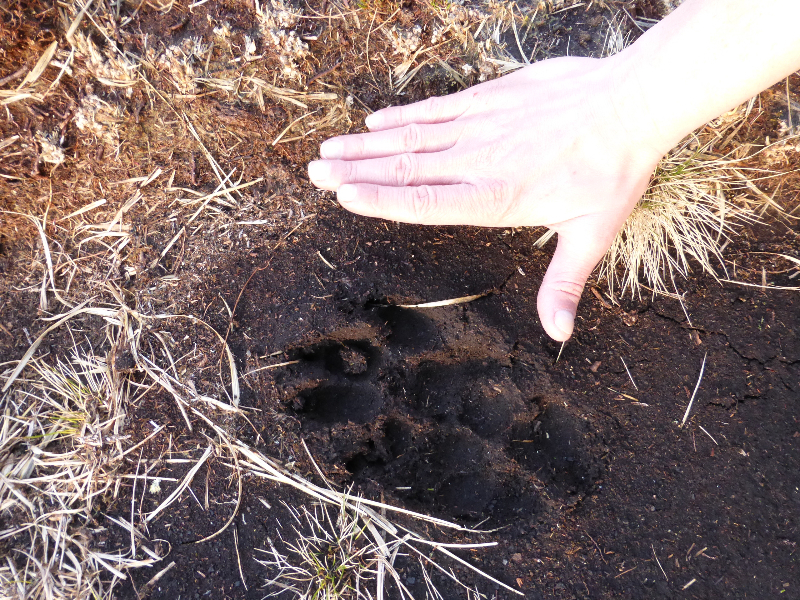 Blog Backlog & Bla Bheinn footpath funding success. 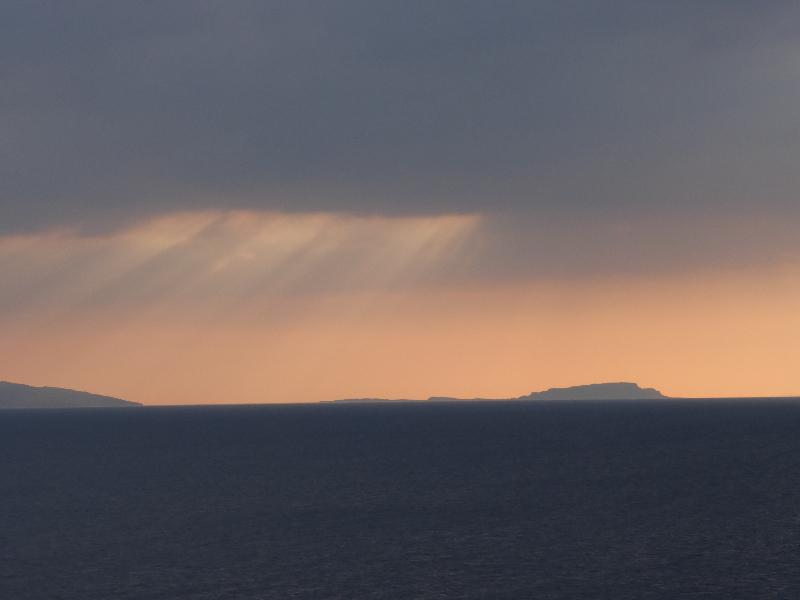 Sorry about the radio silence but blogging is the lowest priority when life gets hectic I’m afraid. 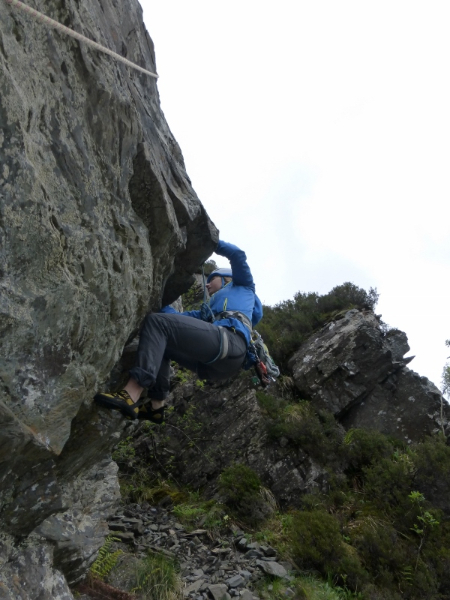 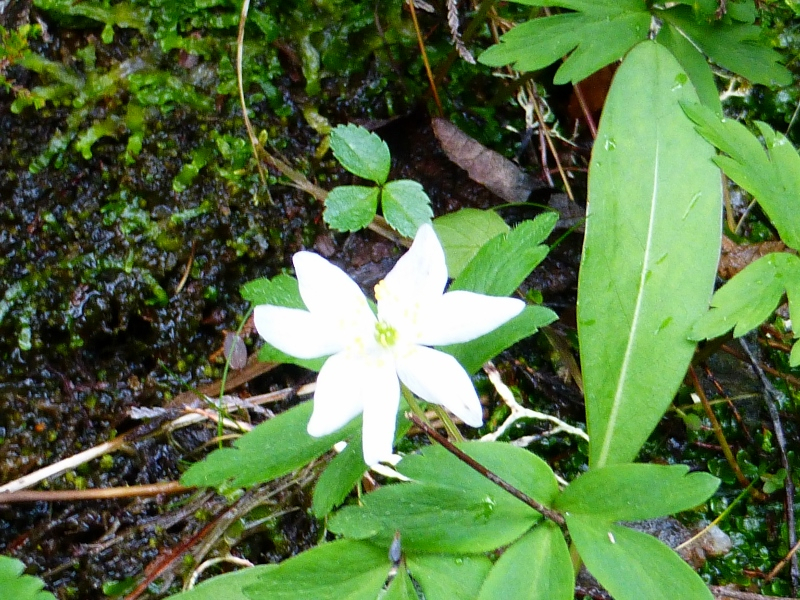 Last week the weather improved drastically and I enjoyed getting out 7 days out of 8. 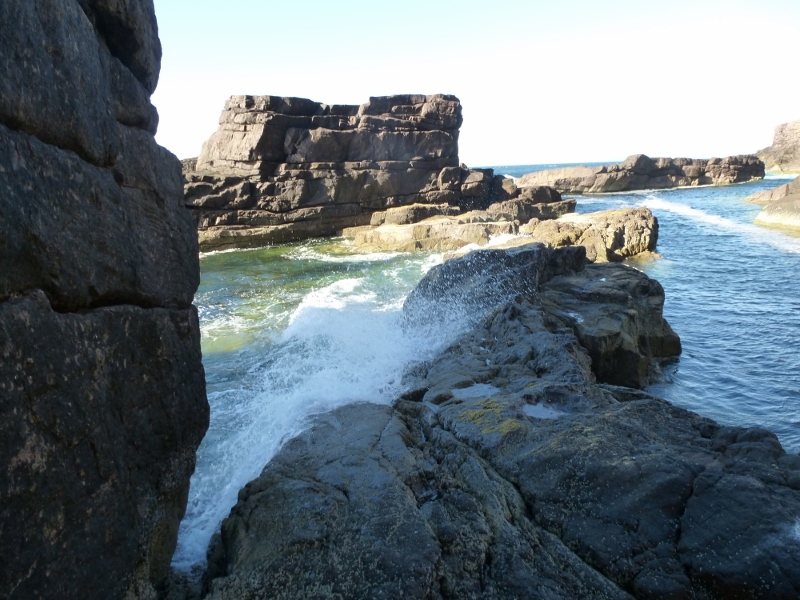 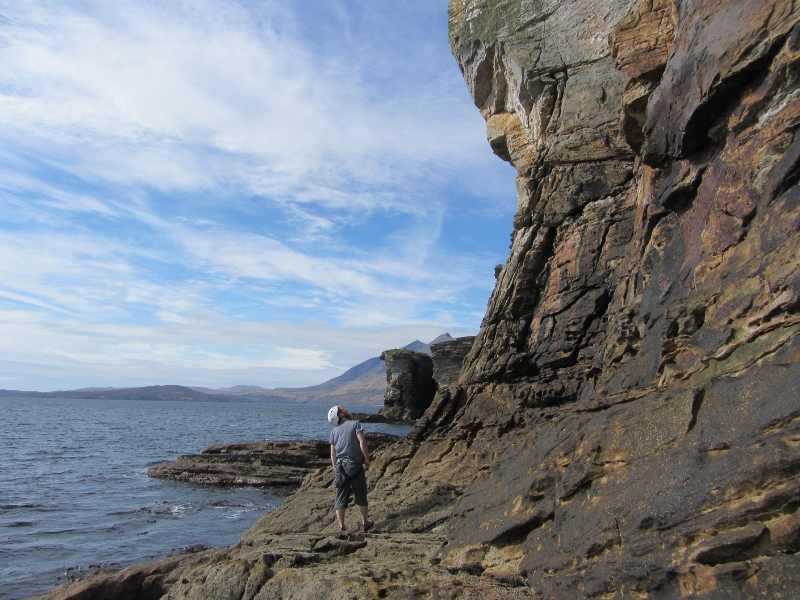 Back to hot rock fun at Elgol; ye ha! They were all great outings but highlights included finally placing an icescrew (1st time in the Cuillin this winter), meeting a couple of Italian guides at the Pinn who were up as guests of Al Todd (who skied the Great Stone Shoot this year) and a couple of hot days on the wonderful cliffs at Elgol (see videos on the Skye Guides Mountaineering Face Book page- I’ve put a selection of galleries below from most days. 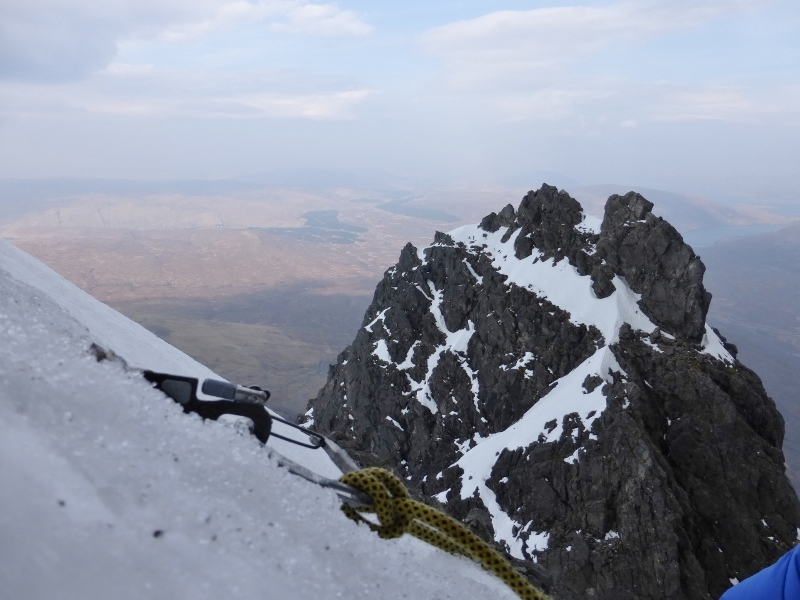 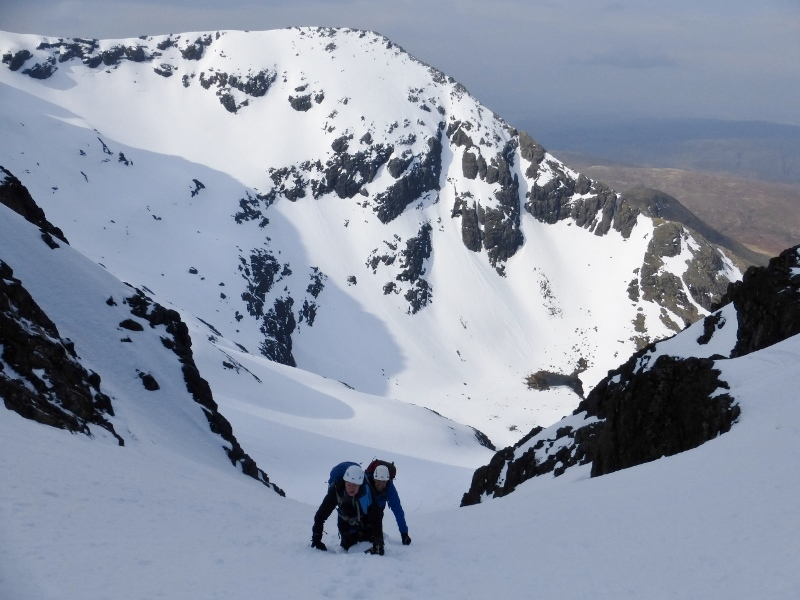 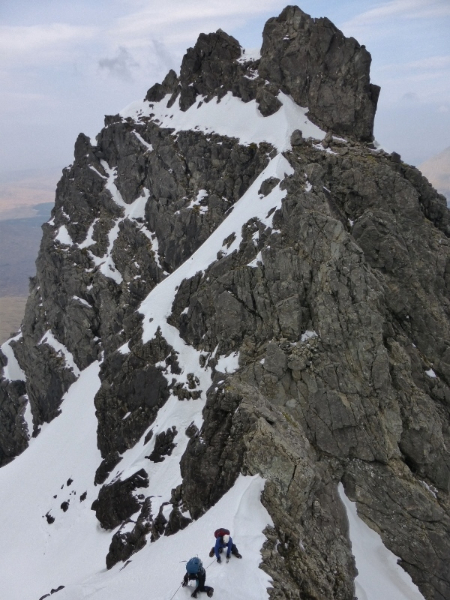 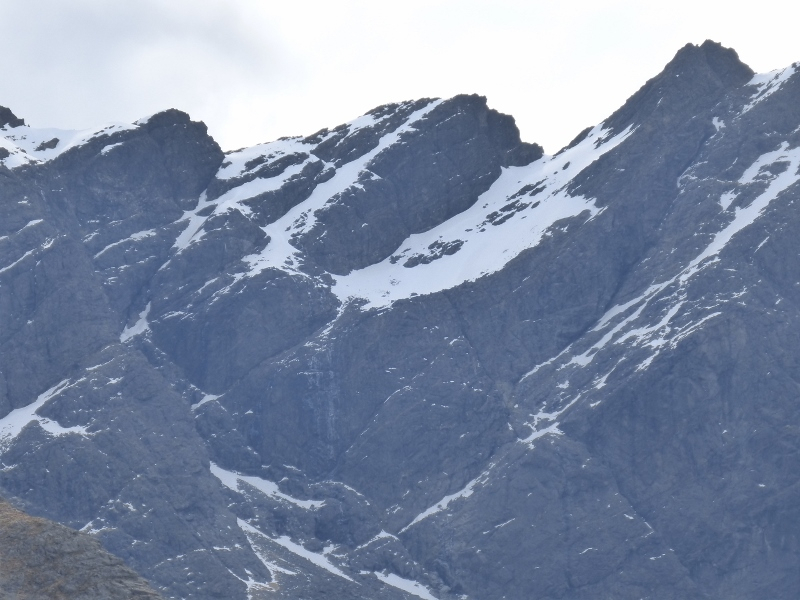 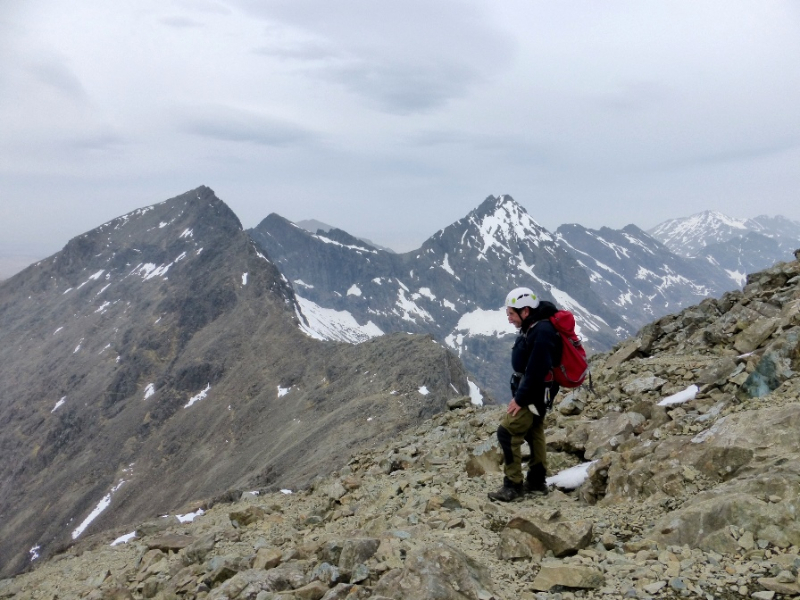 Conditions have warmed up considerably but you’ll see great quantities of snow on the northern Cuillin (Pinnacle Ridge gallery below) which I would guess will be with us until about late May. 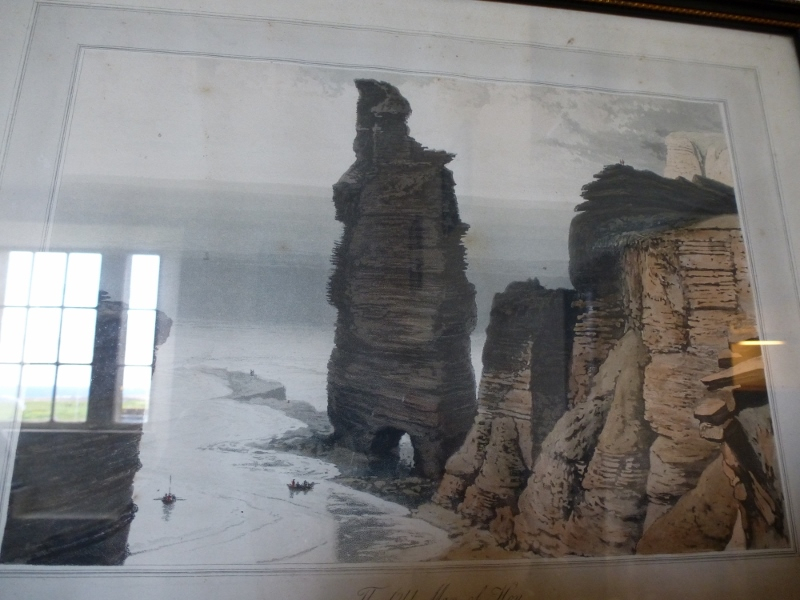 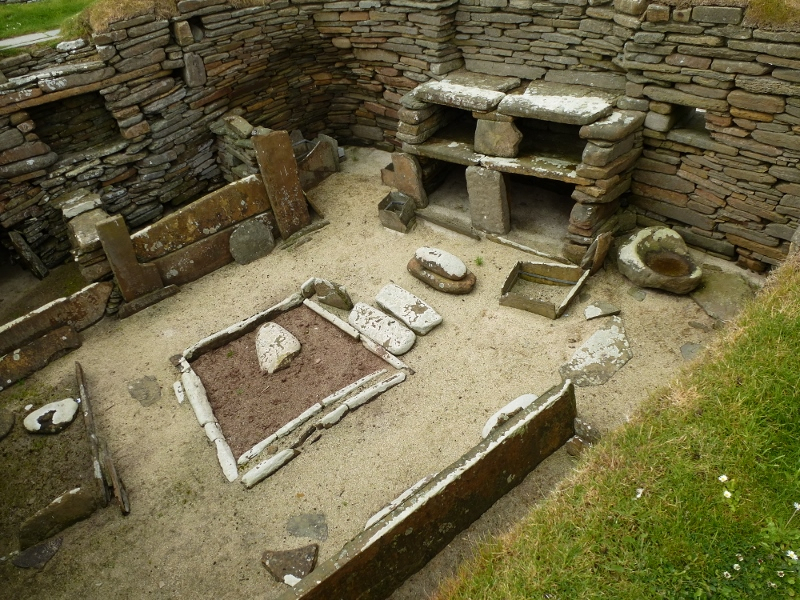 Elsewhere the only serious quantities are leading up to An Dorus and a small amount left in the Great Stone Shoot (pic in Italian invasion gallery). 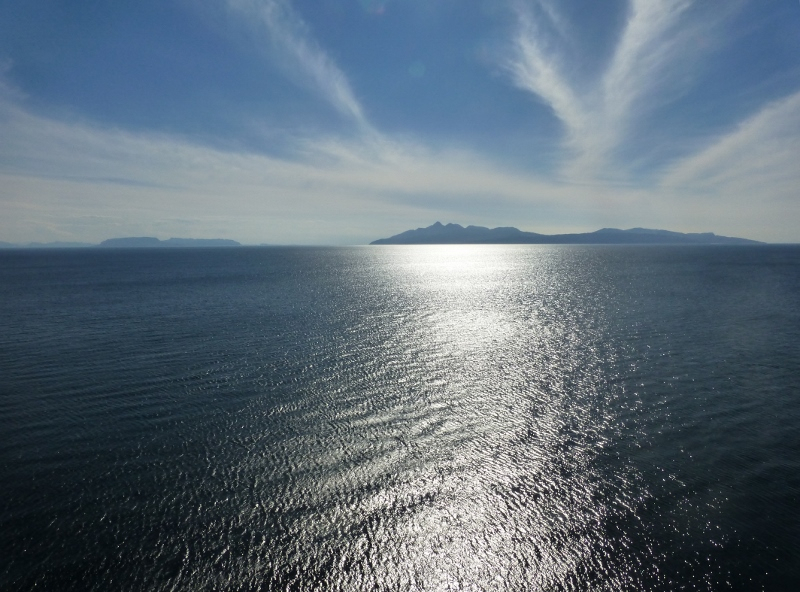 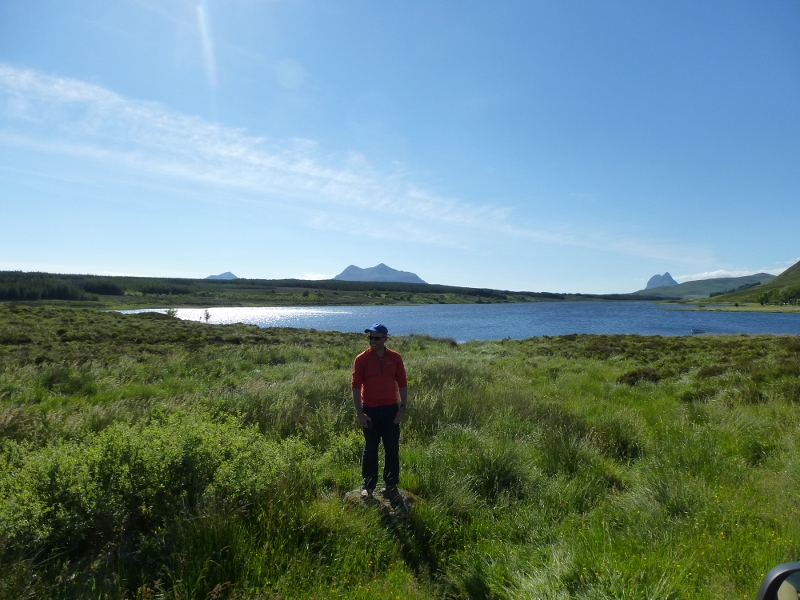 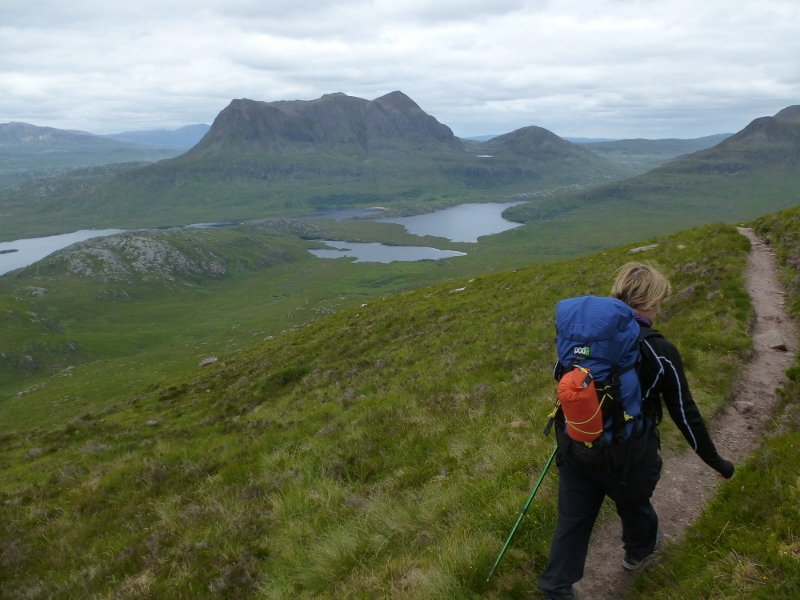 Biggest news of the week was the successful campaign to win £24k of funding to help with the much needed improvements to the Bla Bheinn (Blaven) footpath. 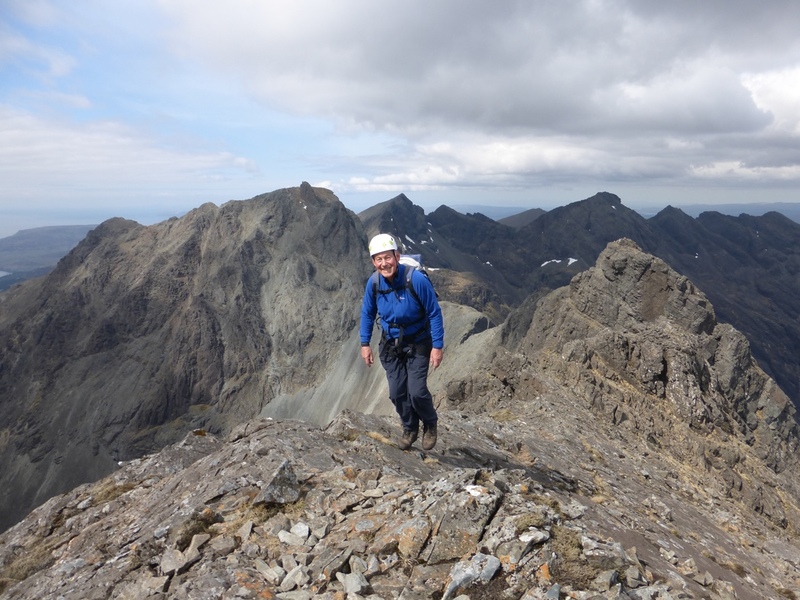 Considerd by many as having the finest views in Scotland Bla Bheinn probably attracts more visitors than any other peak in the Black Cuillin. 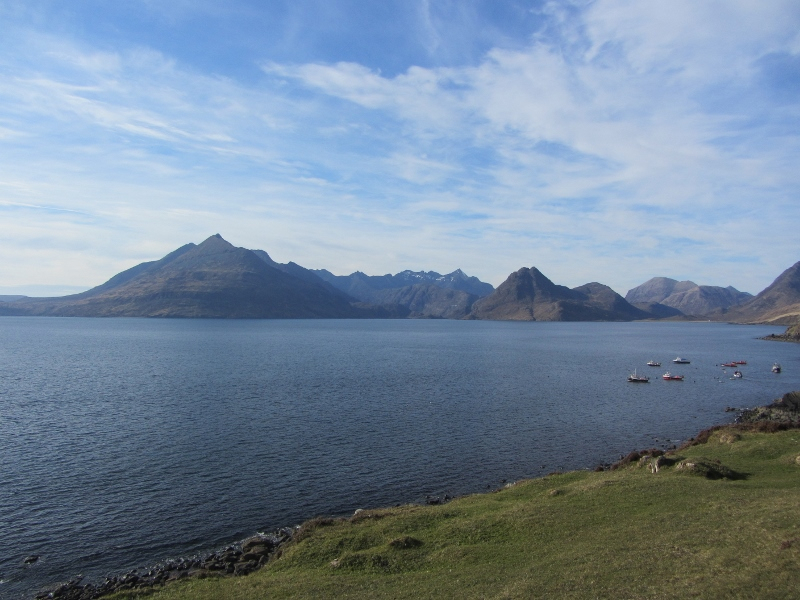 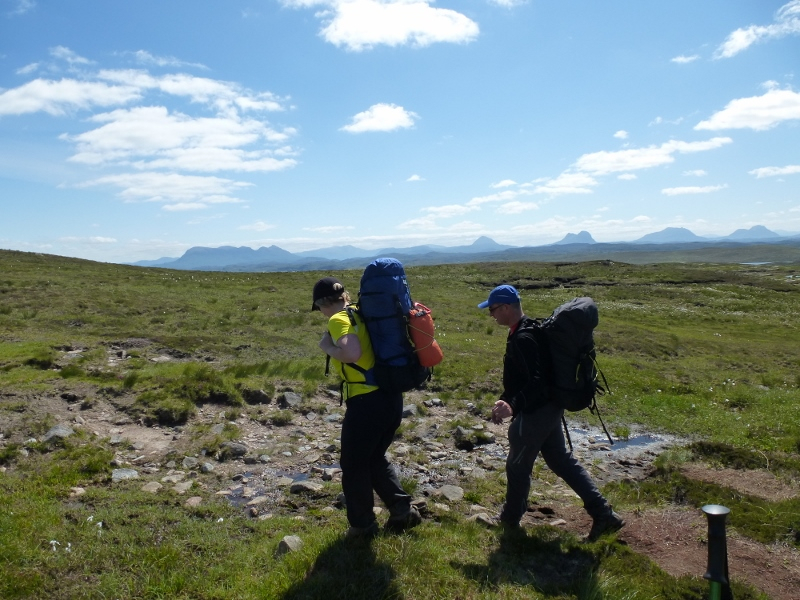 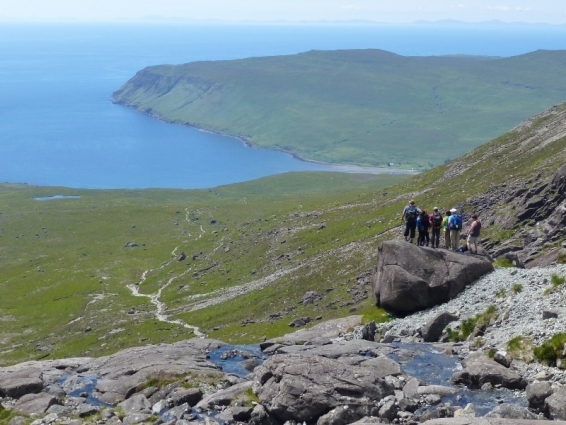 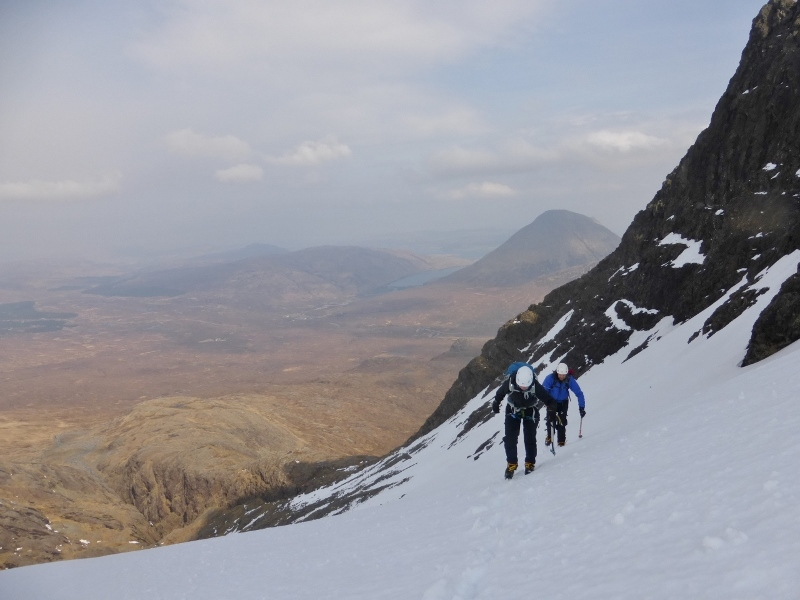 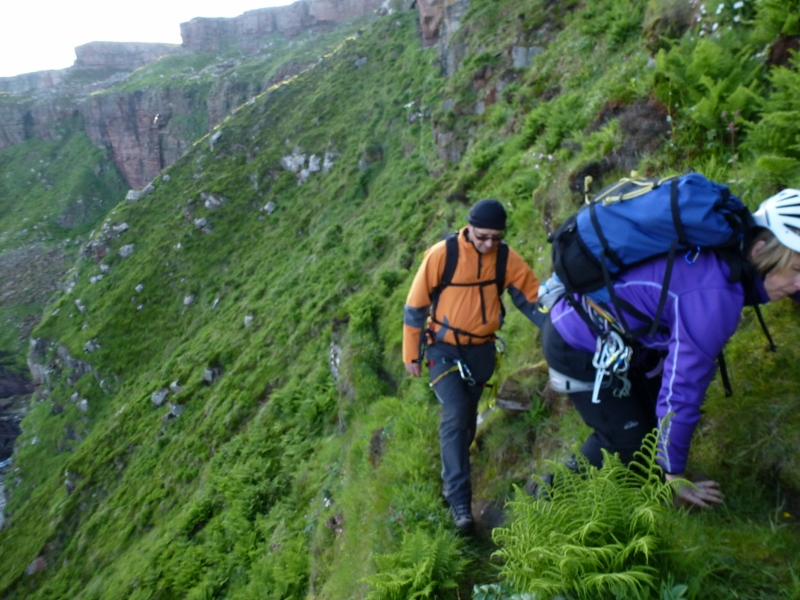 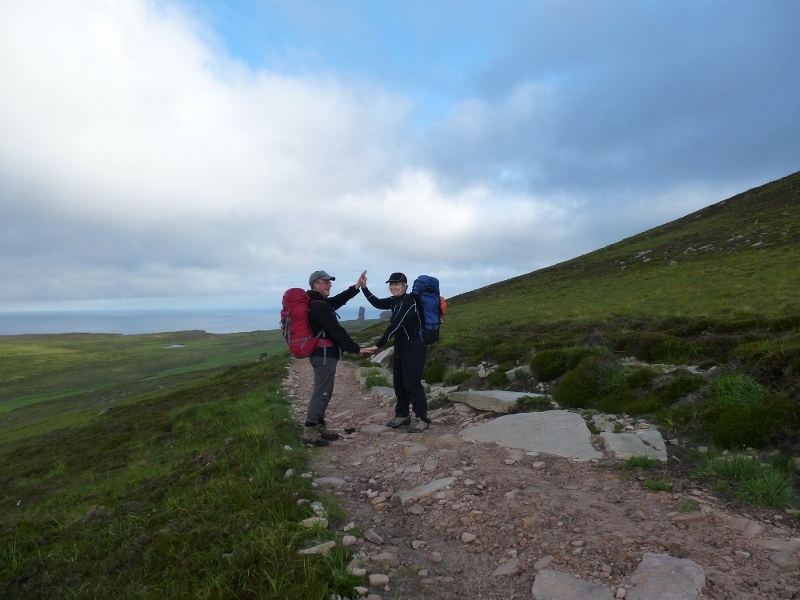 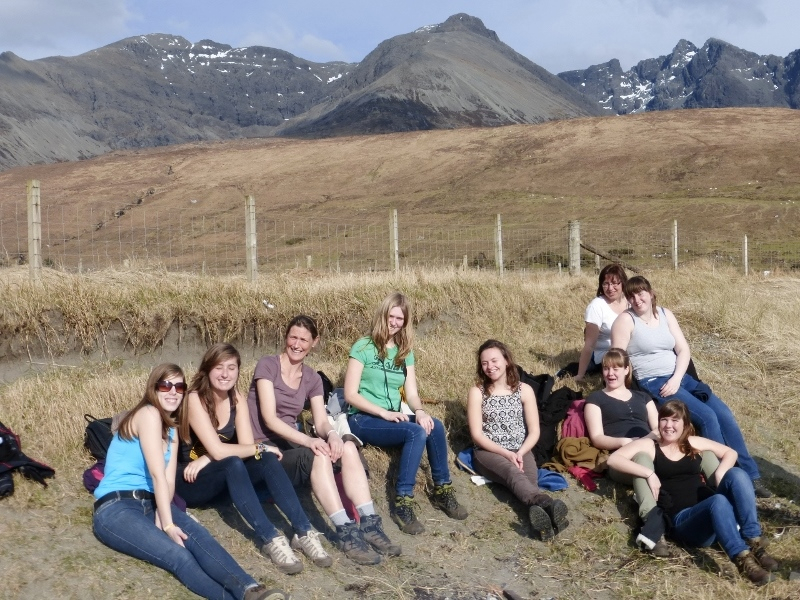 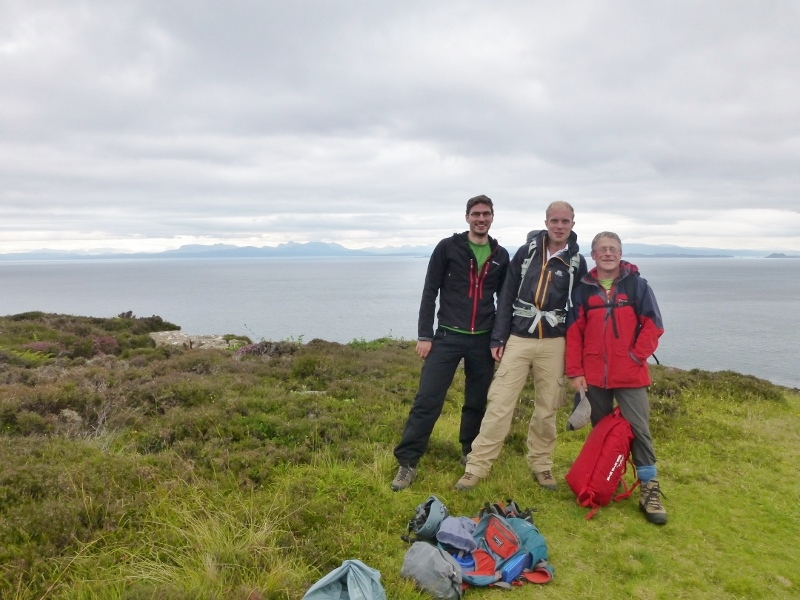 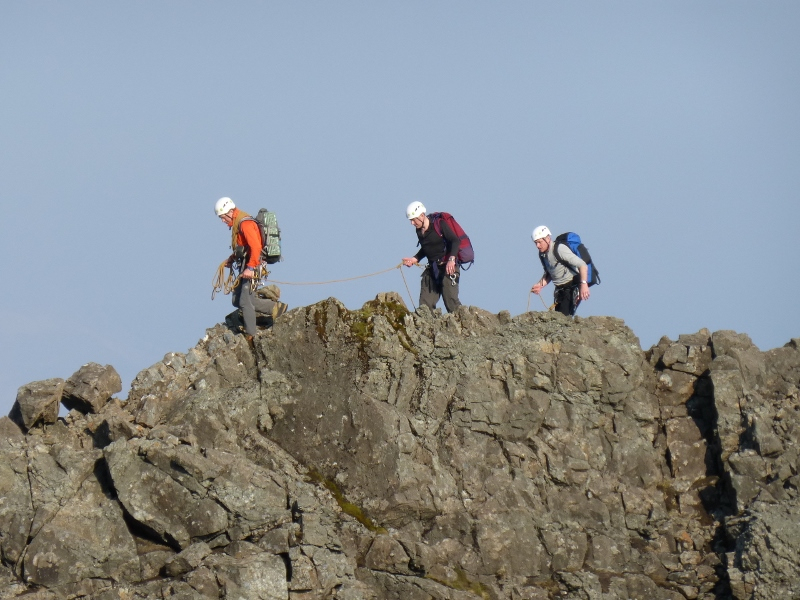 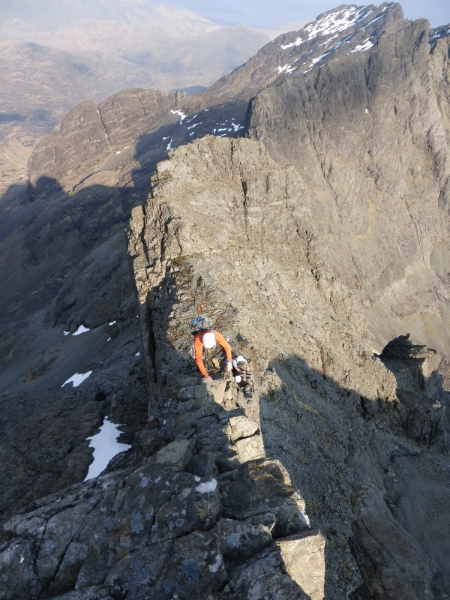 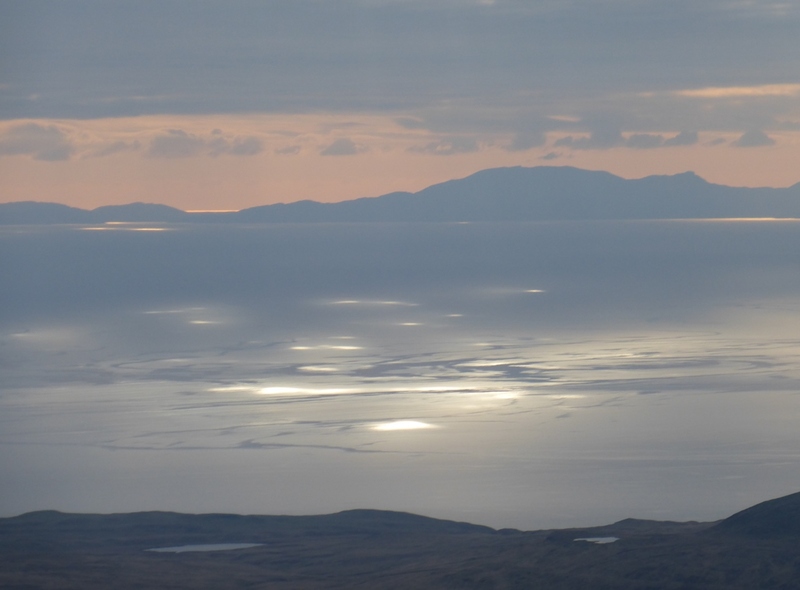 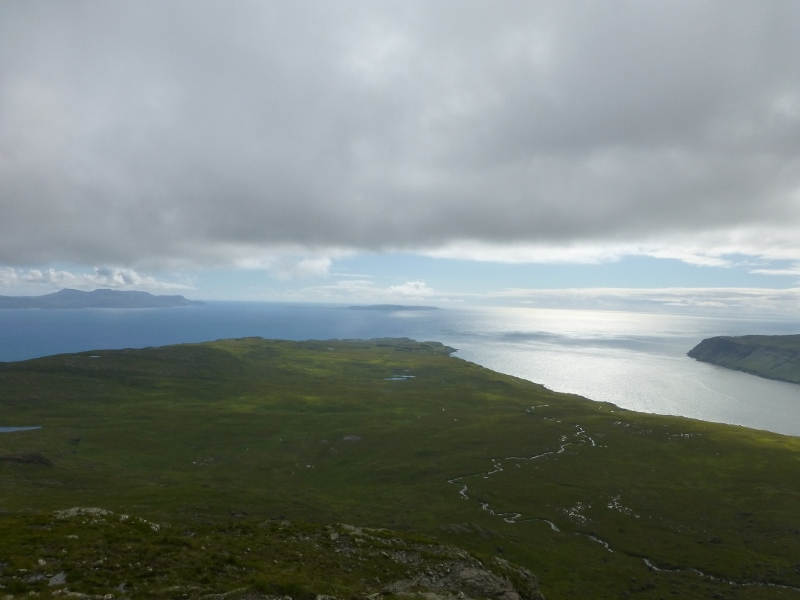 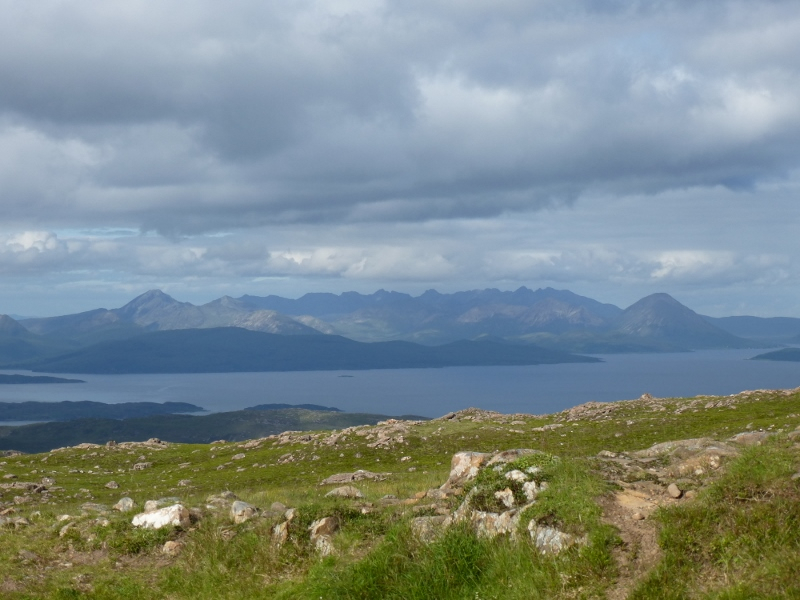 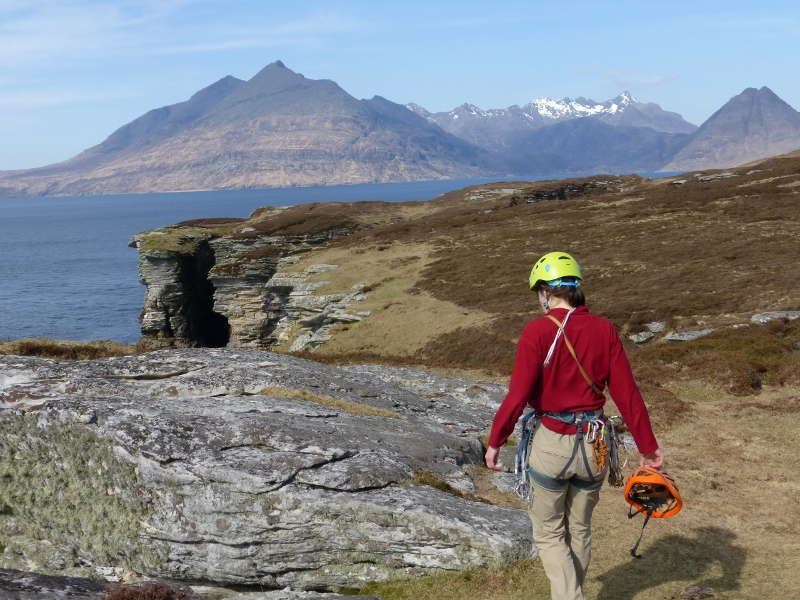 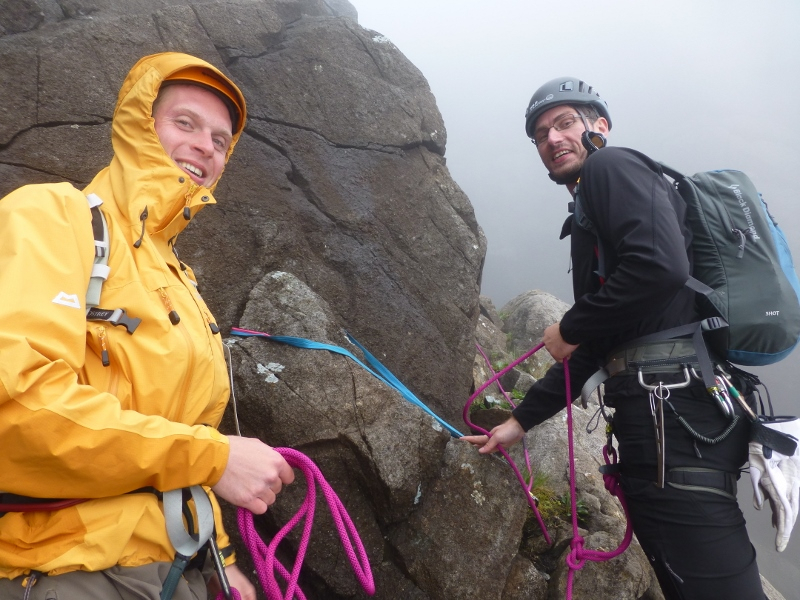 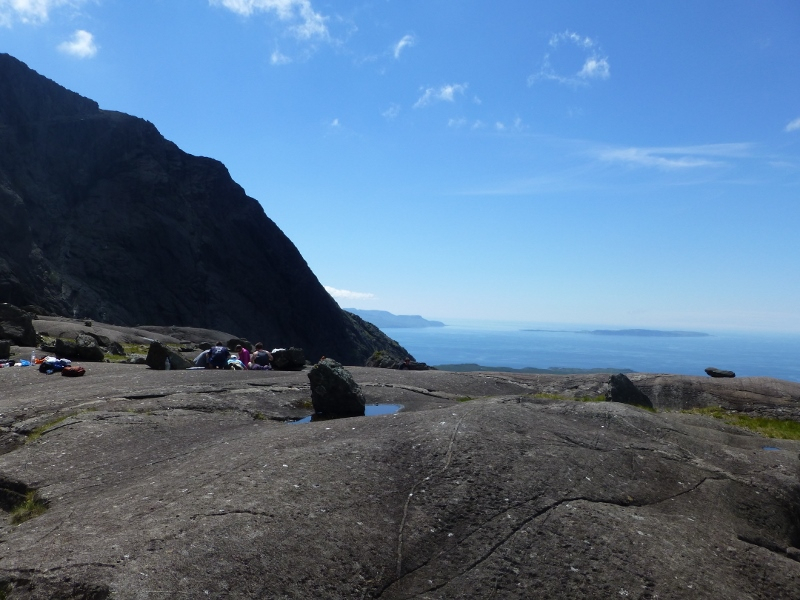 Skye’s Bla Bheinn path repair project has won EOCA’s Alpine category – securing us £24k funding for path repairs! 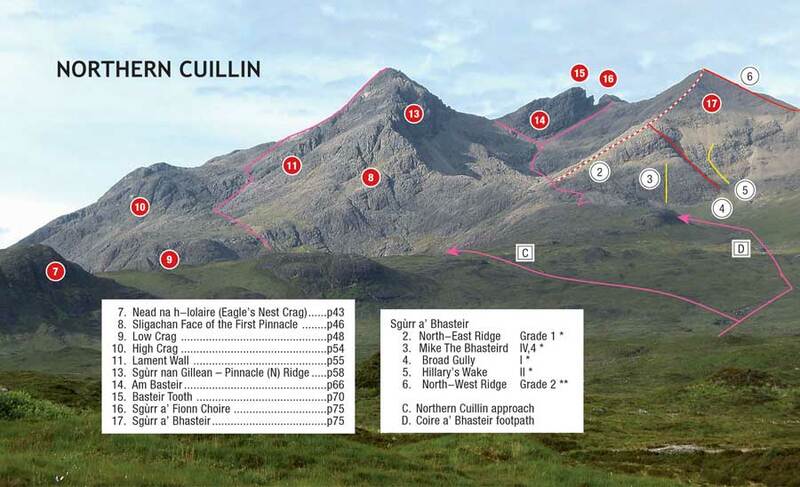 Huge thanks to all who voted. 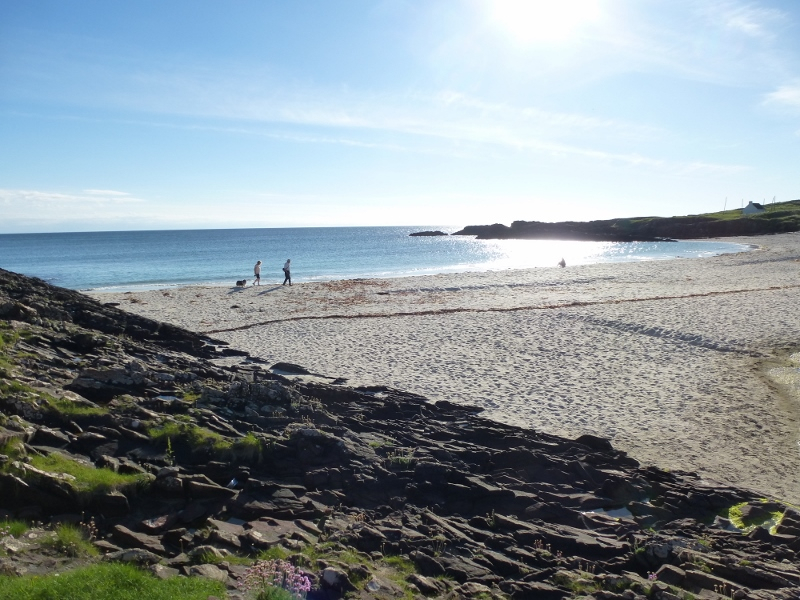 In the office enquiries and bookings flooded in as folk realised that Easter and Spring holidays are fast approaching.